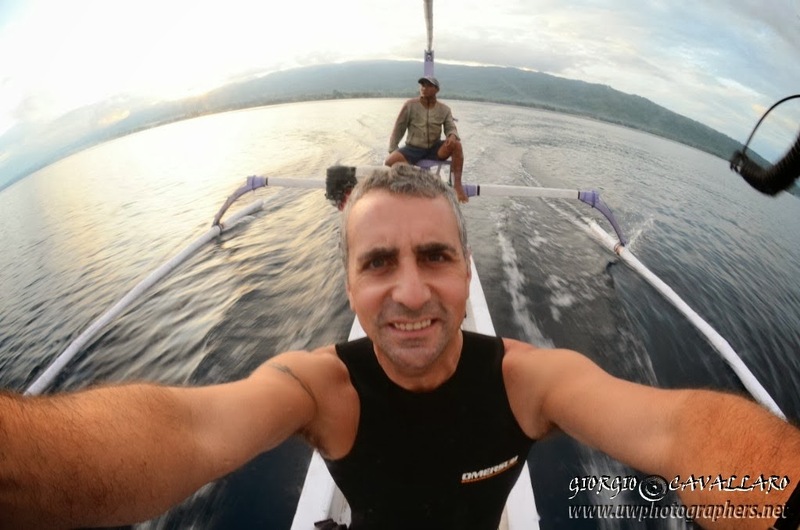 Marco was telling me a lot of stories about Bali being an important biodiversity area, situated between Indian and Pacific Ocean, and about all the beautiful things to do both above and under water. 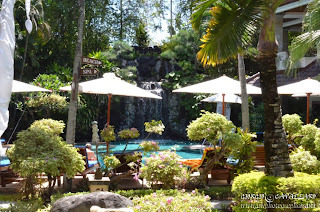 I therefore take the decision of visiting them for such an exotic place and I finally arrive in Bali after a long trip. 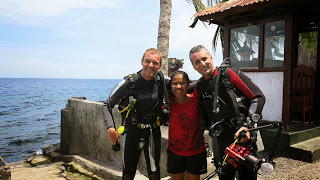 At my arrival, Marco and Riza are already there waiting for me and I'm immediately welcomed by their hospitality. 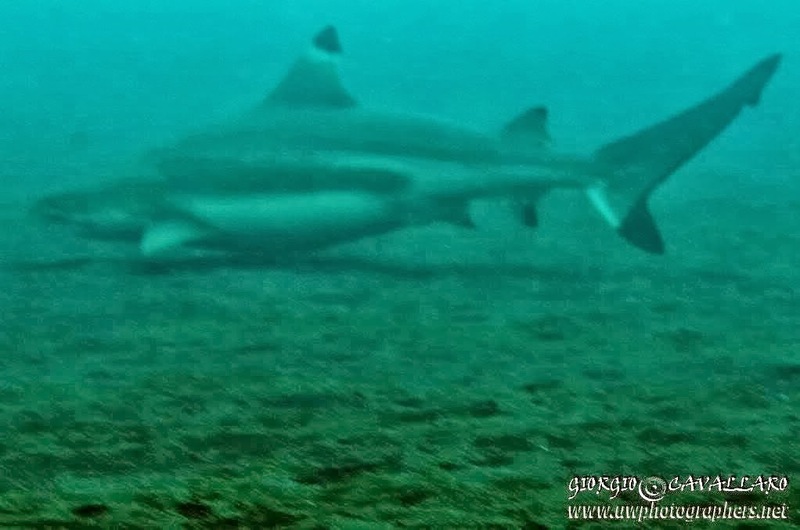 We suddenly become good friends. 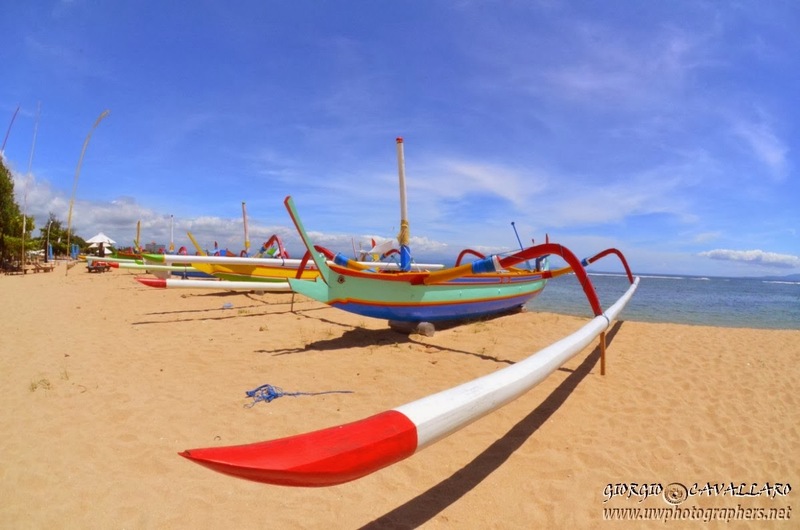 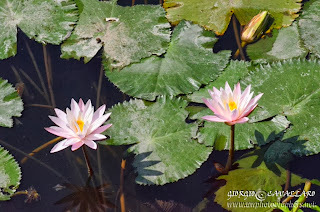 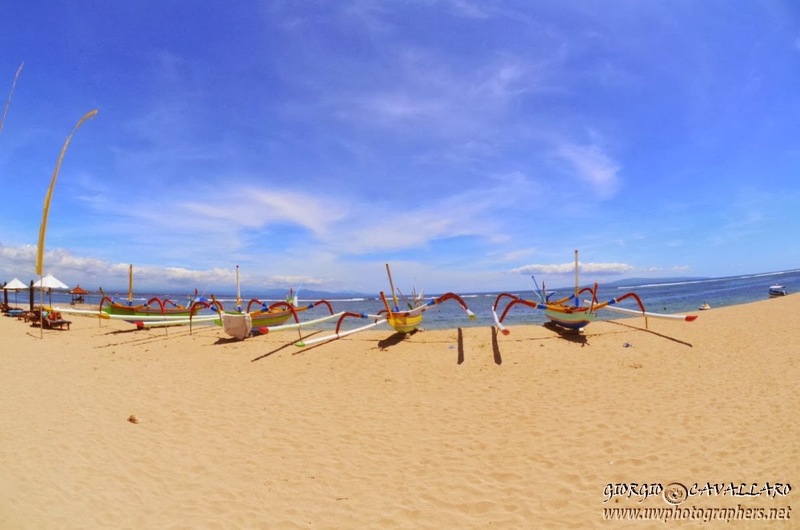 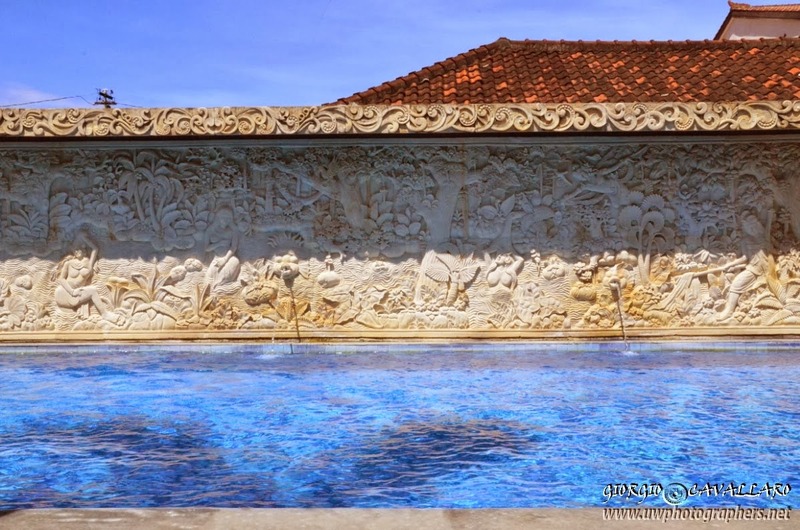 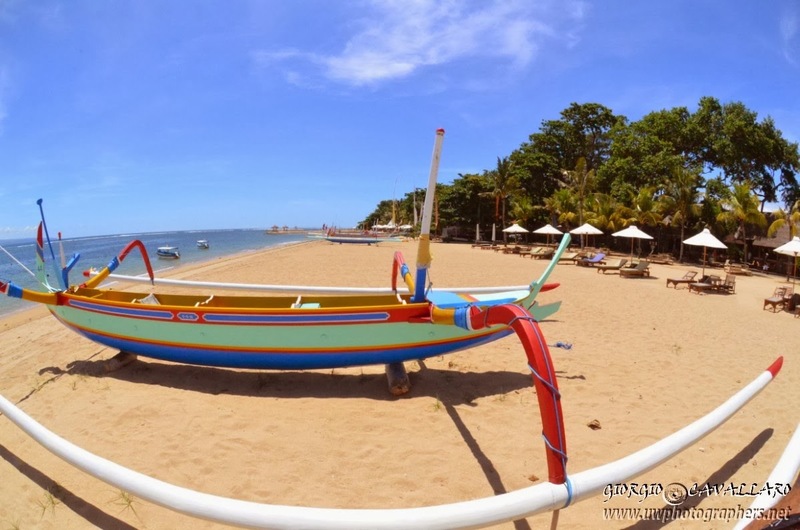 They come with me and bring me to one of several resorts chosen by them and the following morning we have a stroll through Sanur to familiarize with the stunning island landscape and taste local traditions. 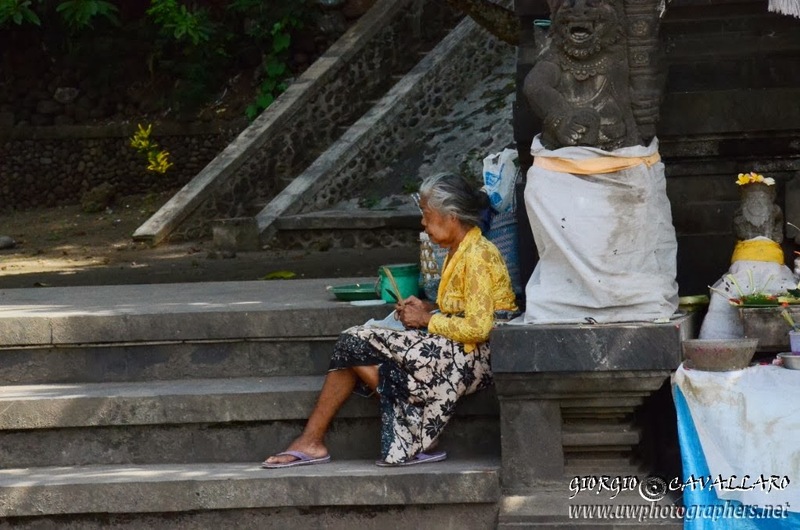 They take this opportunity to explain to me the plan they have studied for me all over my stay in Bali. 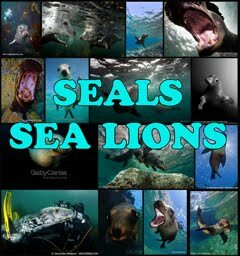 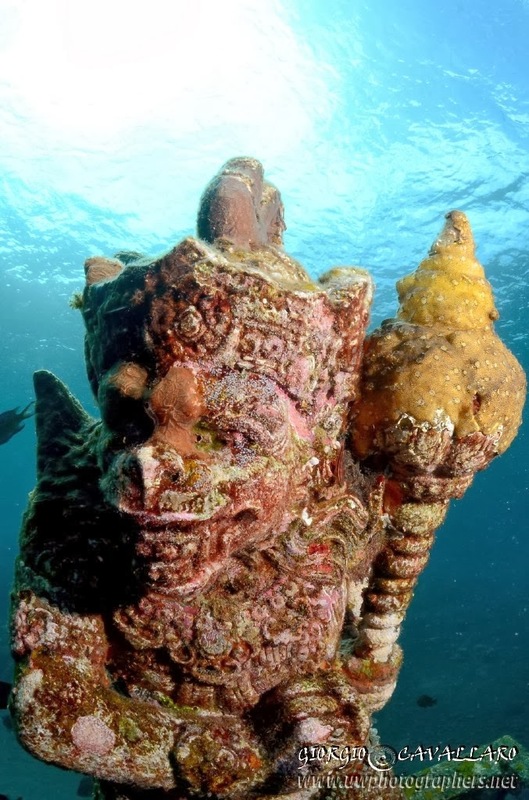 Their concept of "Safari" does not limit to the various dives but includes a full exploration of the island to admire the architectural treasures, the fantastic landscapes and the old traditions and cultures offered by the "Island of Gods". 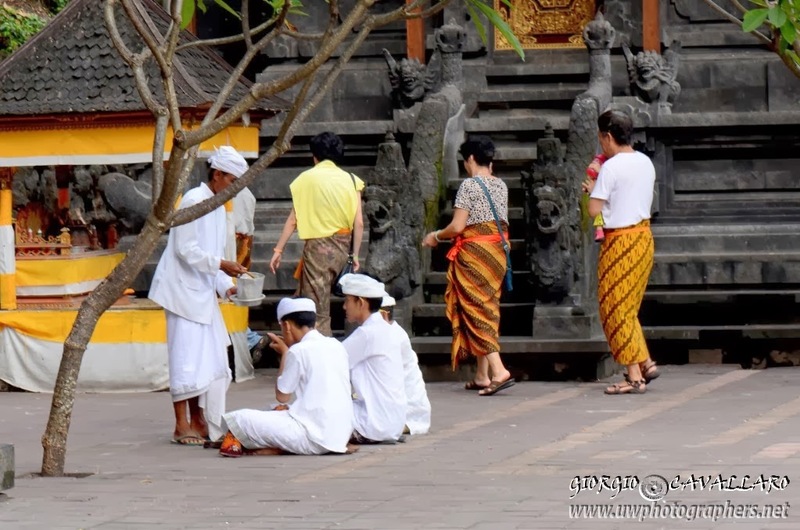 Of course we have a chance of tasting local "delicatessen" which give an idea of the variety of dishes of local cuisine. 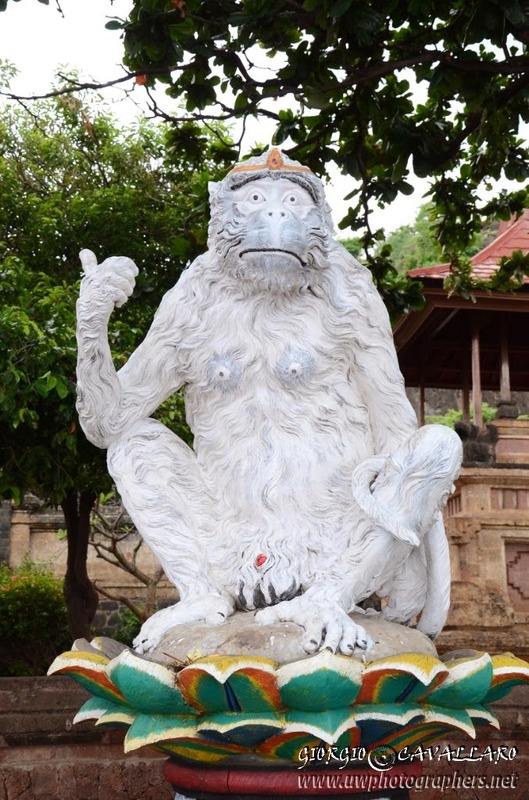 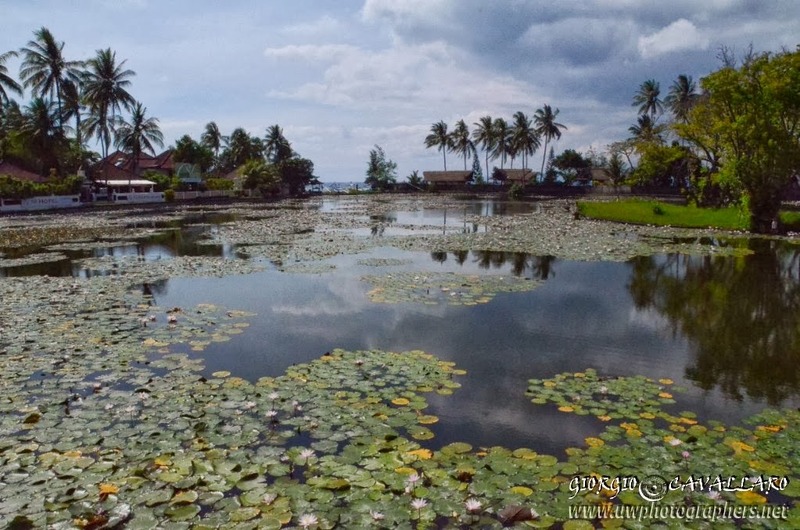 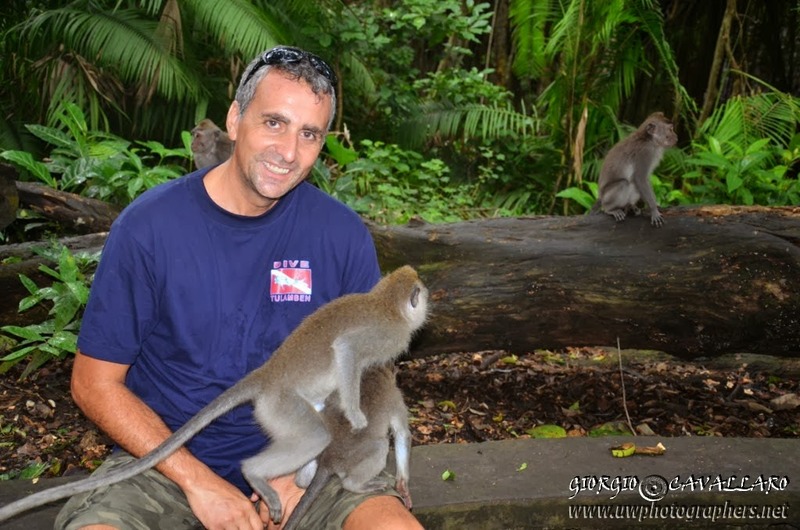 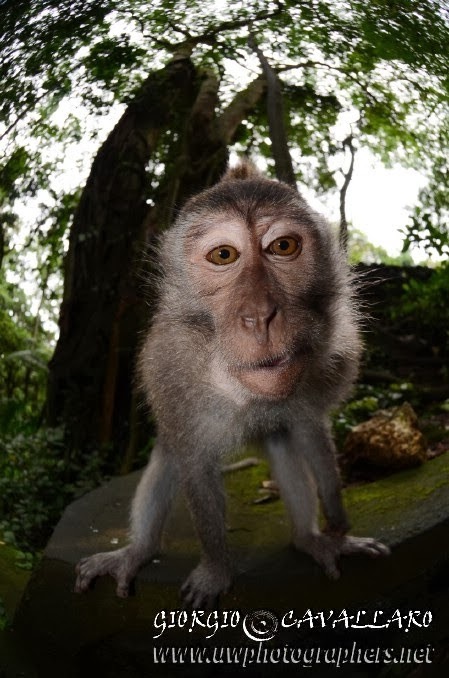 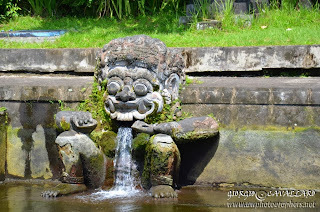 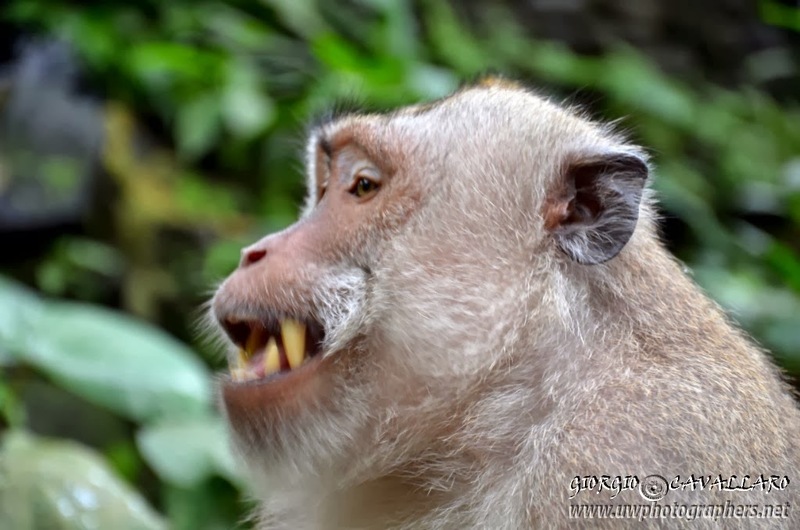 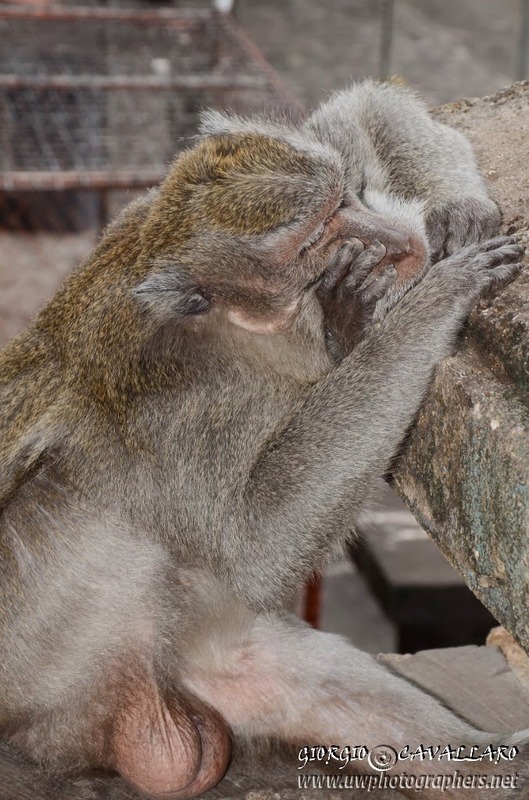 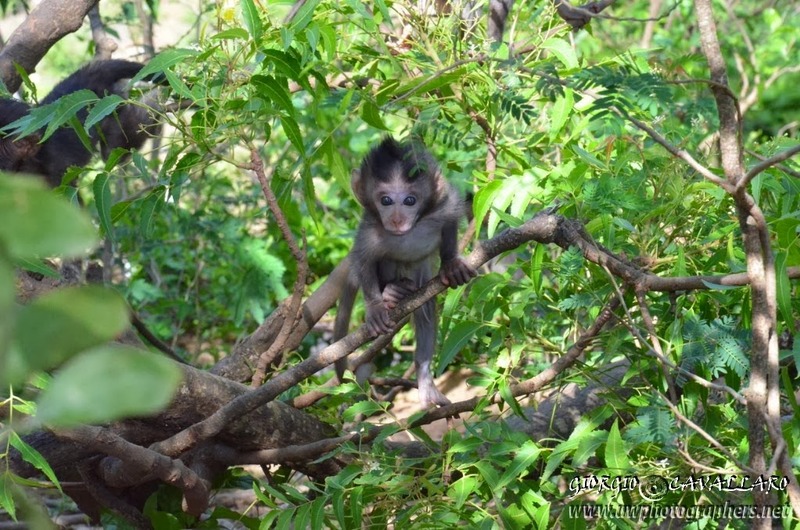 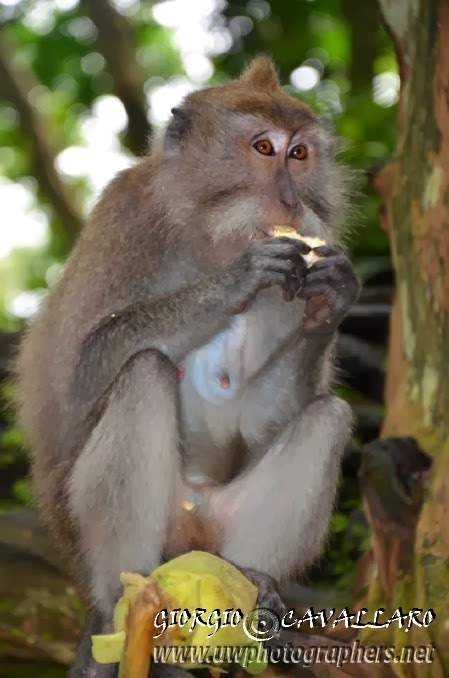 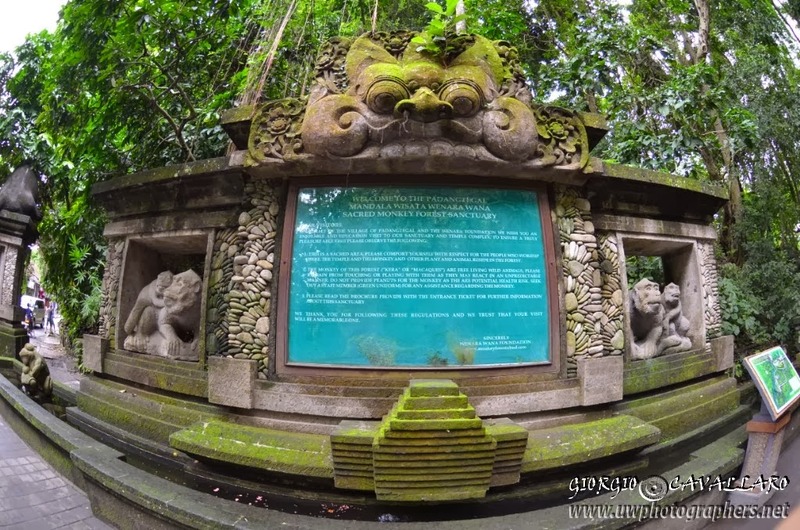 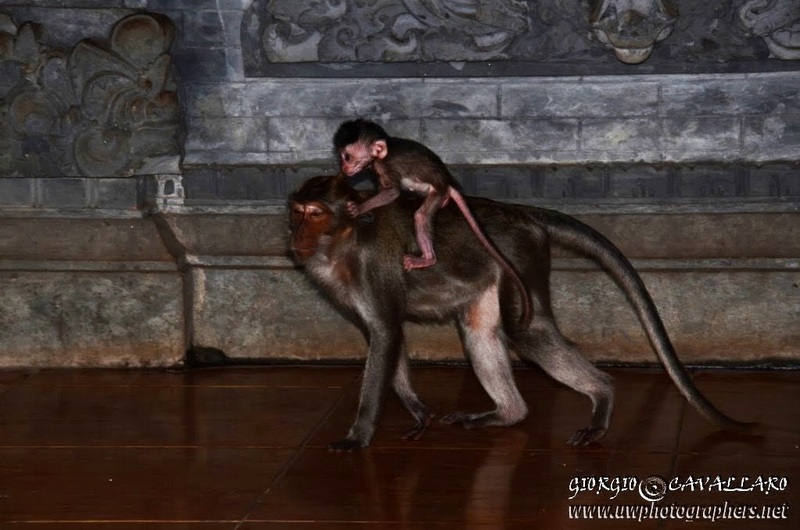 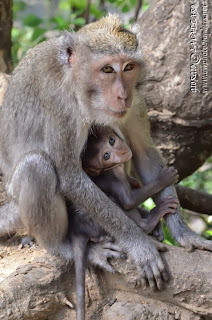 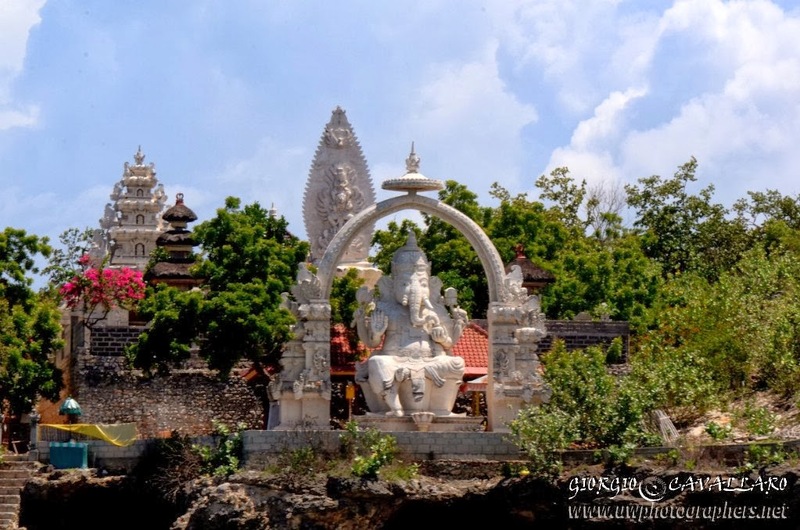 The following day we leave Sanur for Tulamben and en route we have a chance of stopping by a beautiful lotus flowers garden, magnificent rice fields, palm trees and jungle on the landscape and we then stop by a little temple surrounded by curious monkeys. 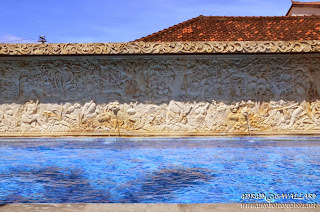 We take a few pictures and then we stop again by the stunning Water Palace at Tirtta Ganga, one of the examples of local history and art. 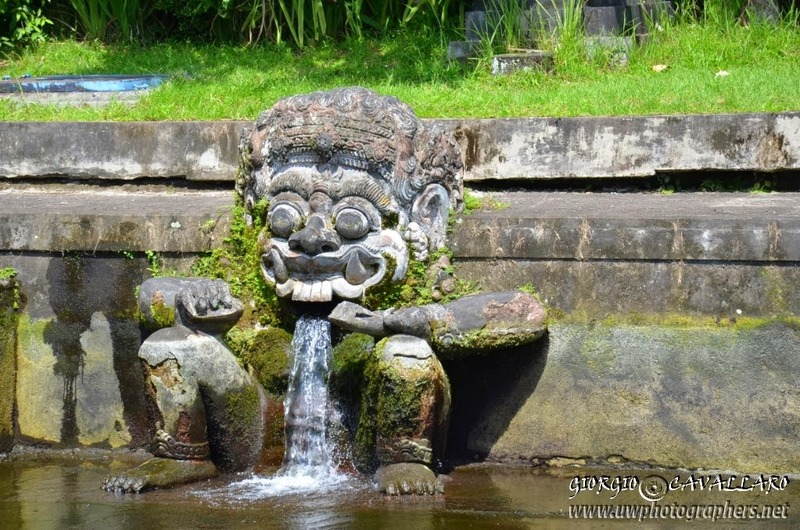 The water is populated by big carpe and beautiful statues representing local heroes and gods, can be reached and pictured by walking on peculiar little stone islands. But it's already time to go and we jump again on the very comfortable mini bus put at disposal by Bali Secrets to reach Paradise Resort at Tulamben. 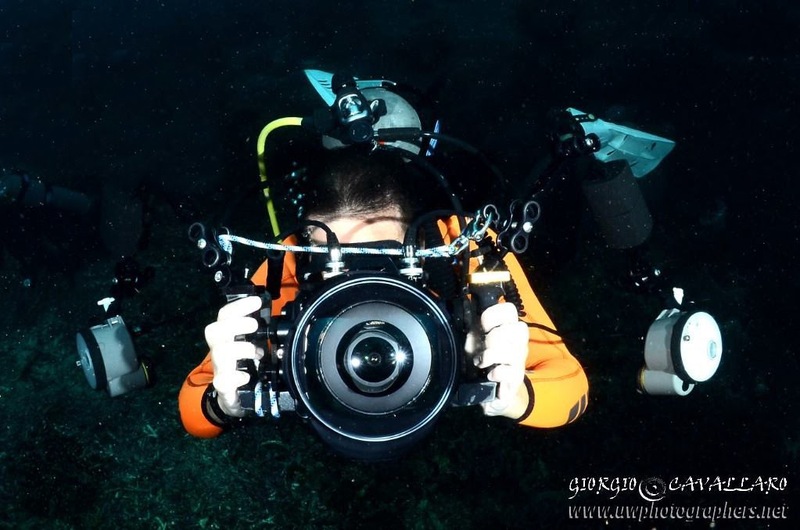 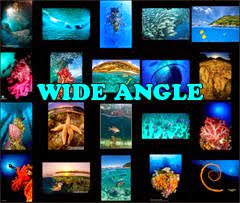 After having settled down in very comfortable rooms practically situated on the beach, we prepare our equipment to explore the Bali underwater world and it is hard to believe to what my eyes actually see! 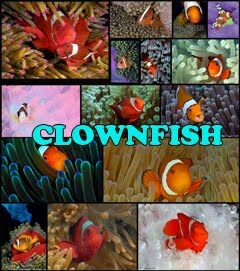 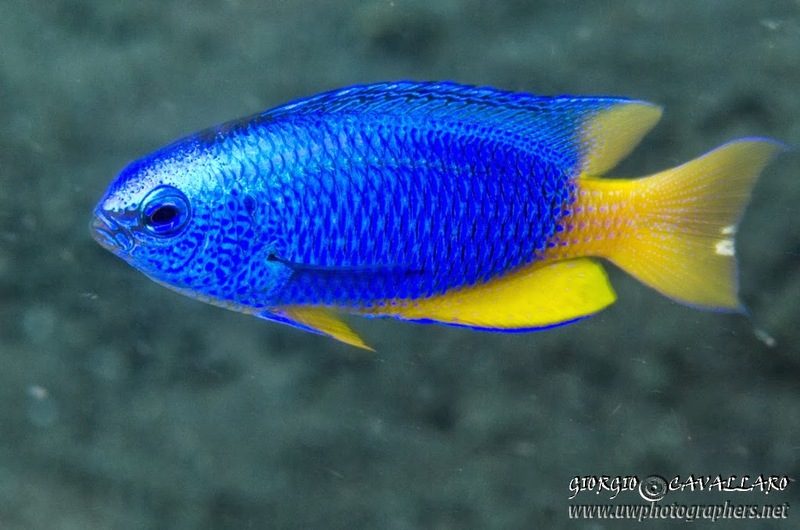 Immediately, I'm surrounded by hundreds of colourful tropical fishes. 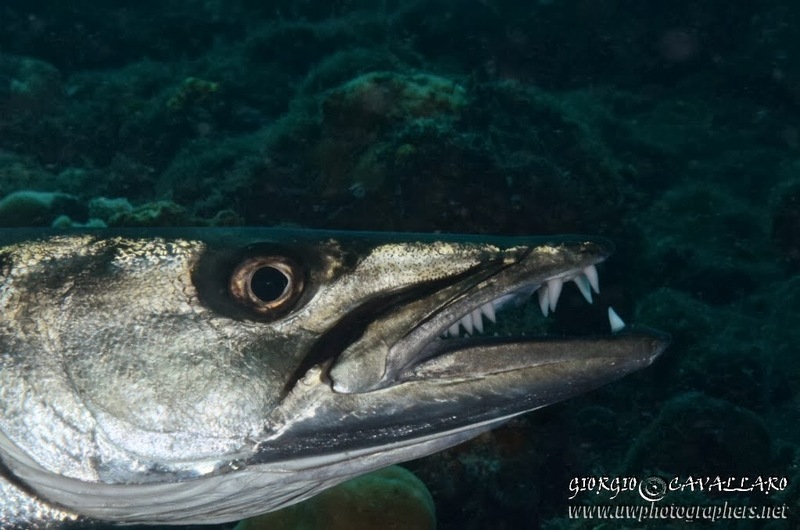 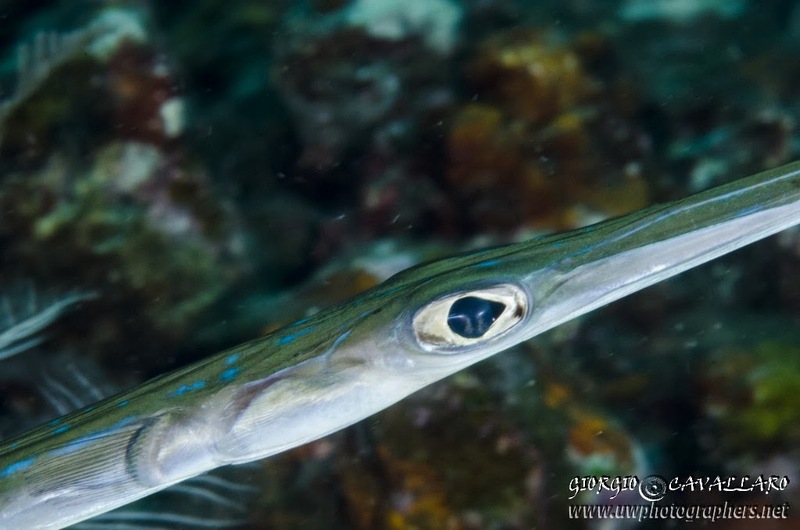 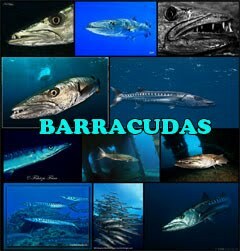 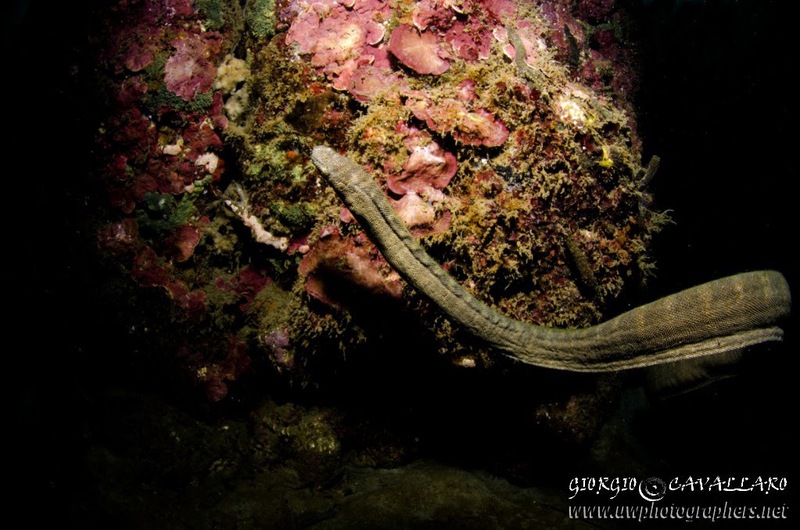 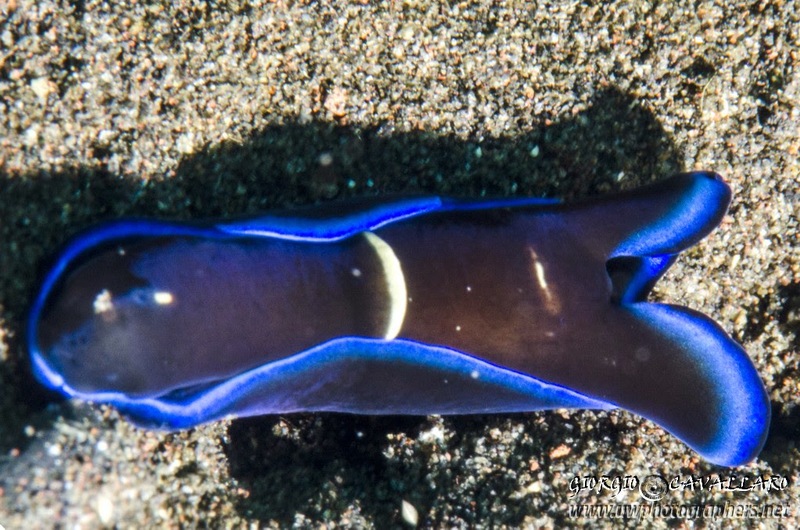 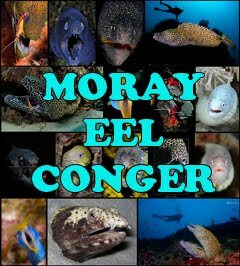 Shortly thereafter, we start meet a blue ribbon eel, barracuda and beautiful nudibranchs and towards the end of the dive even a black tip reef shark. 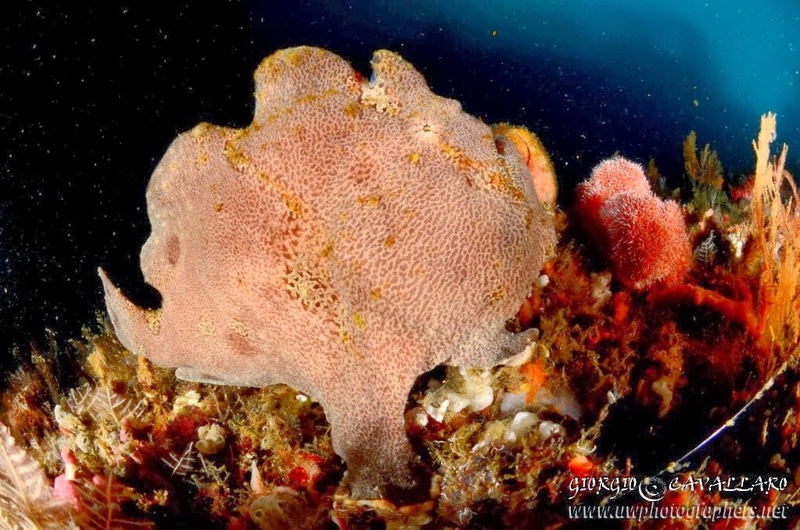 The following days, dives continue surprising me with charming encounters such as ornate ghost pipefish, hairy squat lobster, nudibranchs of all kinds and also a giant frogfish. 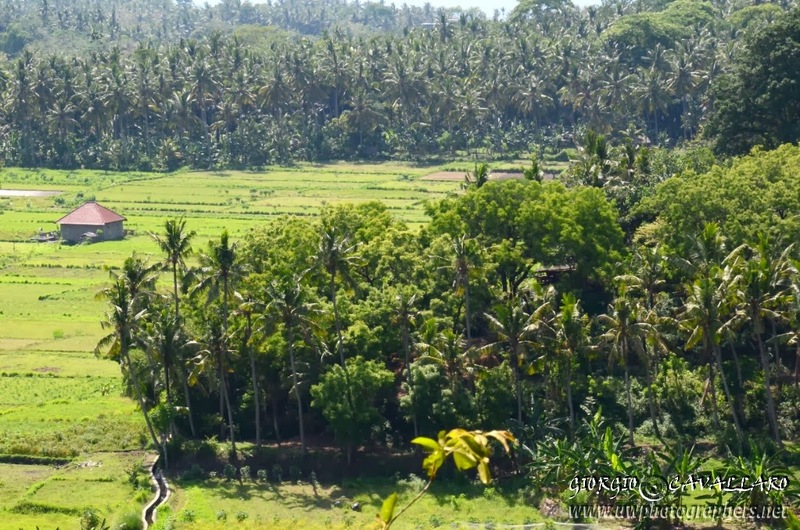 The variety of Bali is simply amazing. 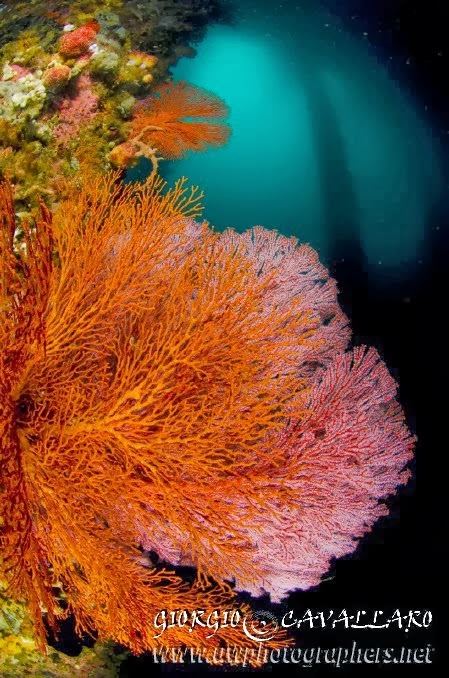 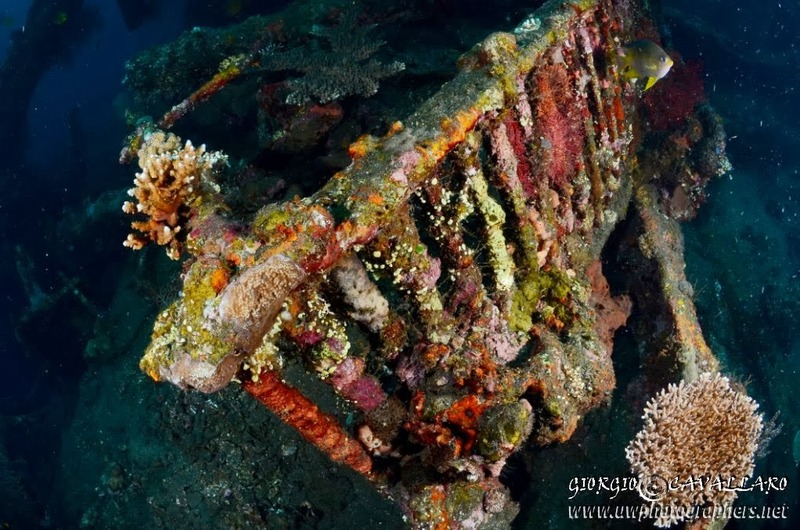 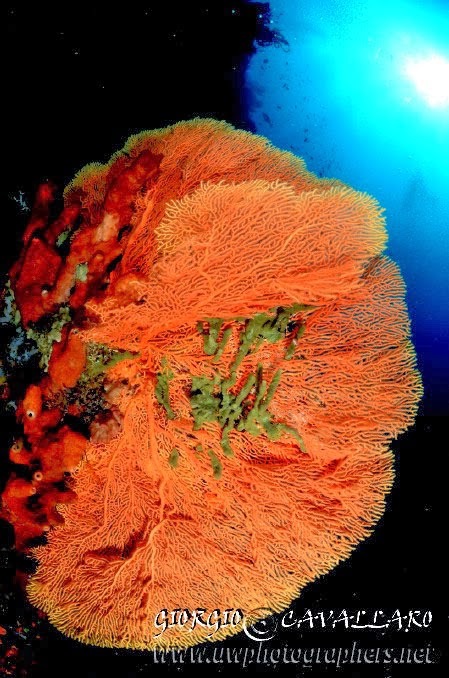 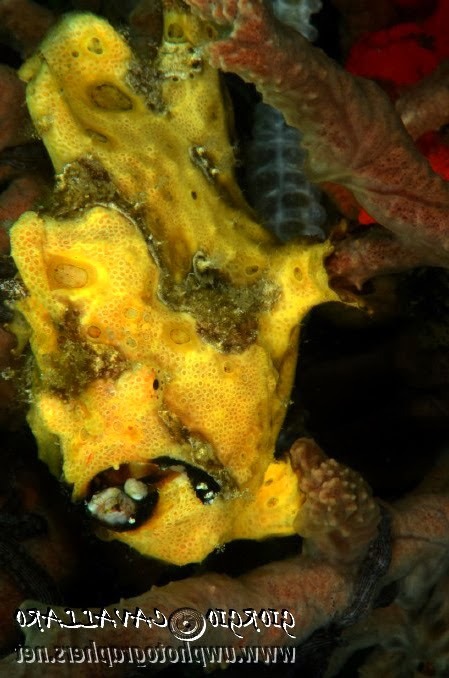 The US Liberty wreck is completely colonized by soft corals, and hosts several species such the soft coral crab (which is just half centimetre big!) 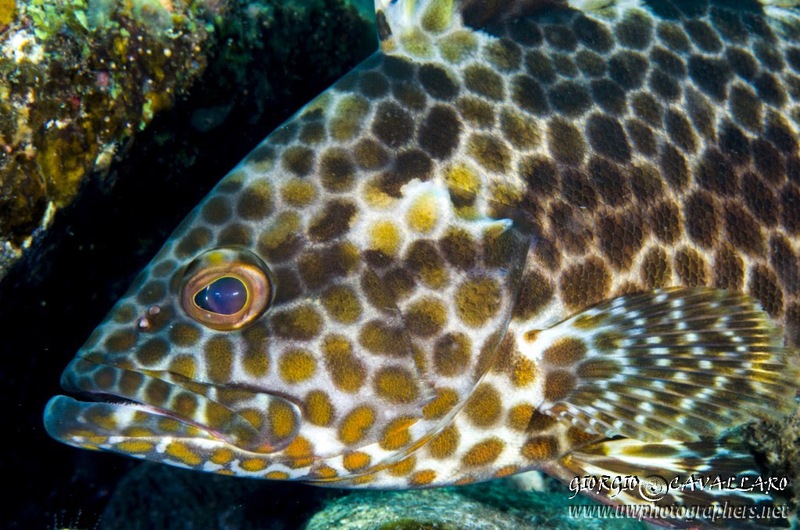 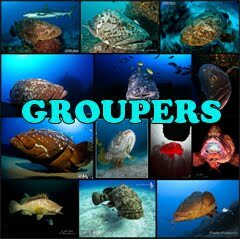 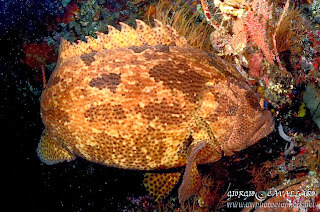 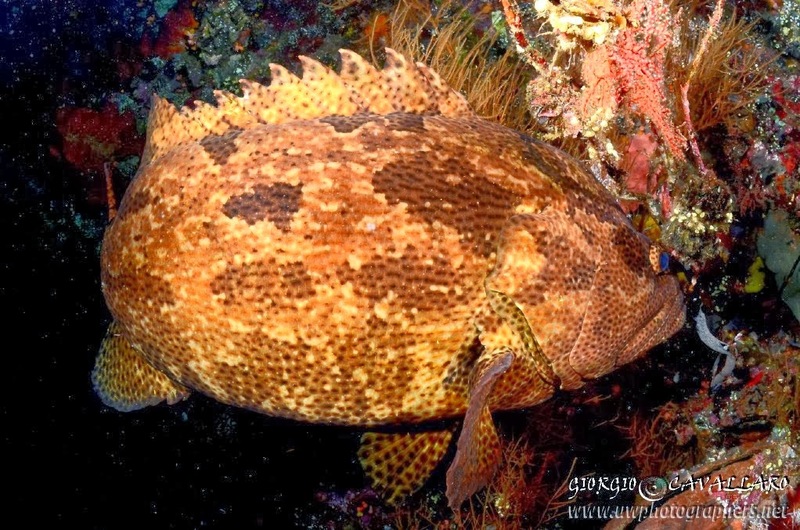 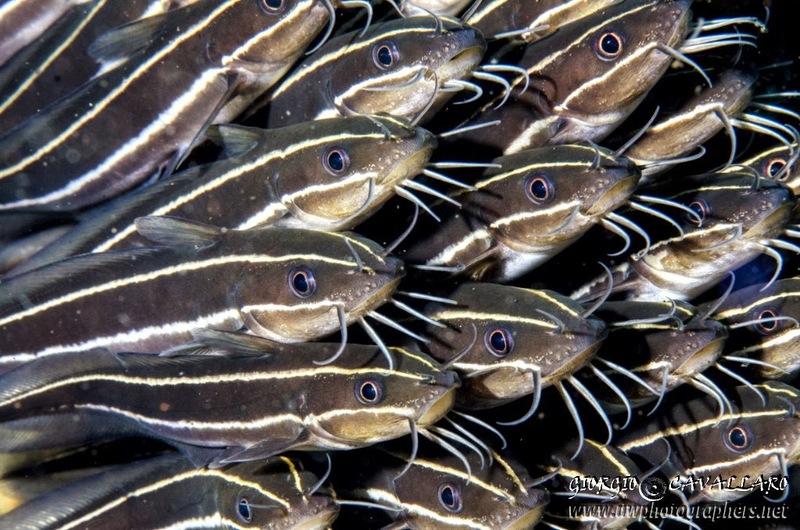 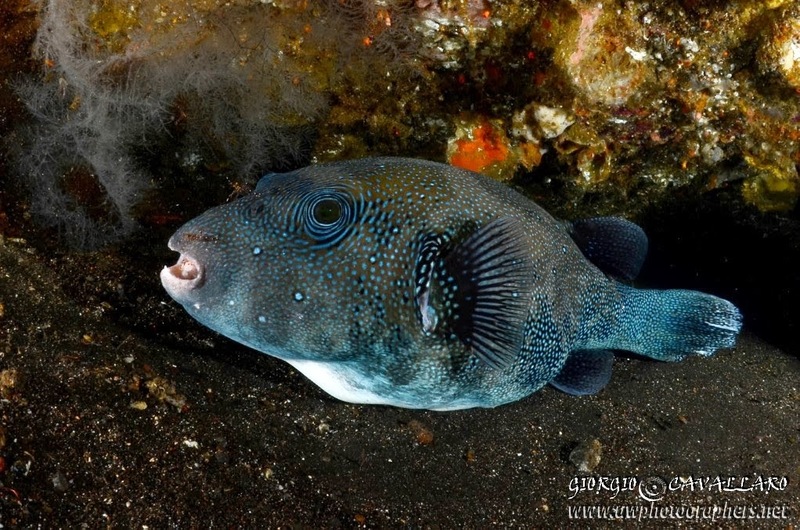 and big groupers also living inside it. 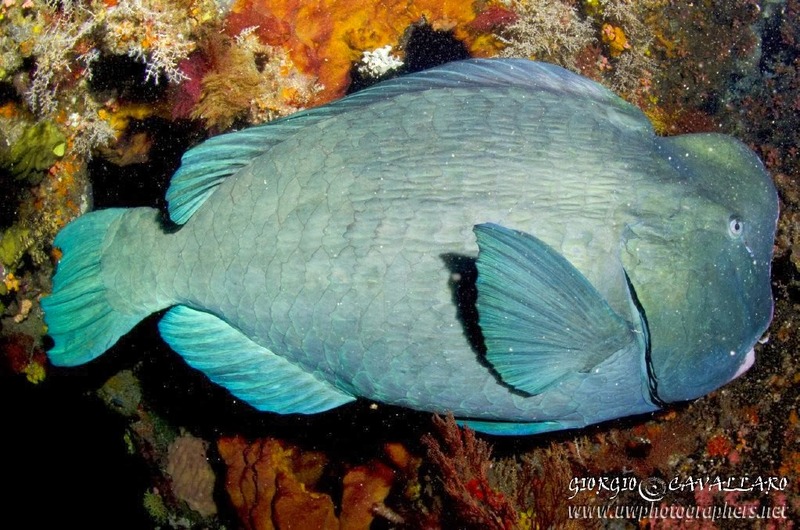 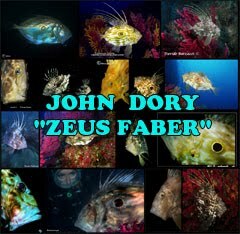 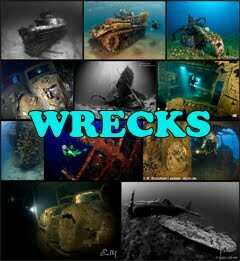 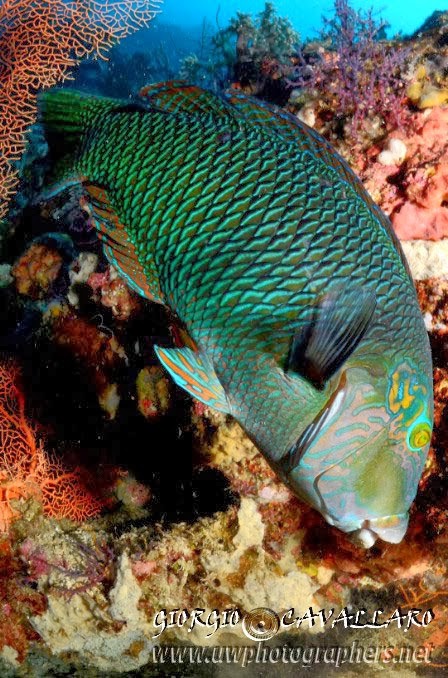 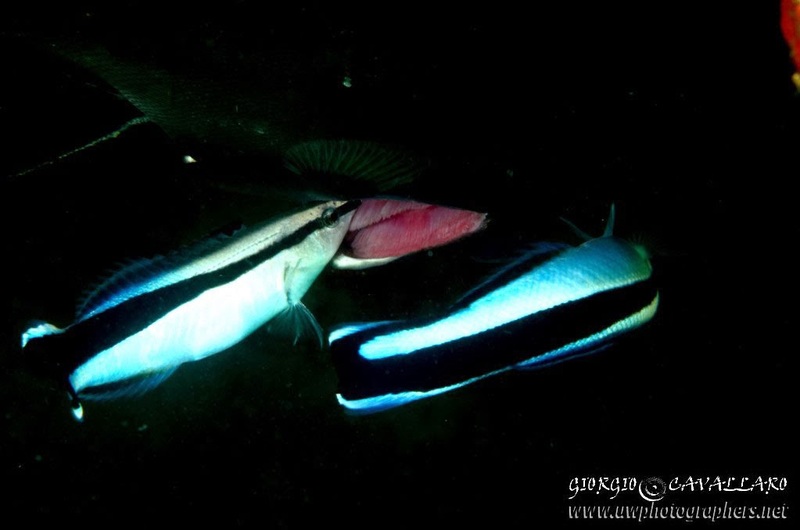 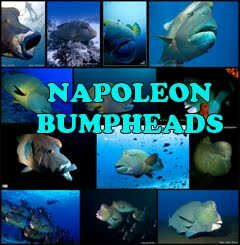 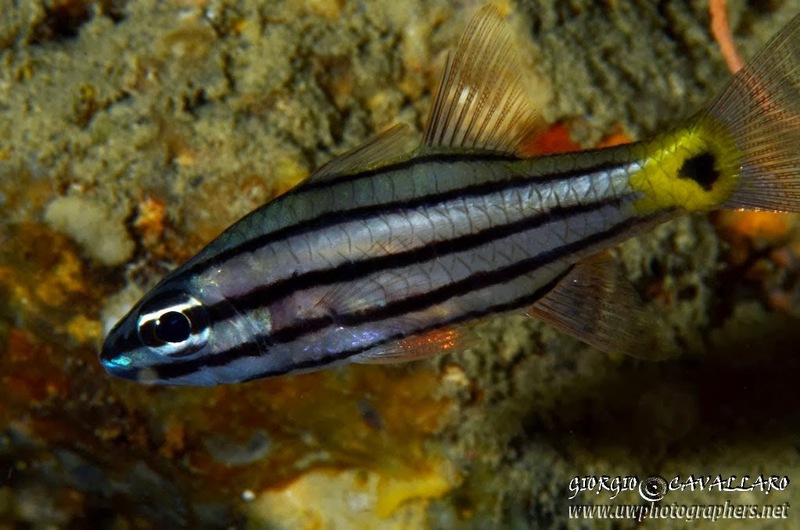 The night dive on the wreck is simply magic, big bump head parrot fish exceeding one meter length. 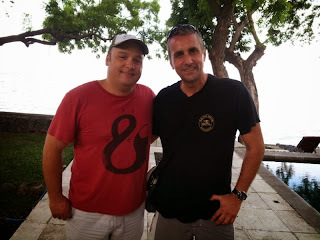 During my stay in Tulamben, I meet with the top photographer Alex Mustard who came here to act as a judge during the Indonesian u/w photography championships, together with other big names of international u/w photography. 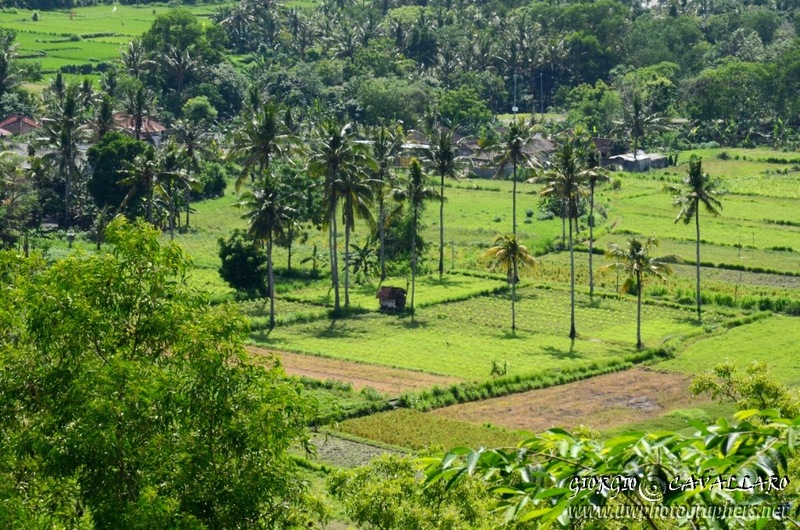 After the beautiful days in Tulamben, we are ready to go to Amed, wonderful village and beach resort on East Bali. 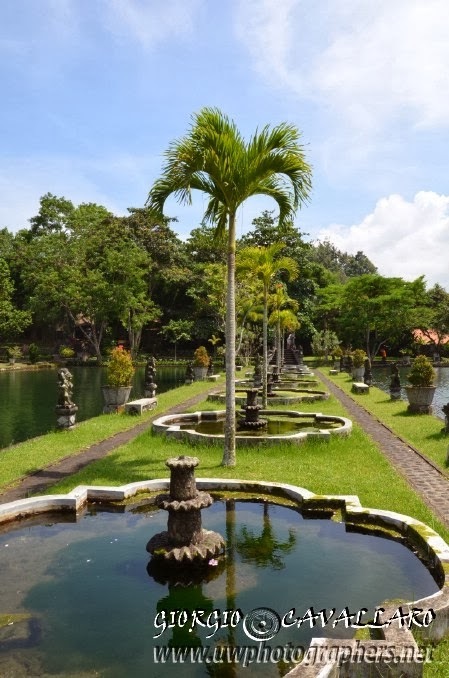 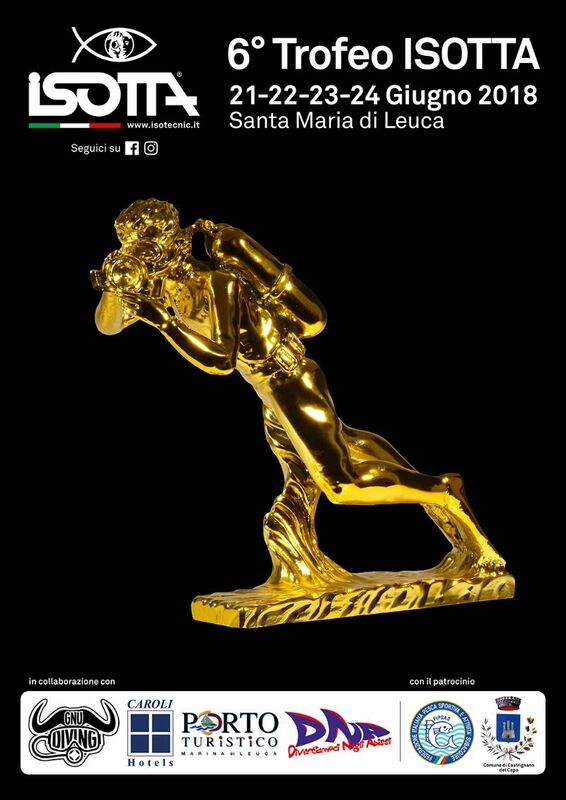 A visit here cannot be missed! 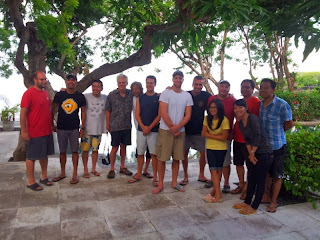 We stop by a local structure furnished with swimming pool and restaurant to put together our underwater equipment and we board a "jukung" (local boat). 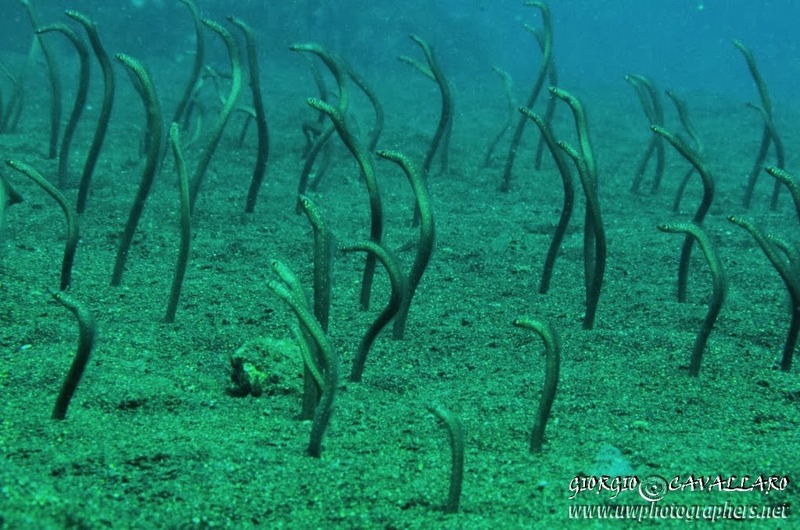 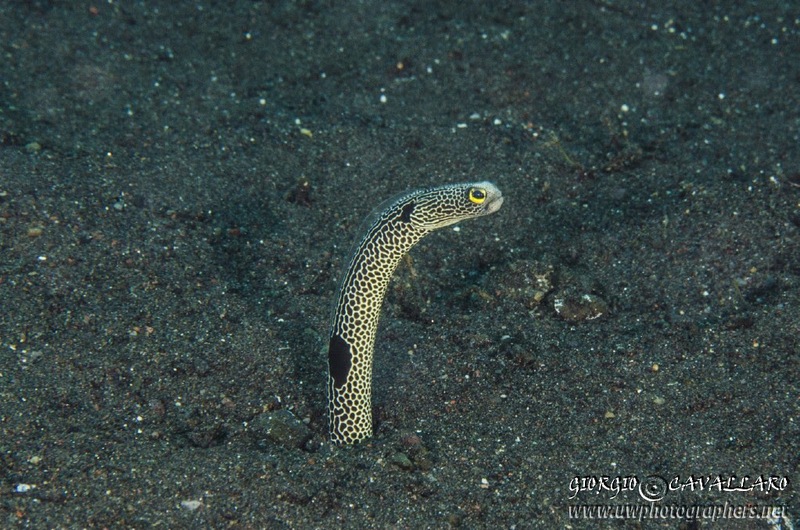 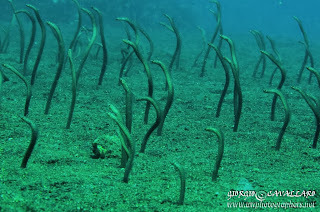 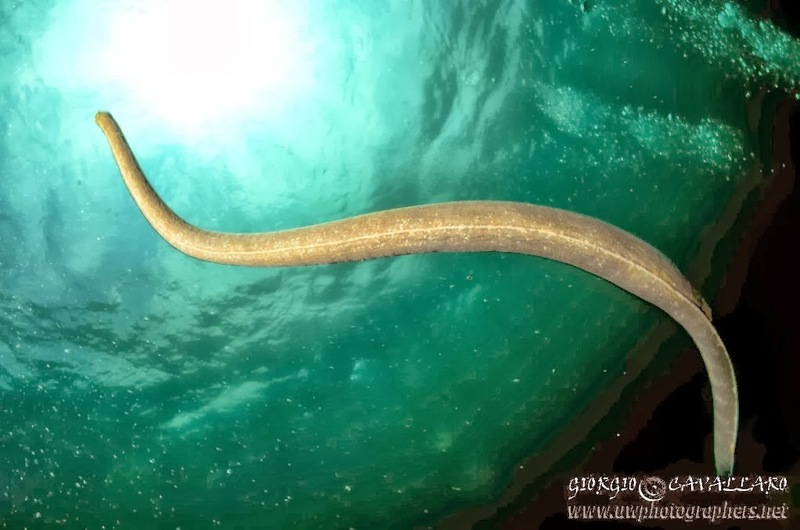 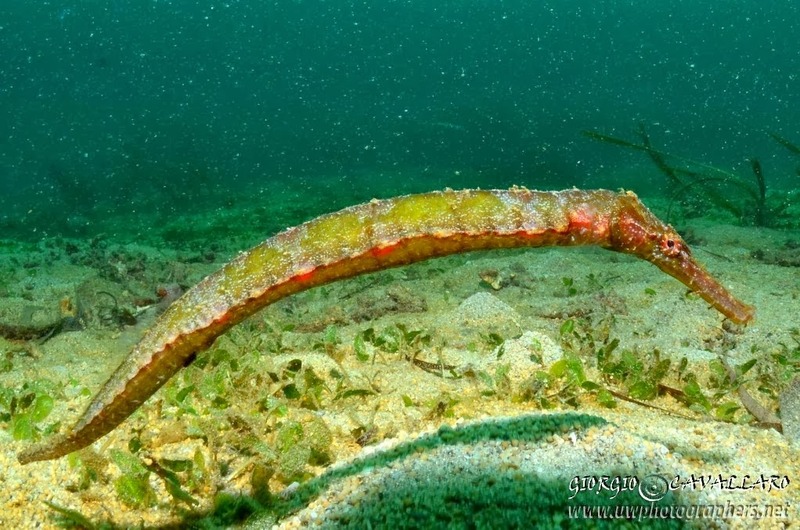 Once in the water, we are welcomed by garden eels half a meter high emerging from the sand! 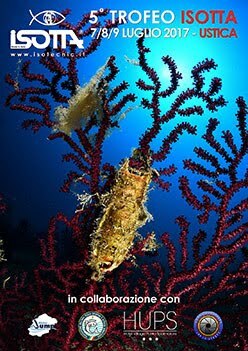 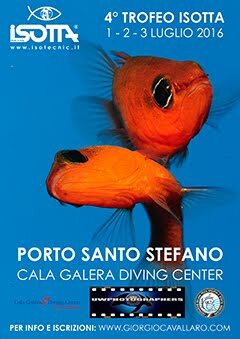 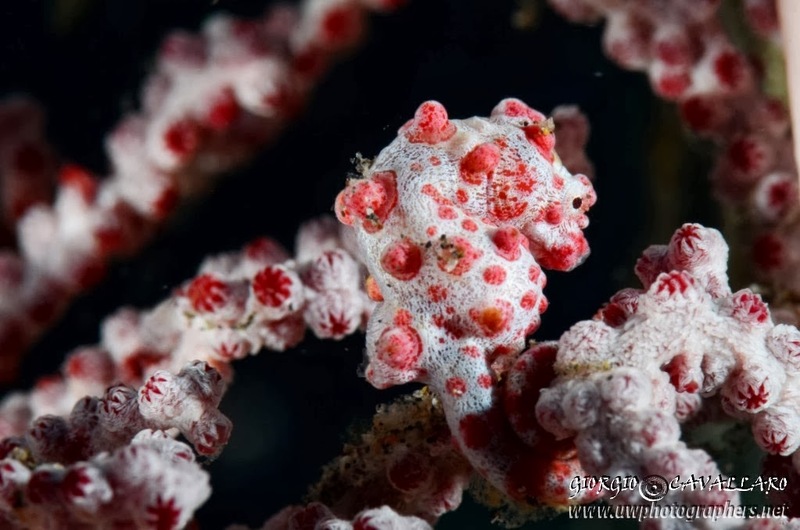 We move by a few meters and we have further charming encounters: shy jaw fishes, a one meter Moricella sea fan inhabited by pygmy seahorses, the littlest specie of sea horses in the world! 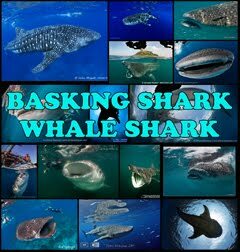 We are so lucky that while observing it, a whale shark is crossing but is unfortunately too quick to be photographed! 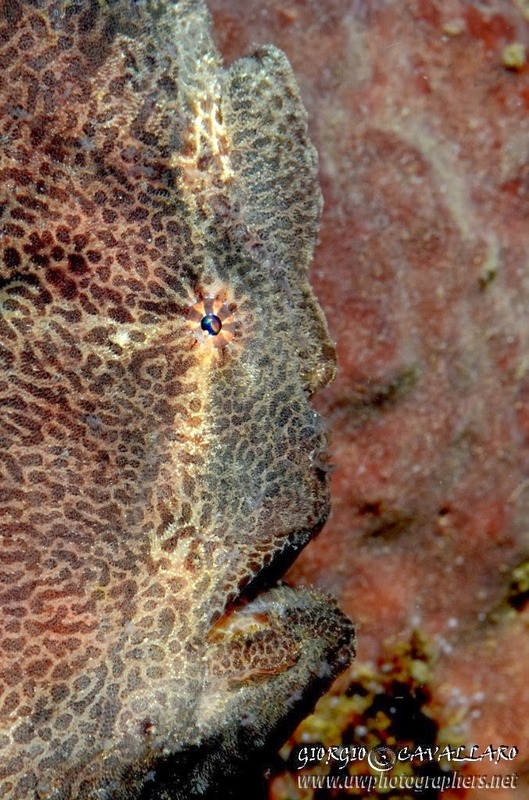 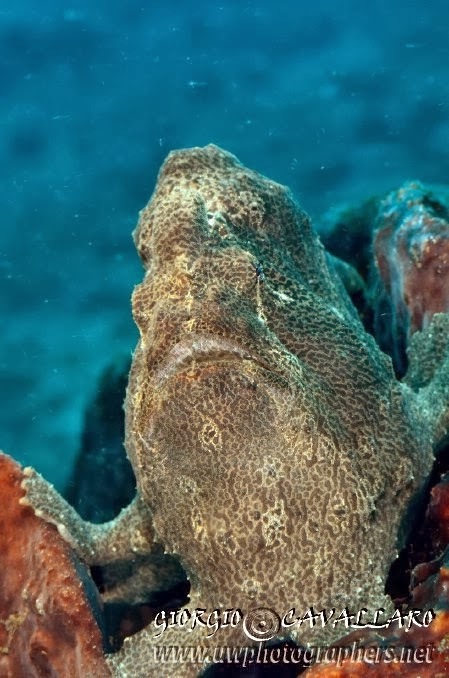 I'm surprised by the healthy coral reef and warm water and before completing the first dive we come across a giant frog fish. 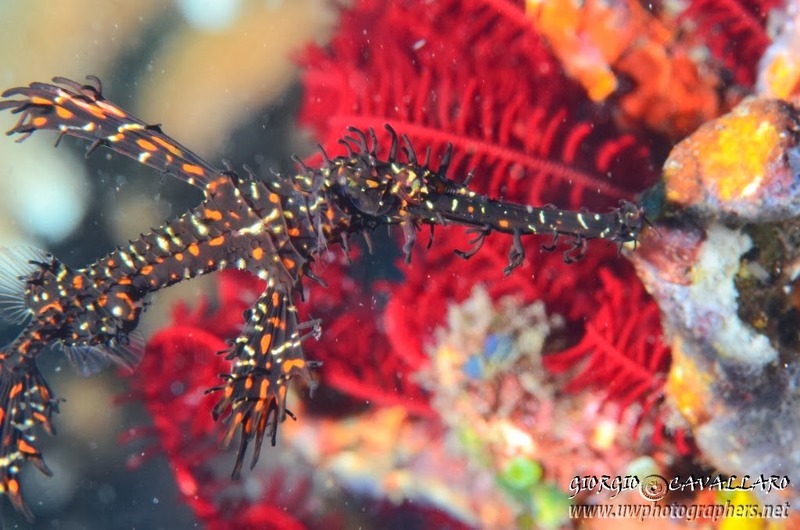 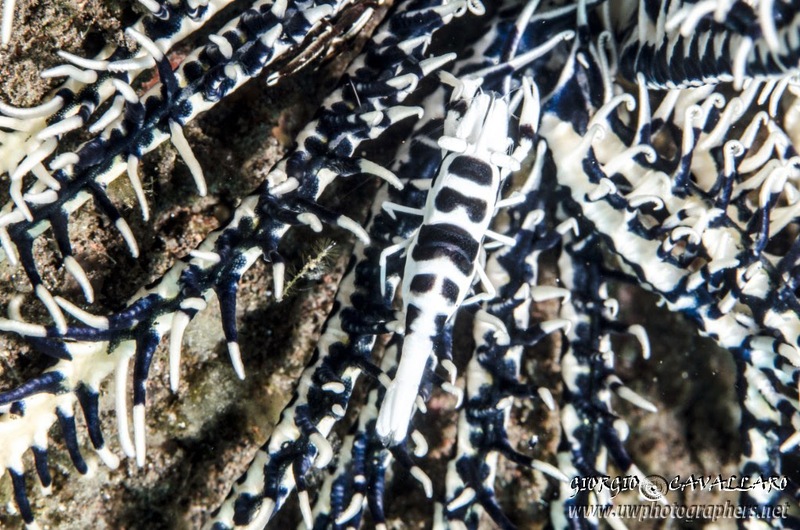 The second dive offers us an ornate ghost pipefish, an harlequin crab and several little "critters"! 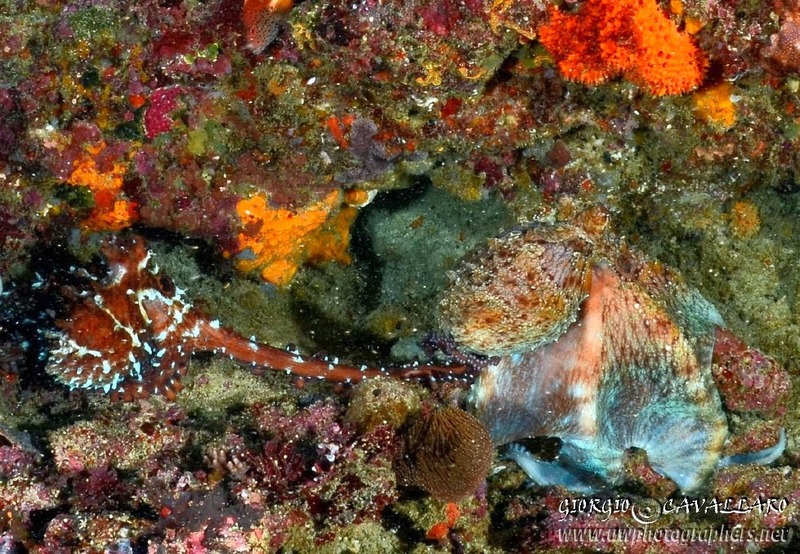 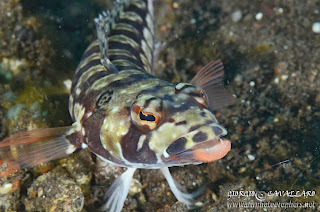 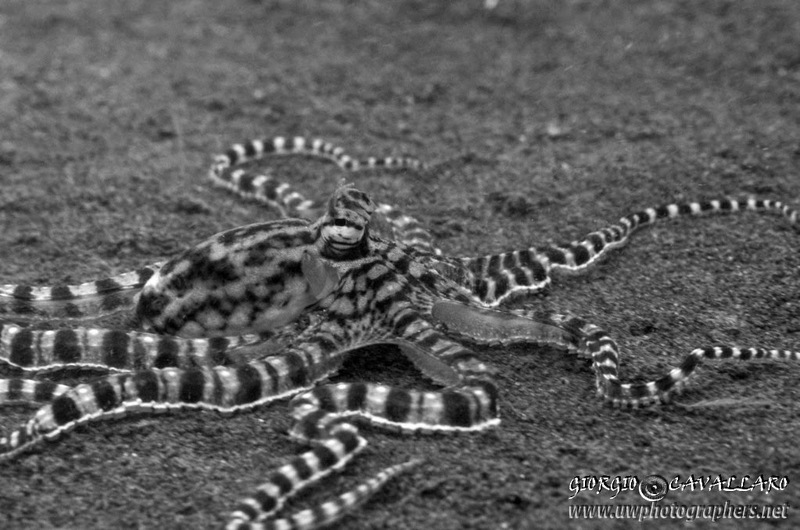 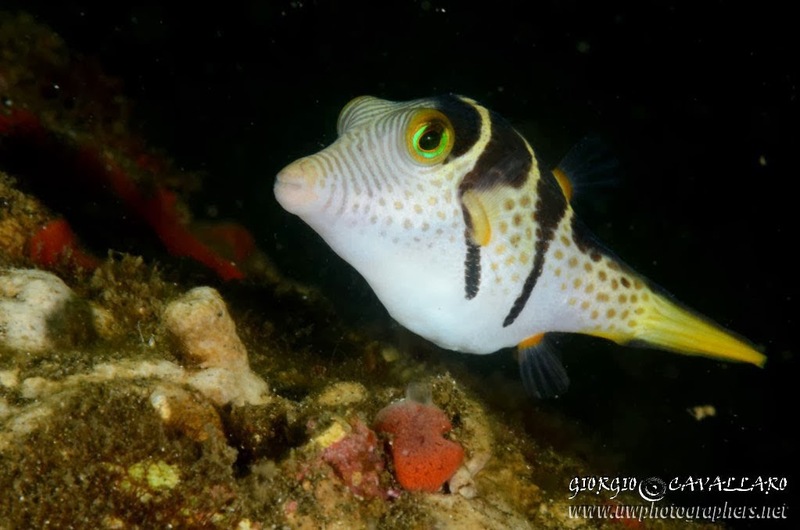 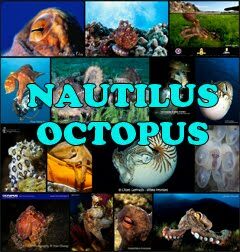 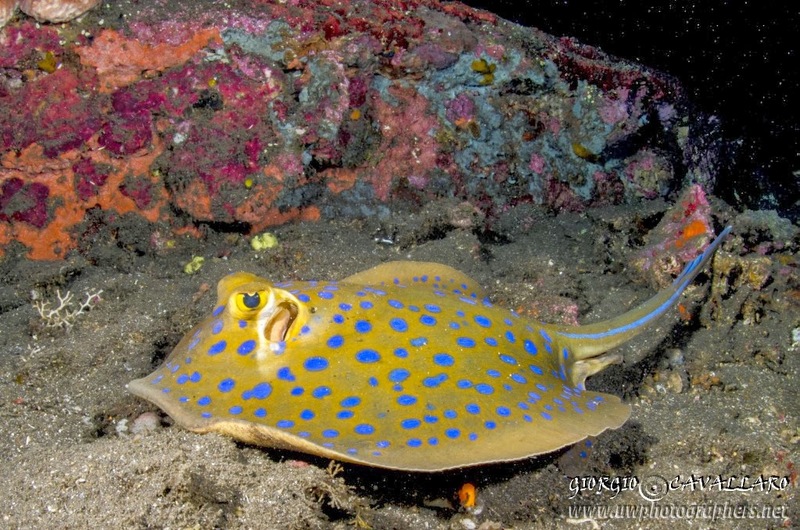 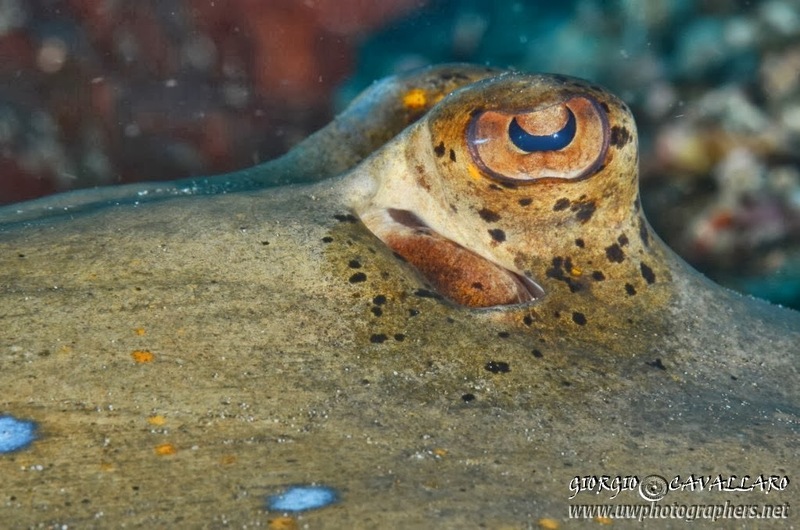 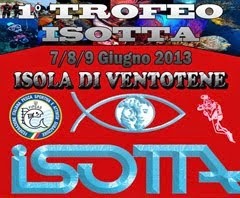 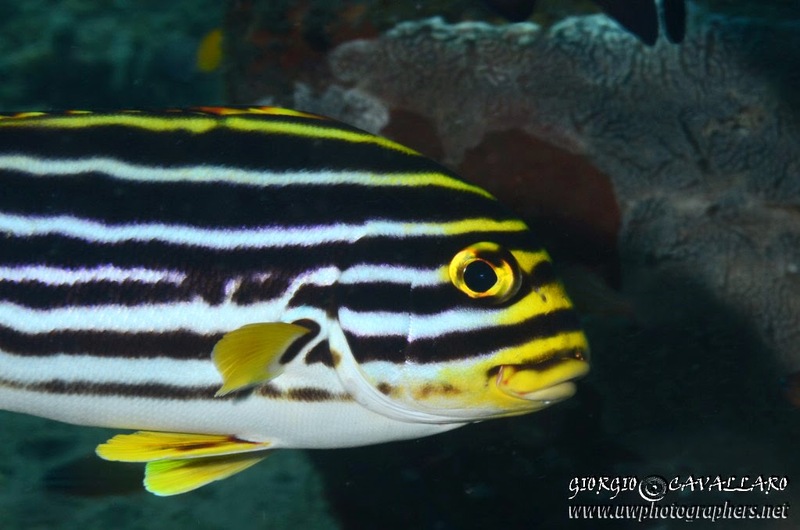 We then leave for Lovina, where we hope to meet probably the strangest creature of all: the mimic octopus! 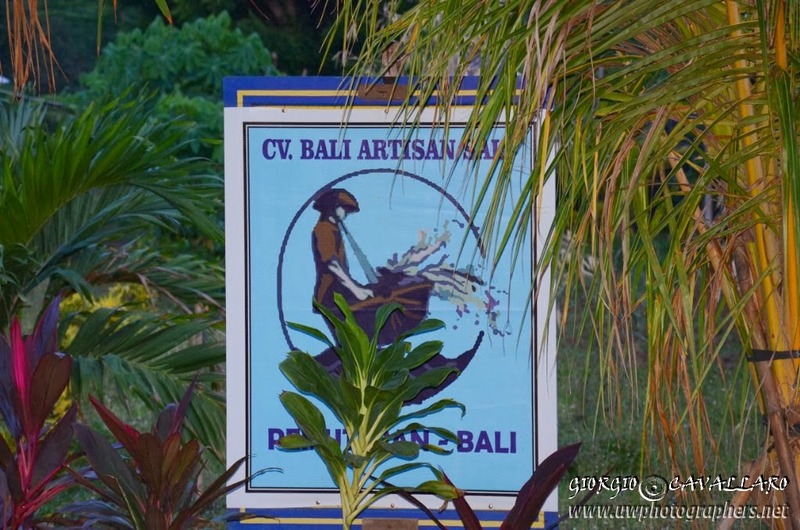 But first, let us relax for dinner in a local restaurant where we can taste delicious fresh fish cooked in the local way... at a very low price (less than two euros...). 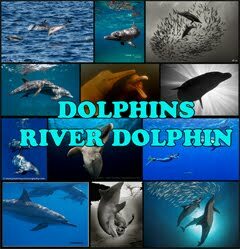 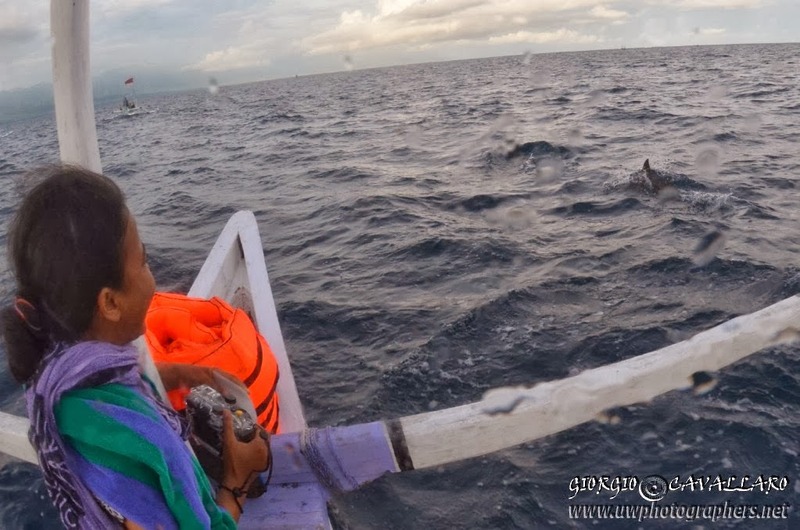 Before starting the dive, with Riza we go to see the dolphins off Lovina coast. 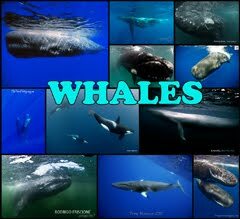 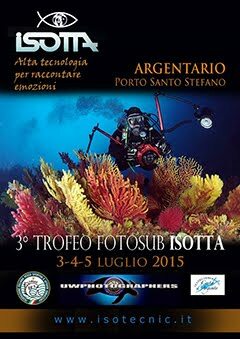 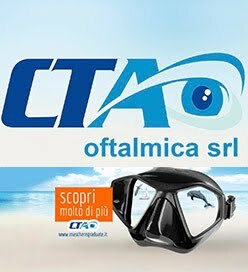 After having sighted them, I jump into the water to try photographing some of them with my dear Isotta (my photograph equipment) but due to the dolphin's speed and large number of boats on the sea surface, I cannot manage that. 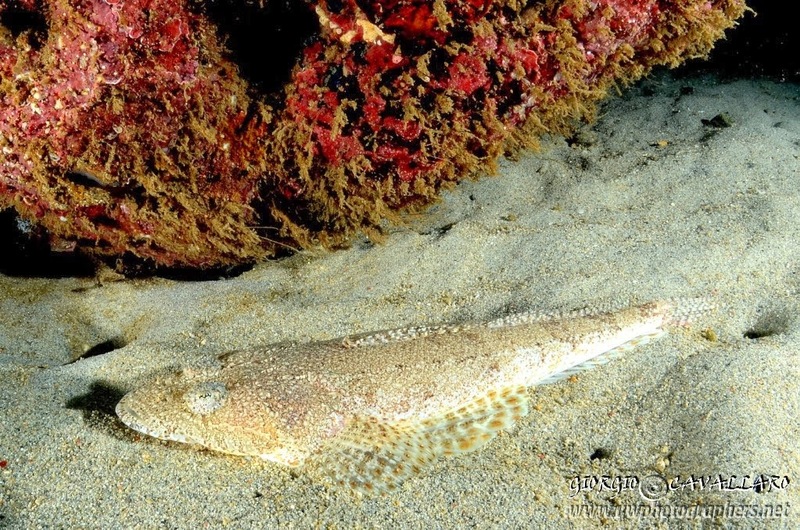 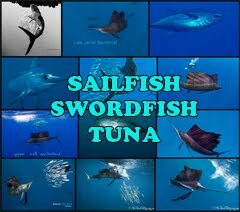 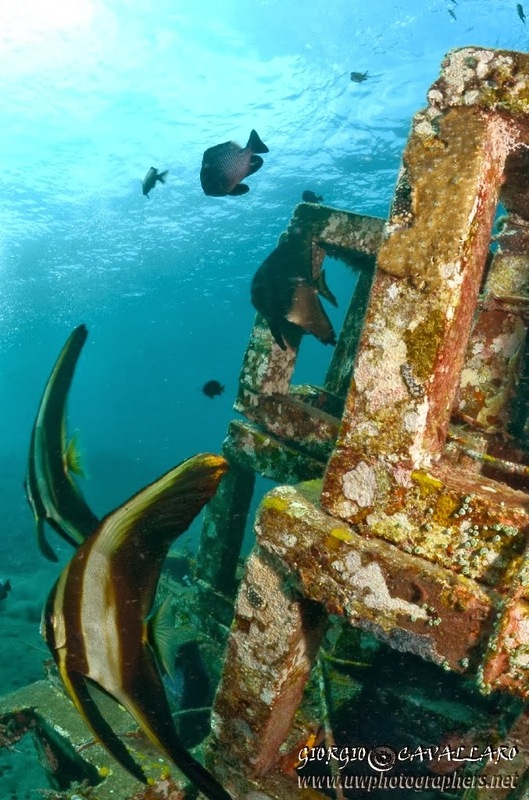 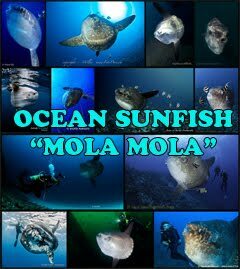 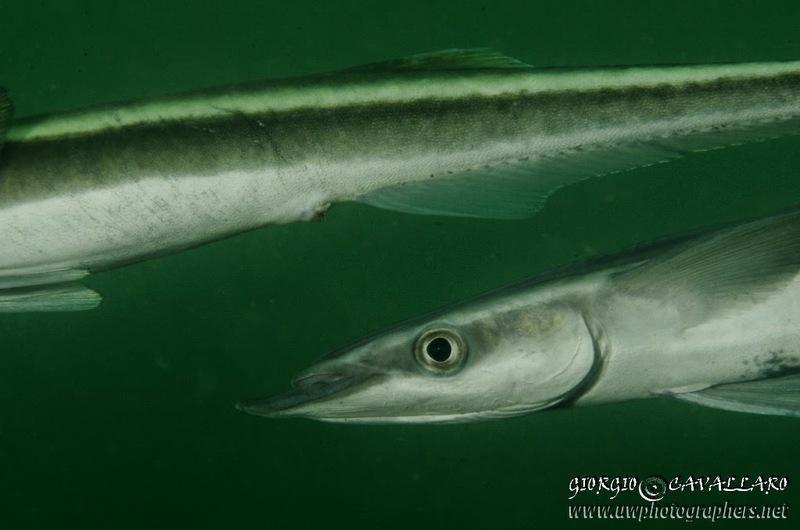 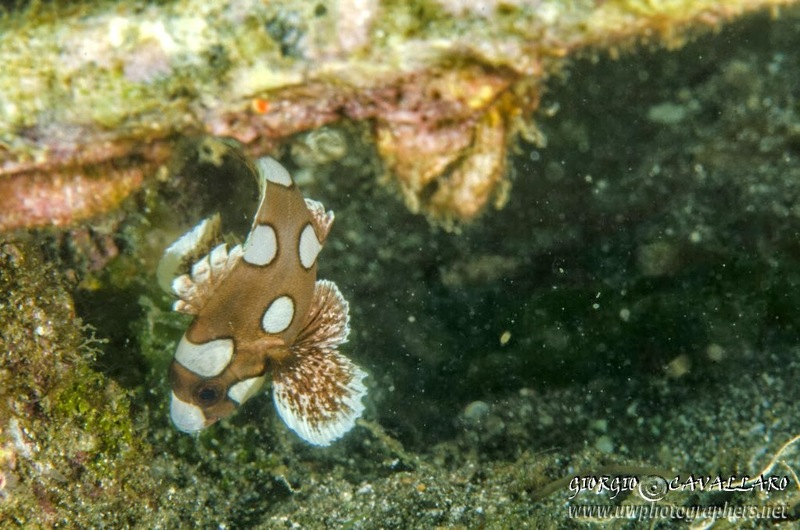 Once reached the dive site, we get into the water on a black sandy beach without any coral but I remain astonished by the abundance of fish in the area, including critters and cephalopods. I realize that I'm very like to be accompanied by two experts such as Marco and Riza who know and are able to find the best places where to observe such rare creatures on the whole island. The fact that they both can communicate in local language facilitate all the practicalities of the Safari, and in addition to that Marco is fluent in French, English, Spanish and... Bahasa! 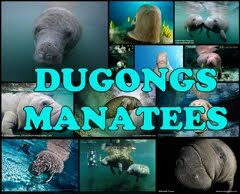 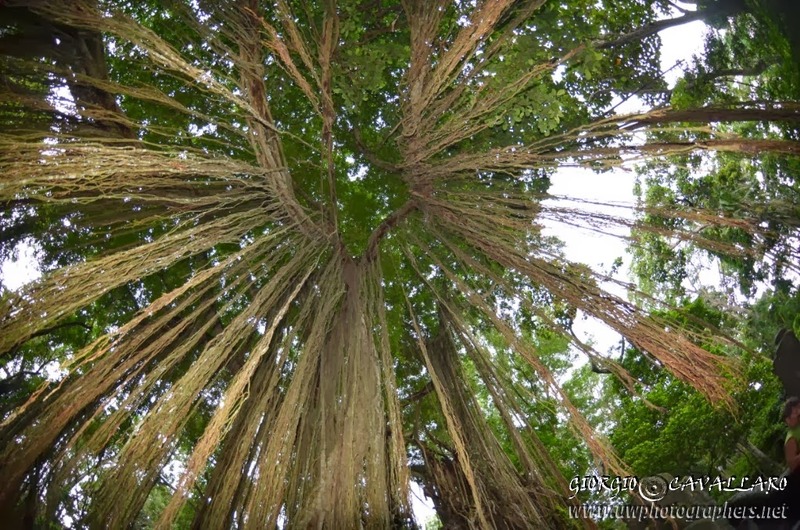 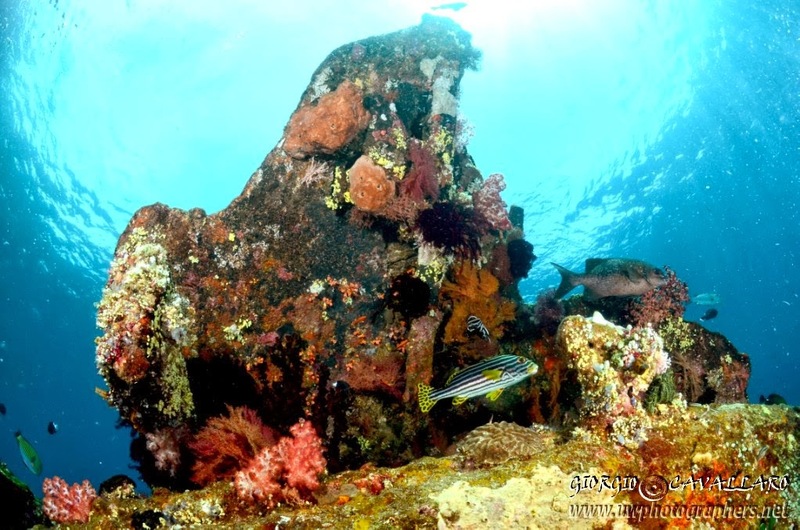 It is now time to go to Pemuteran to visit the Menjangan National Park! 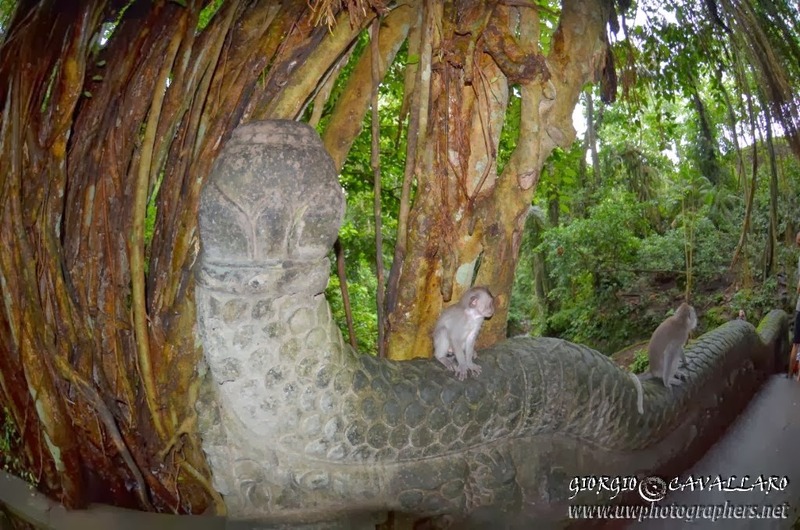 On the way to the Park, we do not miss the chance of visiting Pulaki, a temple hosting hundreds of monkeys both outside and inside! 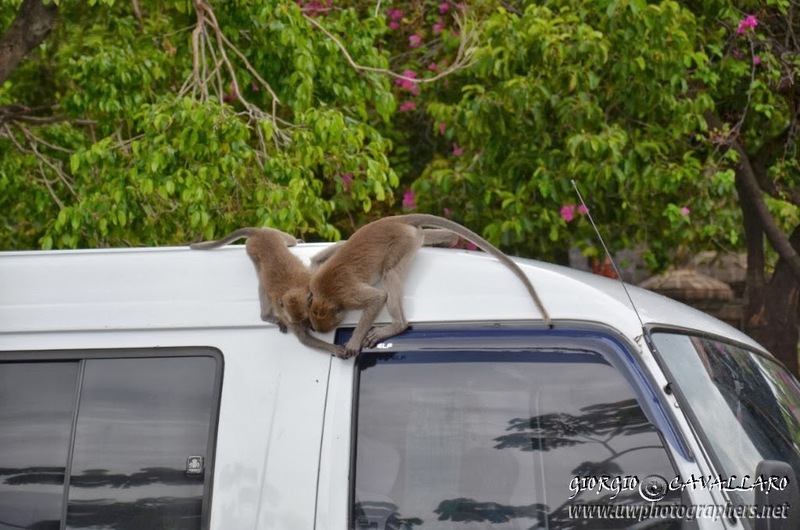 Monkeys on Bali Secrets' mini bus. 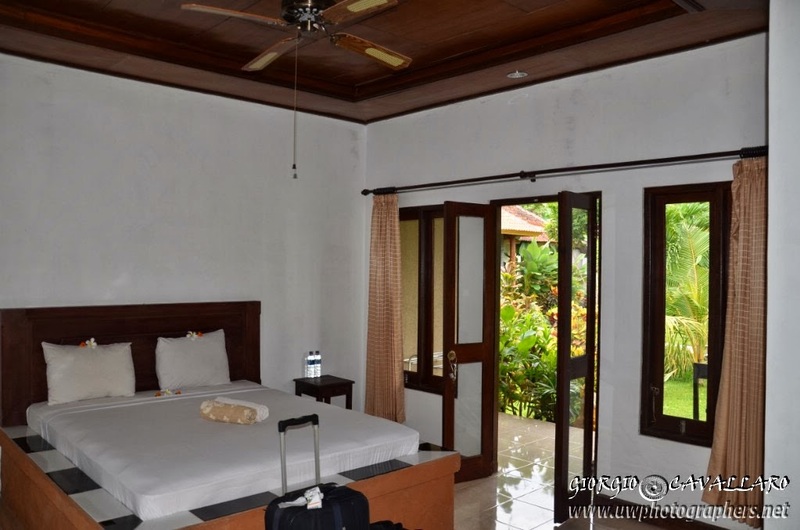 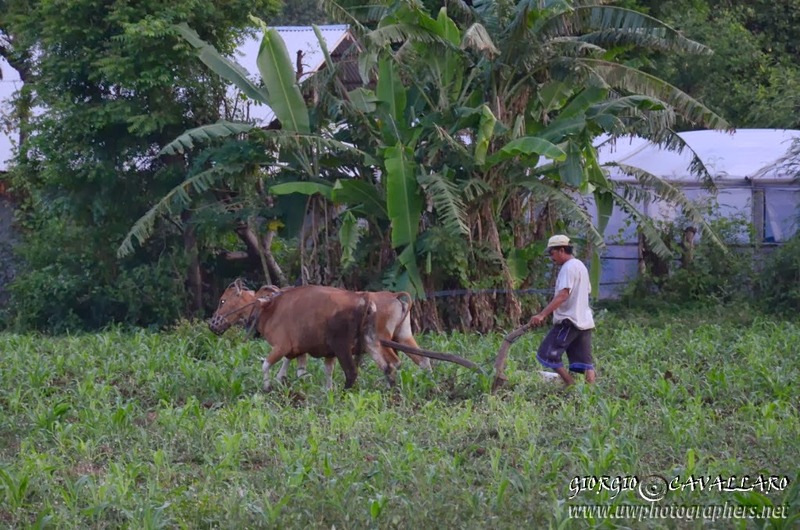 We settle in comfortable rooms into a beautiful garden (very cheap, considering that they have all comforts and that hotel is furnished with swimming pool) and then we have a walk through Balinese countryside to observe local traditions and feel the unique Bali atmosphere. 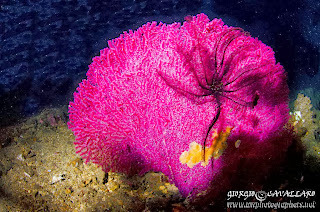 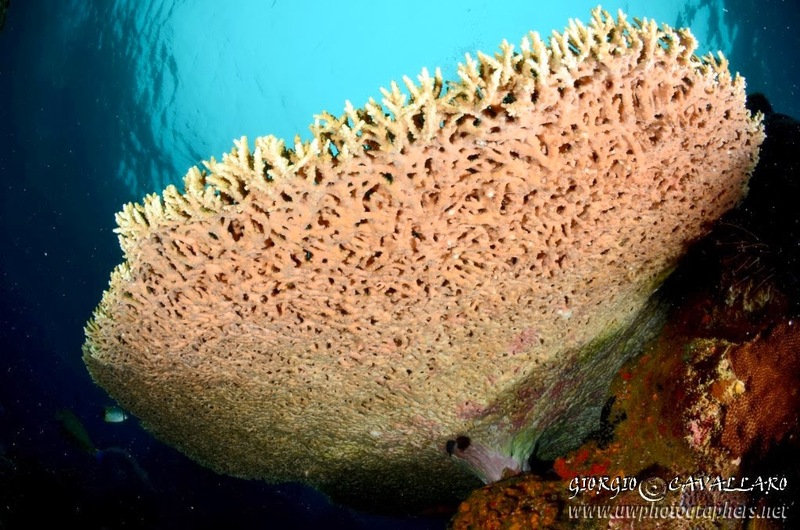 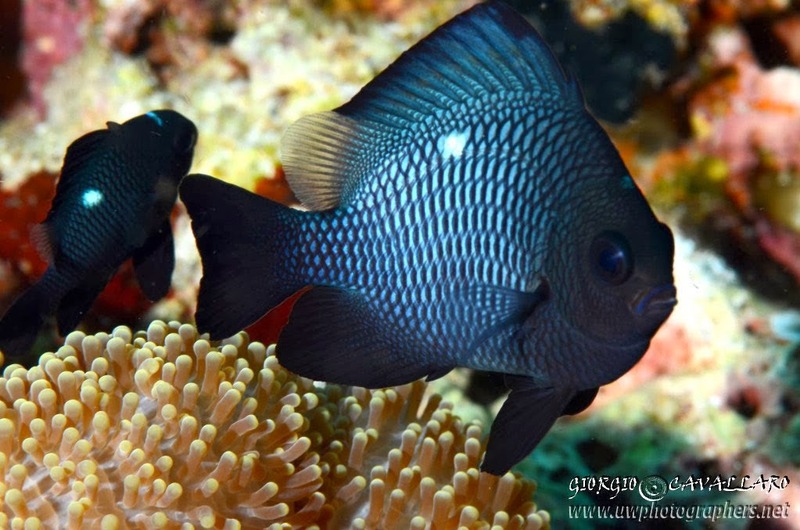 After our stay at Pemuteran we reach the National Park where we expect to see soft coral walls and tropical fishes. 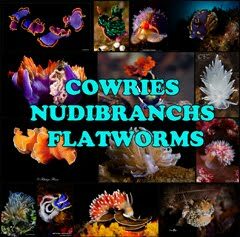 The dive is extremely pleasant: water is warm, healthy coral is surrounding us and every kind of tropical fish including a lot of nudibranchs can be sighted. 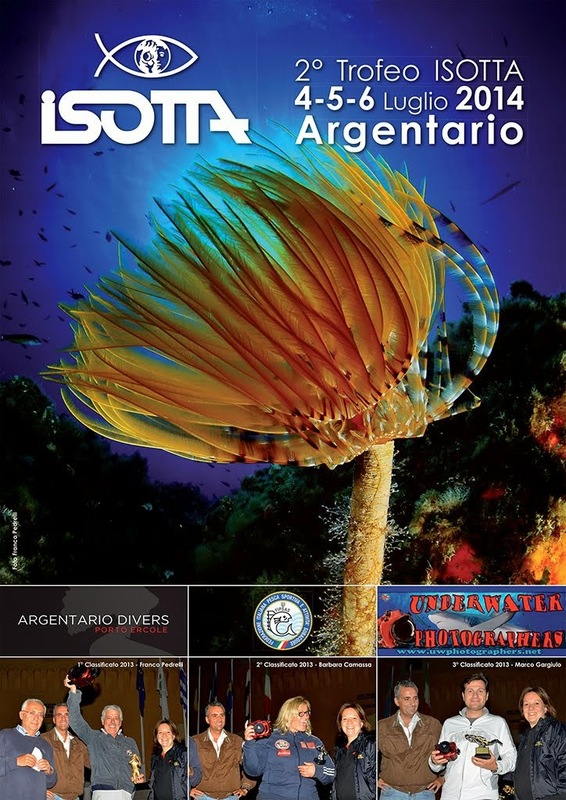 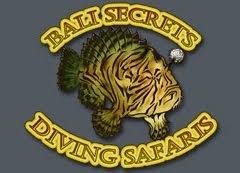 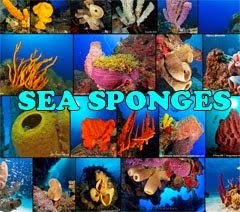 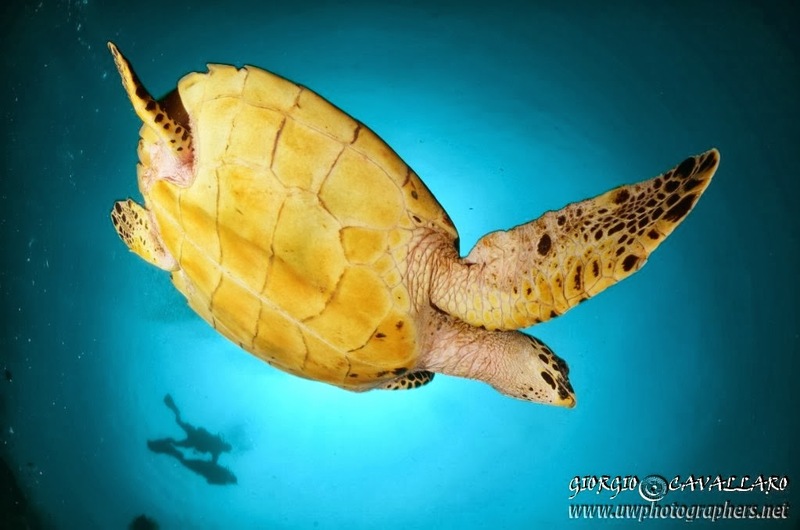 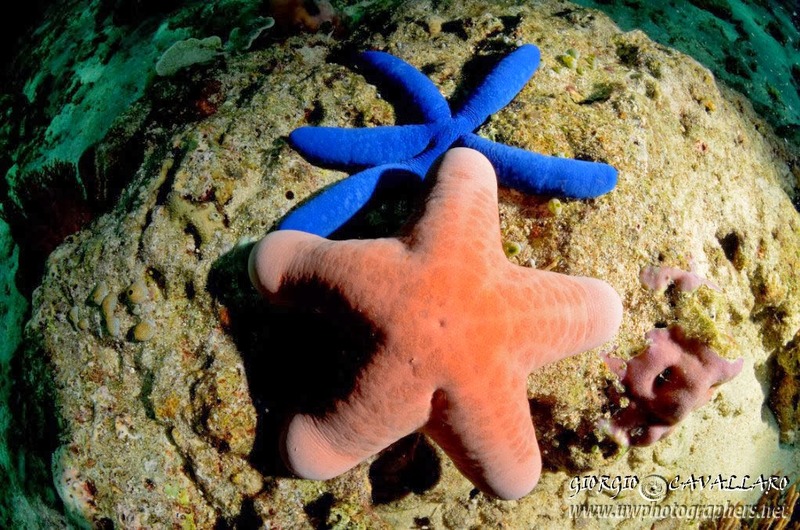 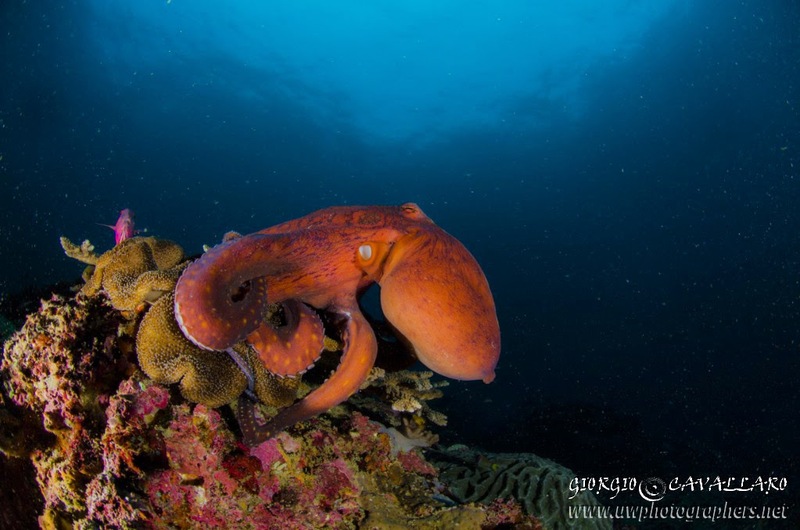 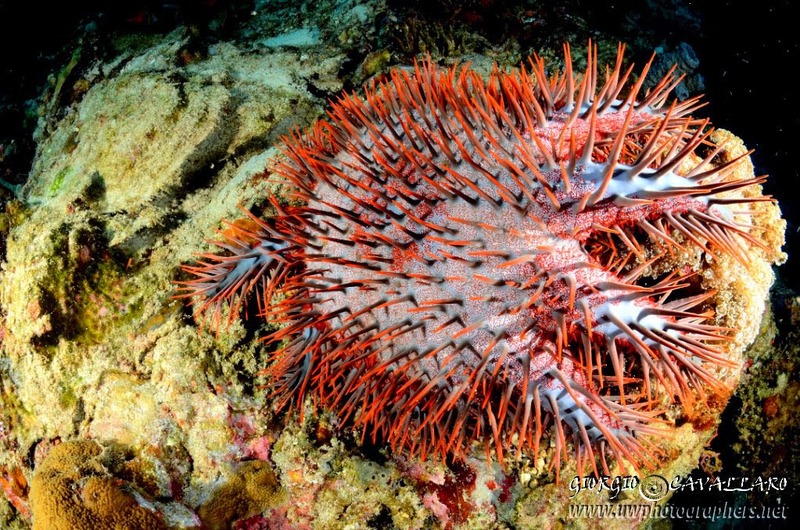 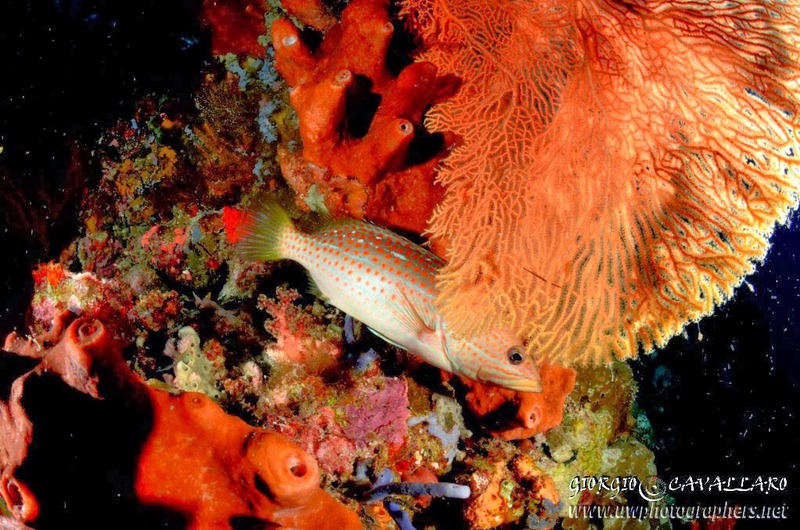 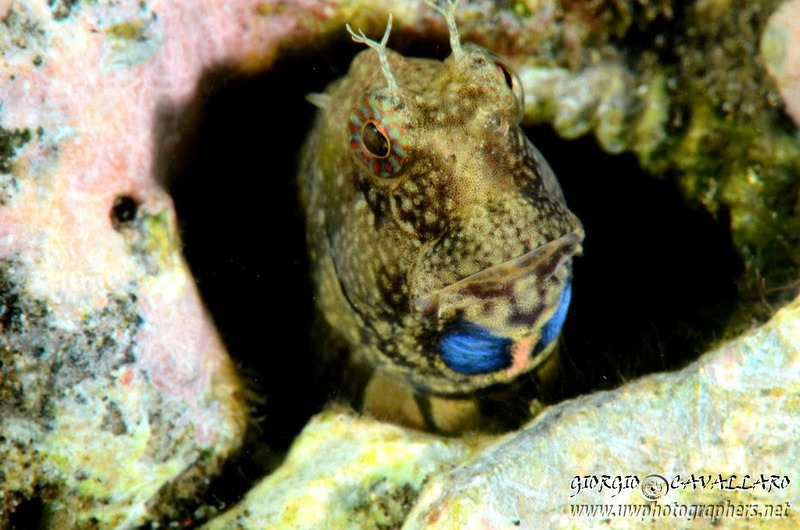 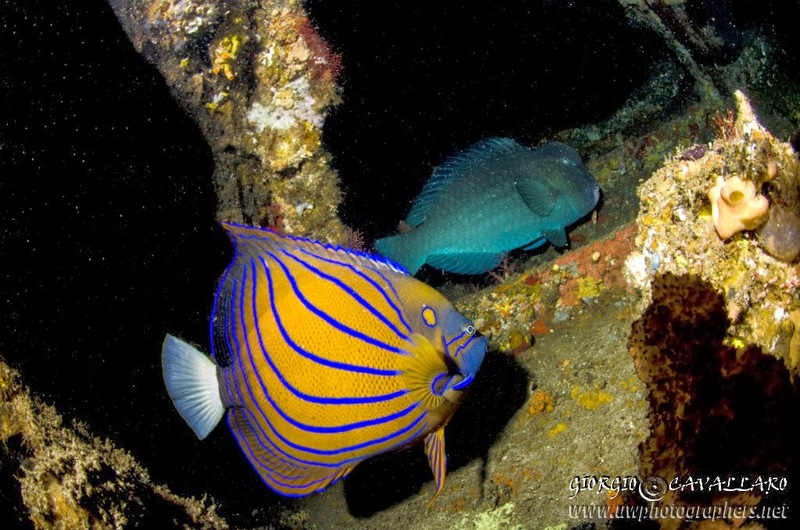 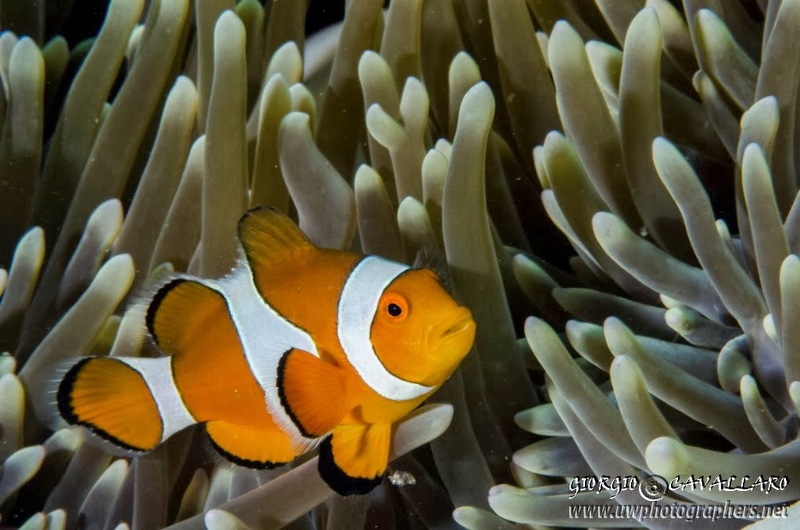 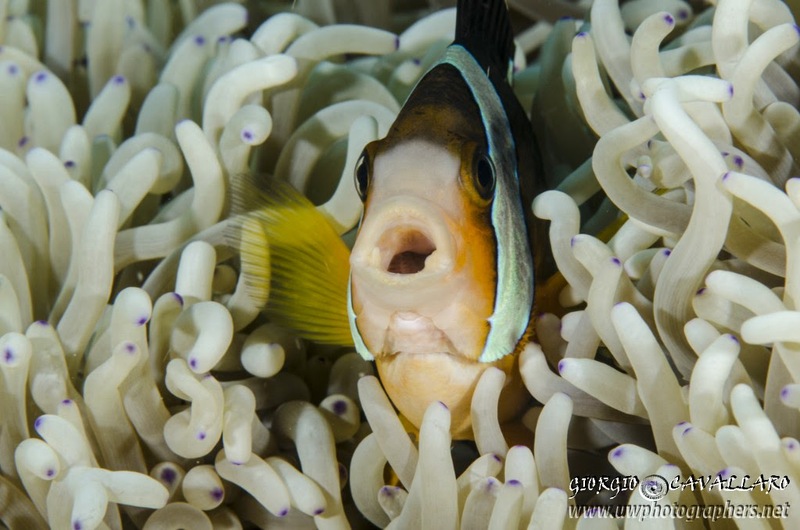 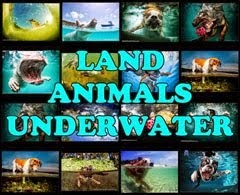 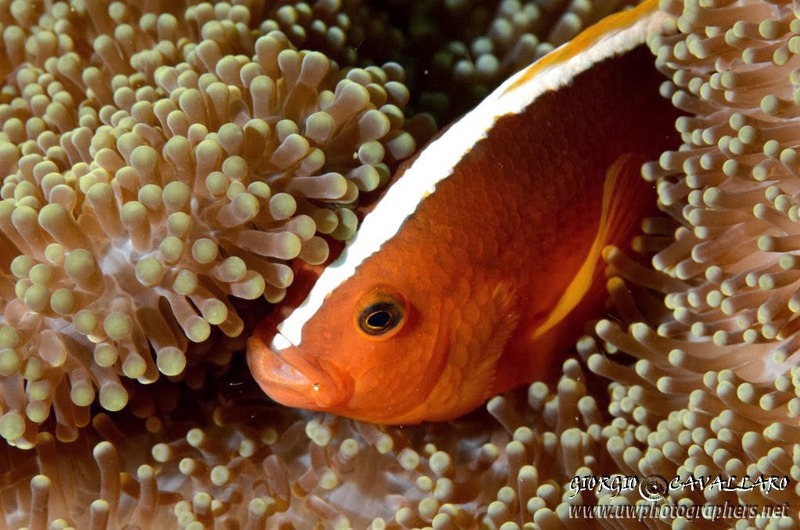 The second dive is even better with electric clams, tropical fishes and stunning coral walls. 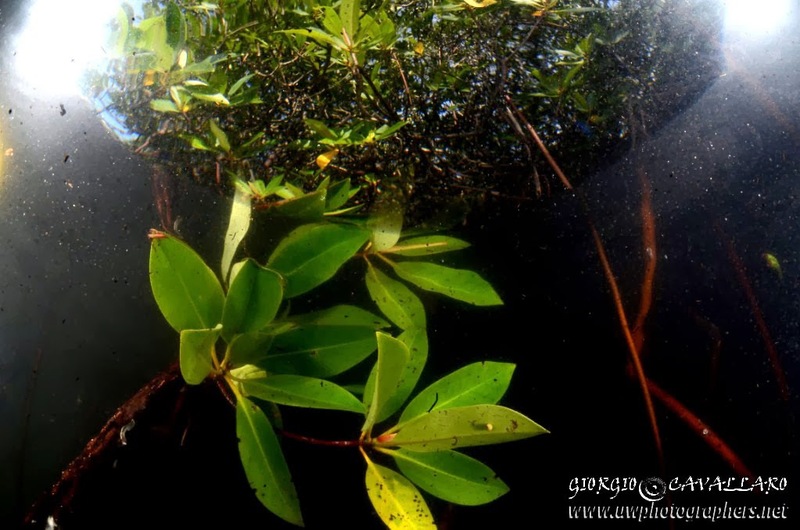 I can even take pictures of a very perculiar mangrove forest. 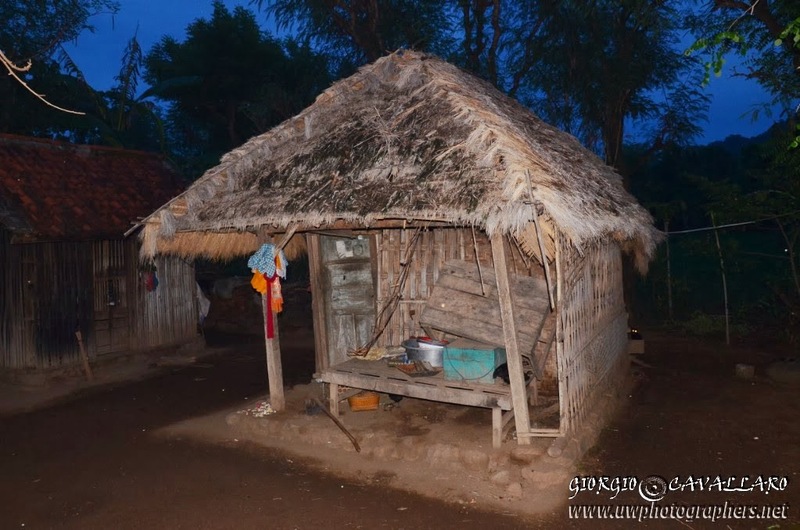 We conclude this further fantastic day with a dinner at a very typical local restaurant where we can taste again the local delicious cuisine. 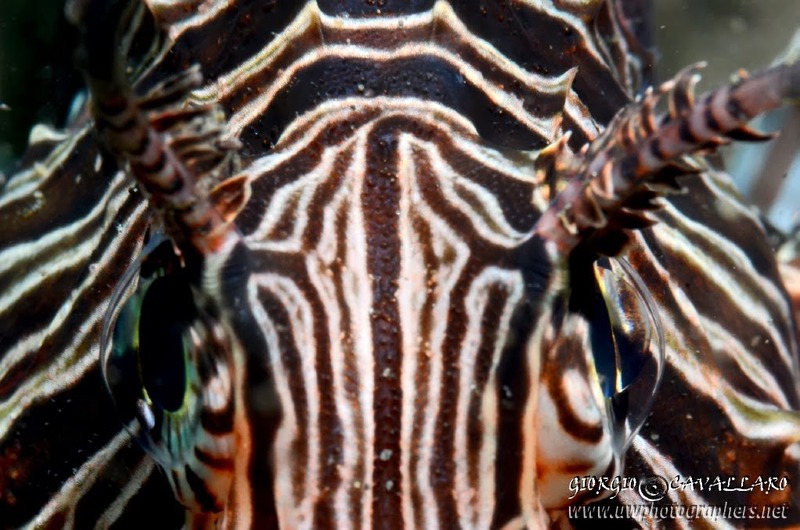 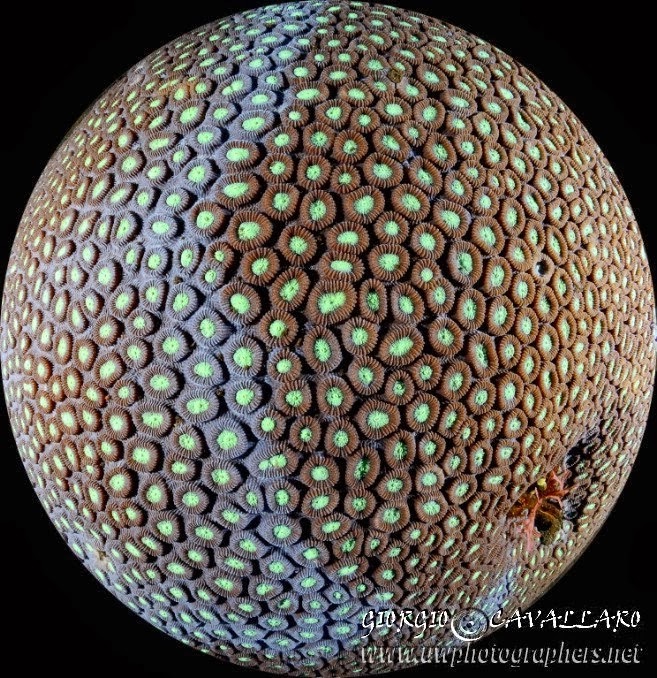 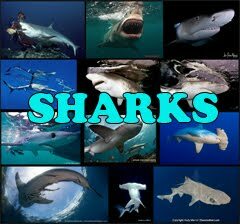 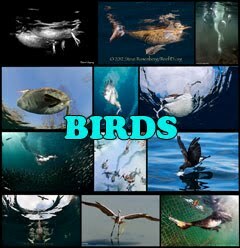 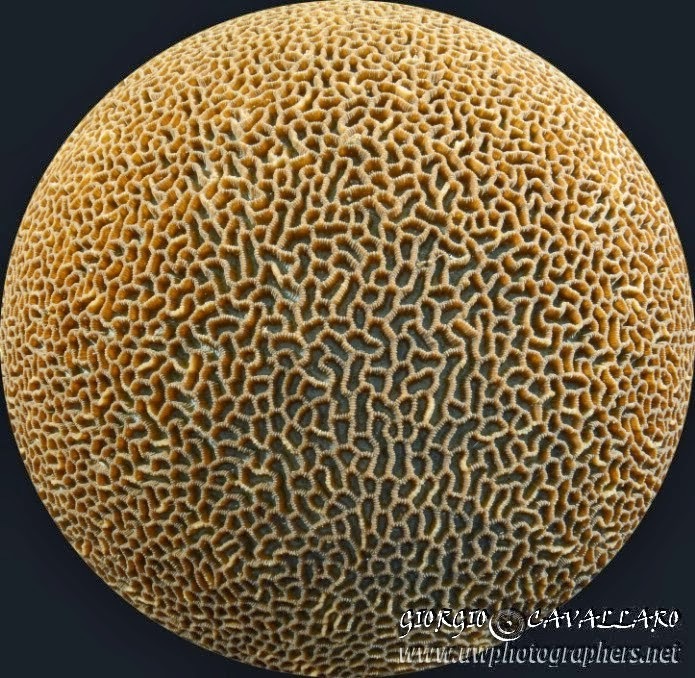 The following day we move to Gilimanuk to look after macro subjects to be photographed. 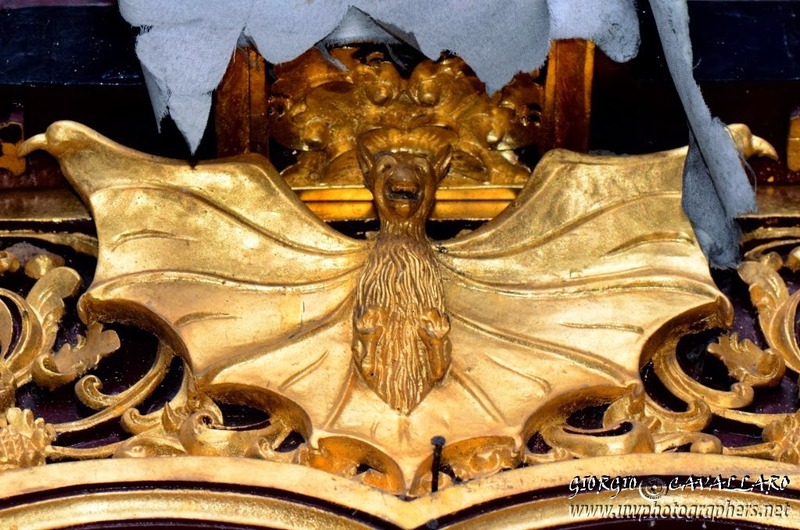 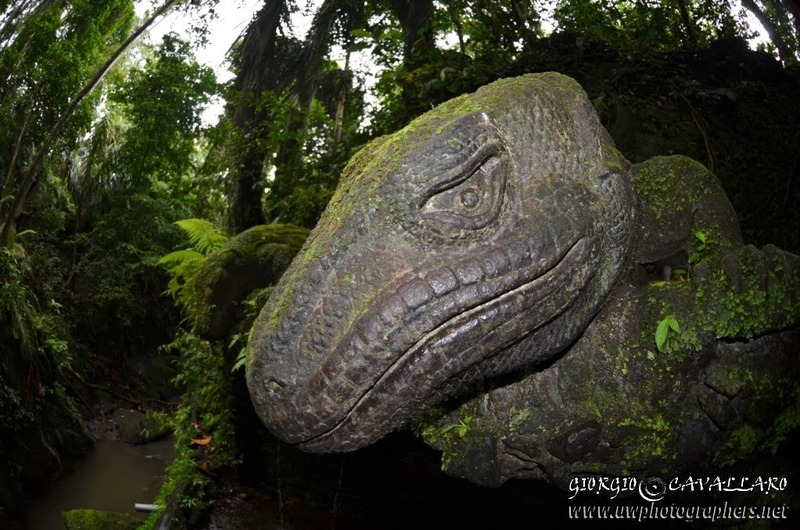 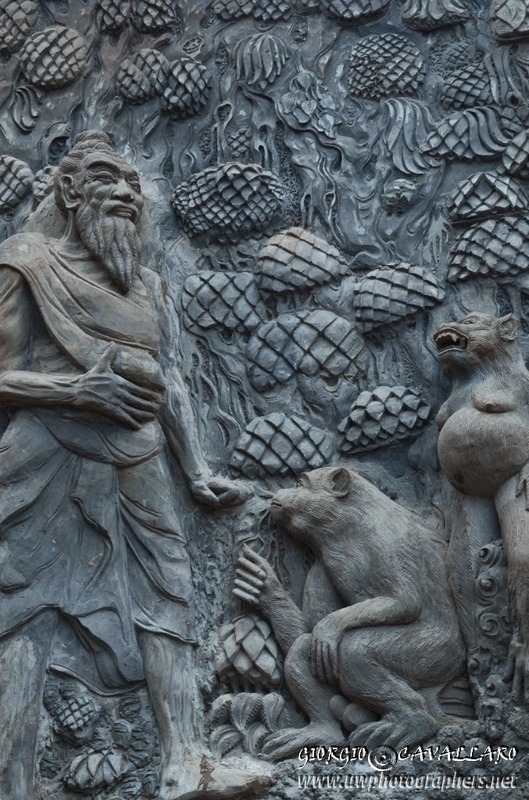 The place is surprising to say the least: it is full of strange creatures to be pictured. 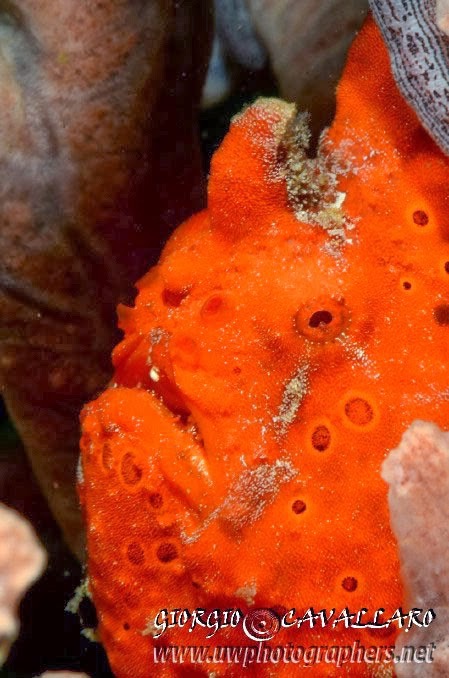 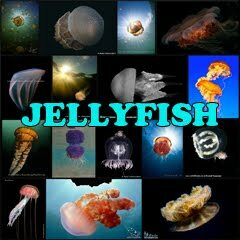 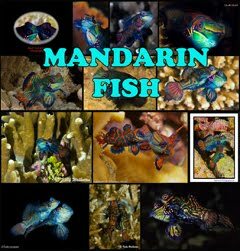 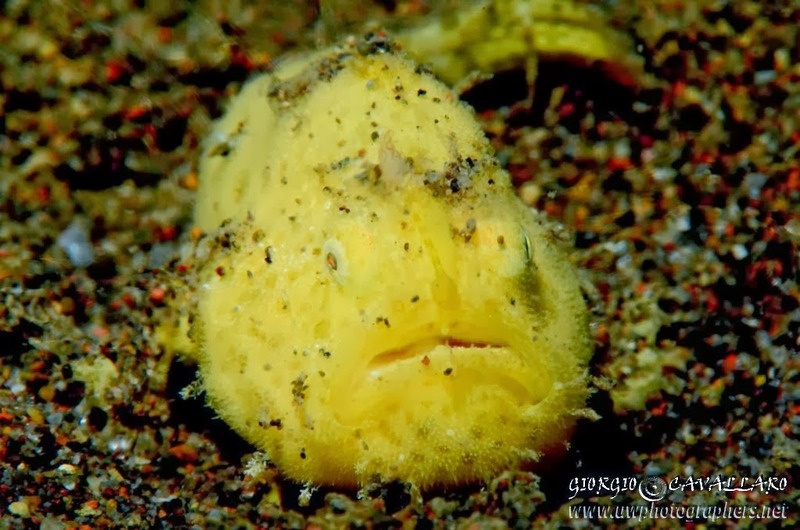 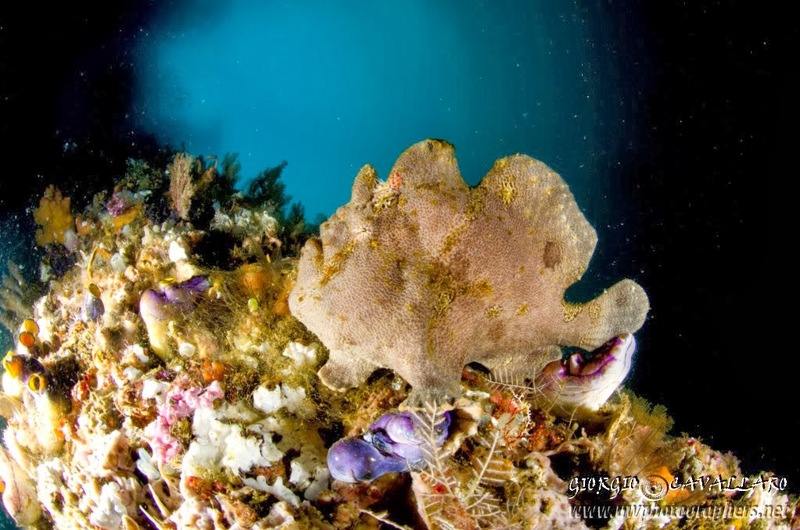 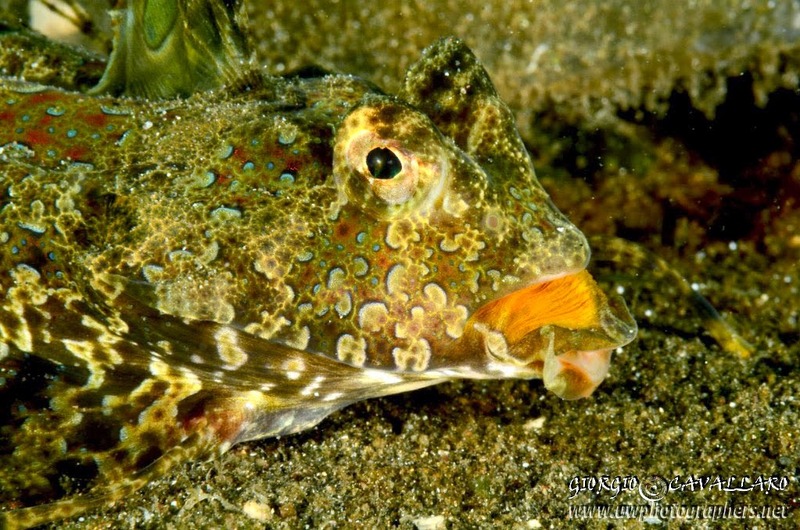 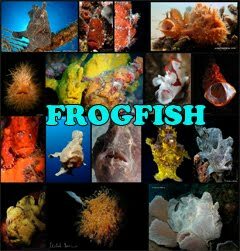 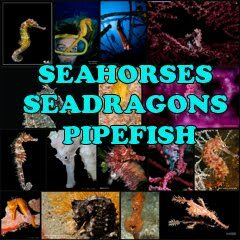 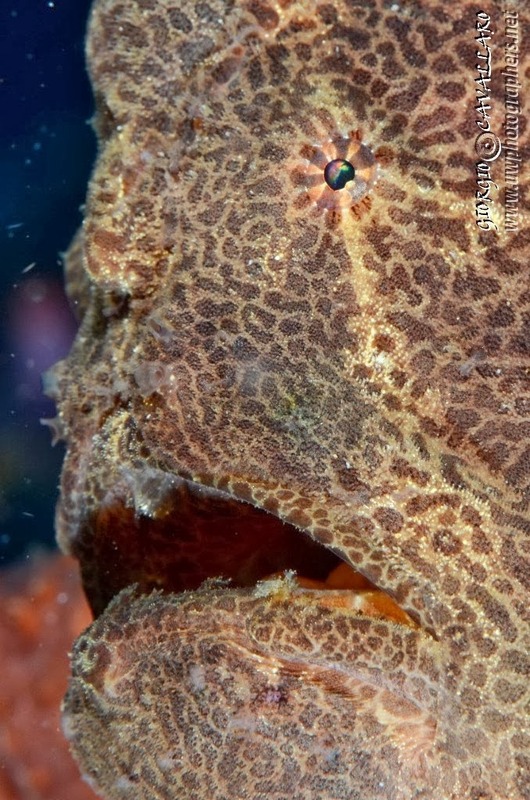 Here we find two frogfishes, various nudibranchs, all kind of gobi, an ornate ghost pipefish, a devil scorpionfish, snakes which have adapted to the sea life, fantastic dragonets, all is simply marveilous!! 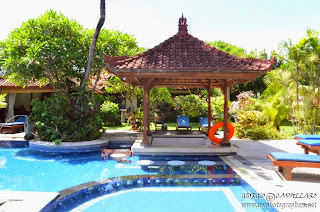 This time we have pizza for dinner and this is not bad at all, however the choice of restaurants in this part of Bali cannot compare to the huge variety of Sanur! 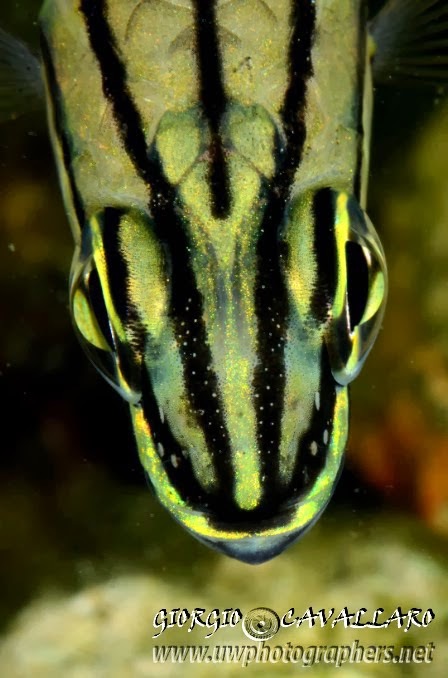 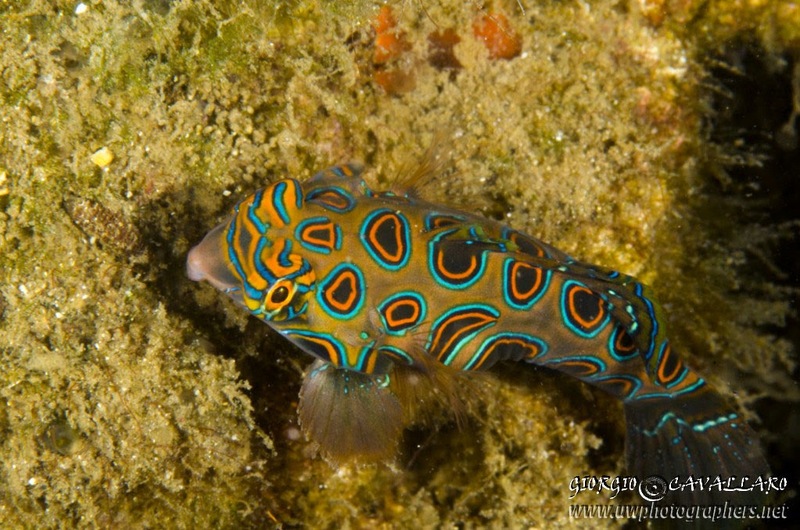 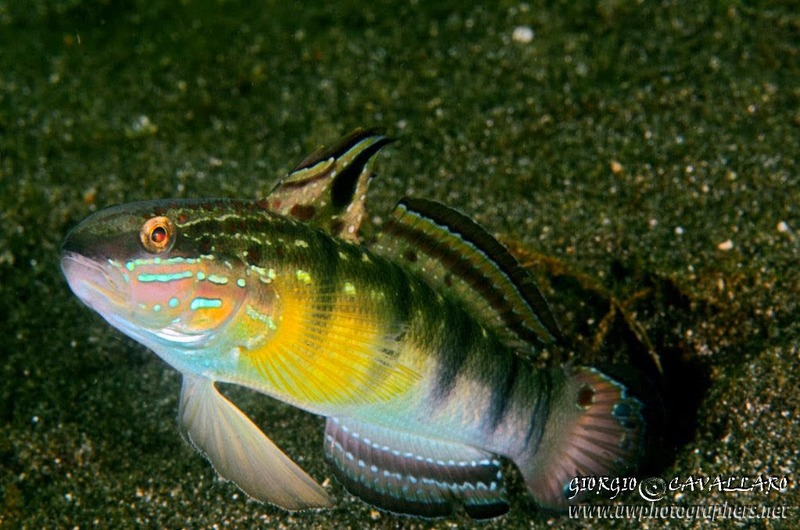 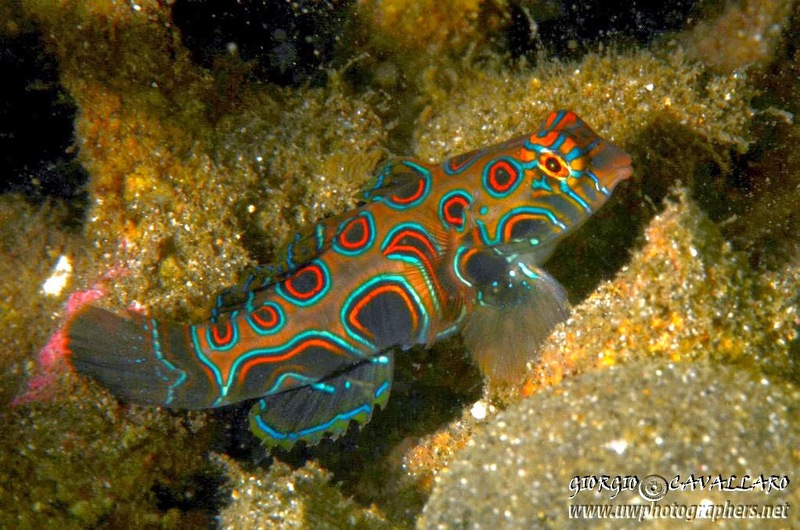 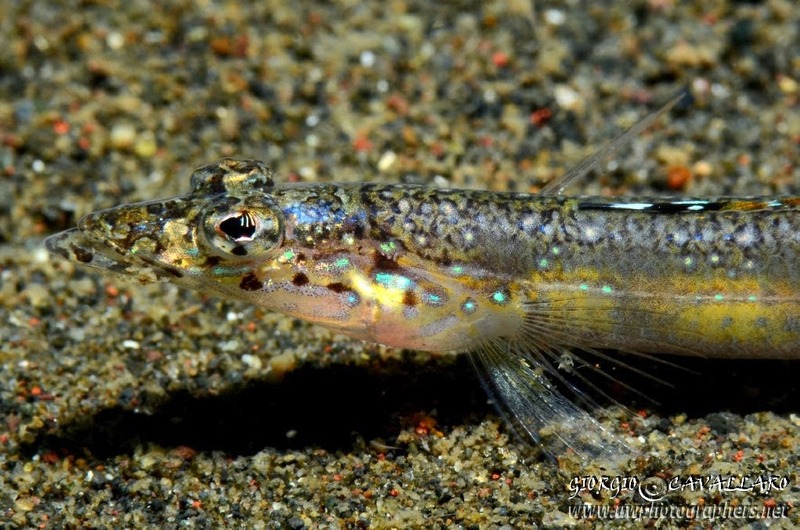 On the day after, Marco and Riza bring me in a secret place they know to show me the bizarre picturesque dragonets! 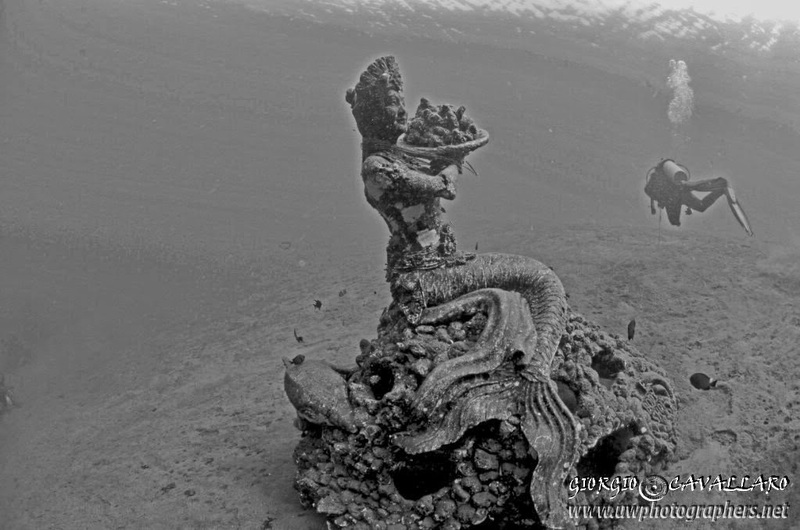 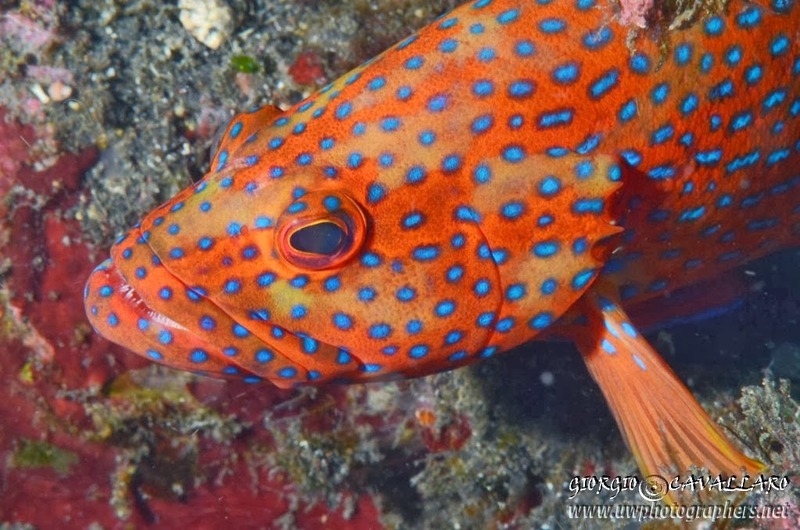 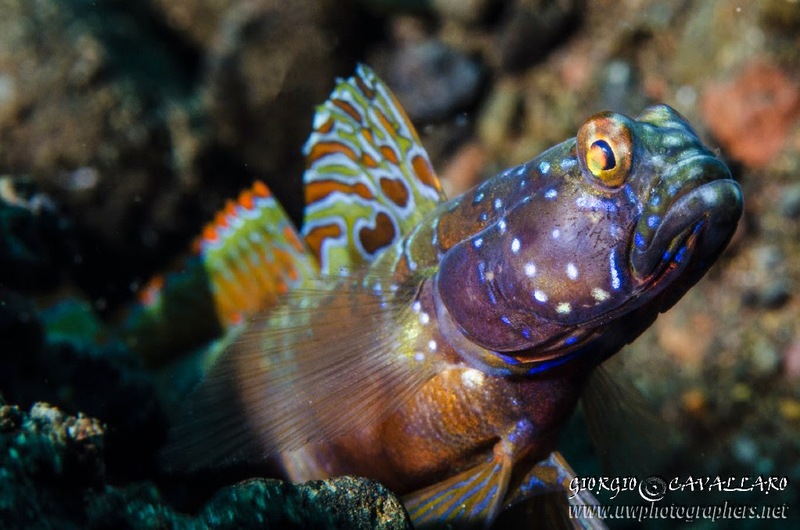 Since the very beginning of the dive, I understand to be in a peculiar place, where little broken corals can be sighted and, after a while, here we are with the first dragonet! After less than ten minuts... we discover several others floating together with very strange nudibranchs and different kinds of gobies. 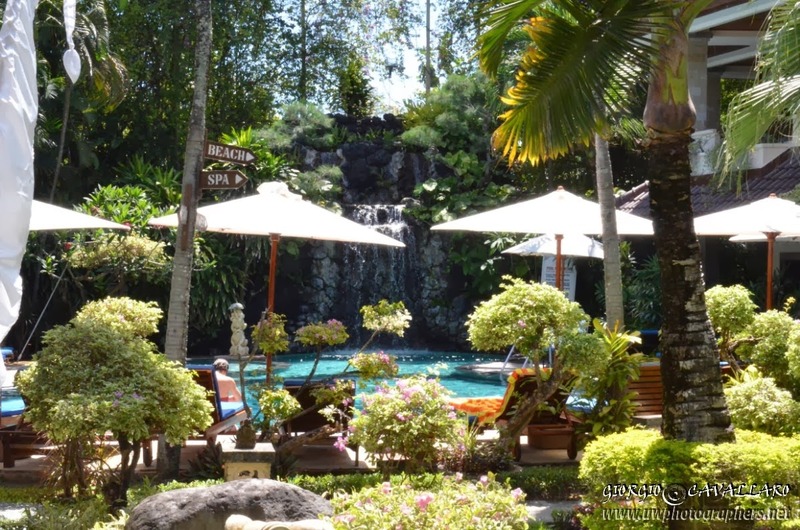 It is the perfect ending of another unforgettable day. 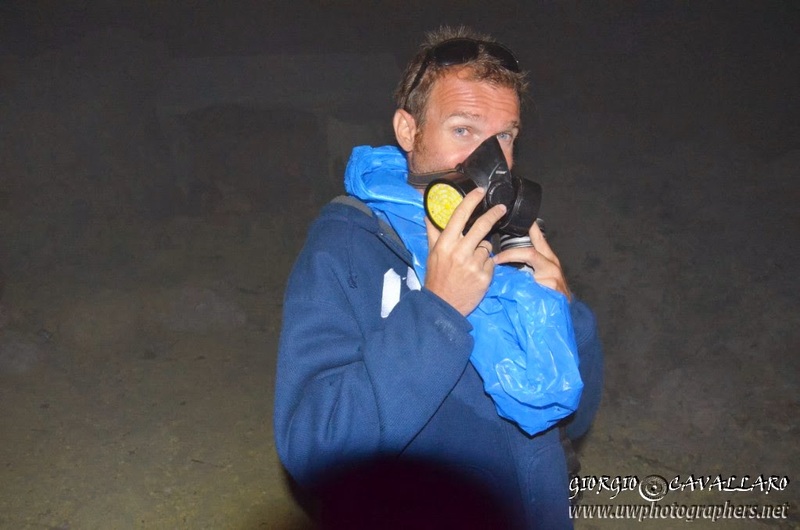 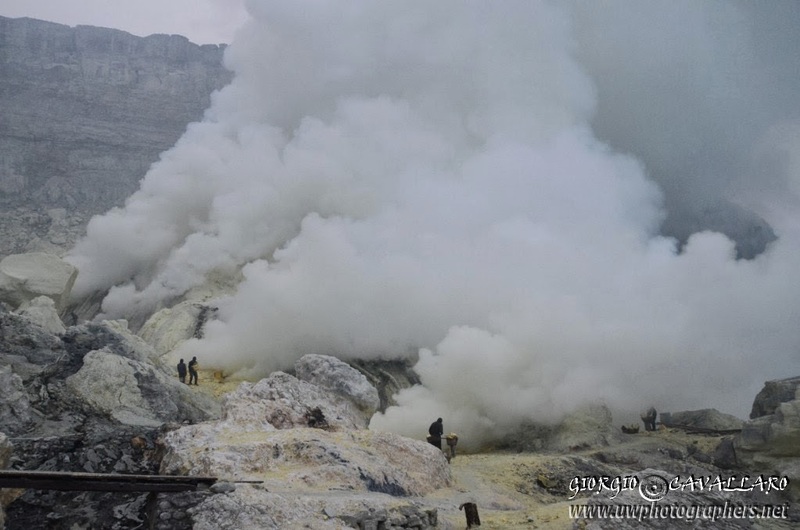 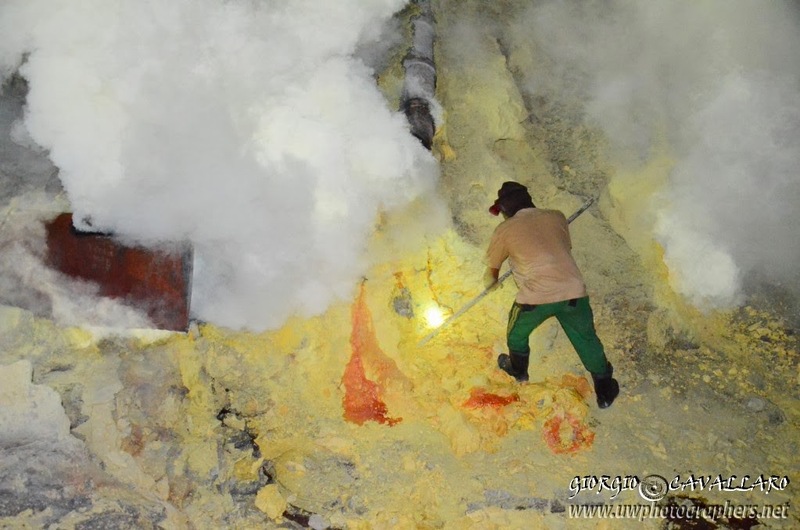 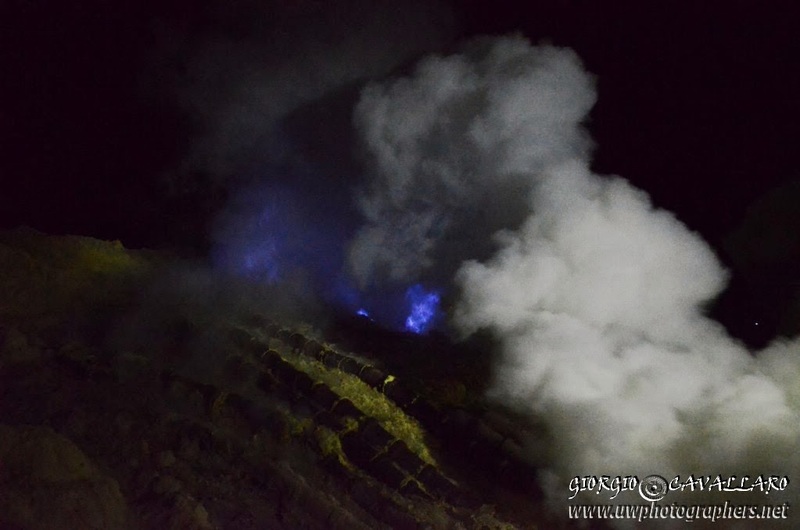 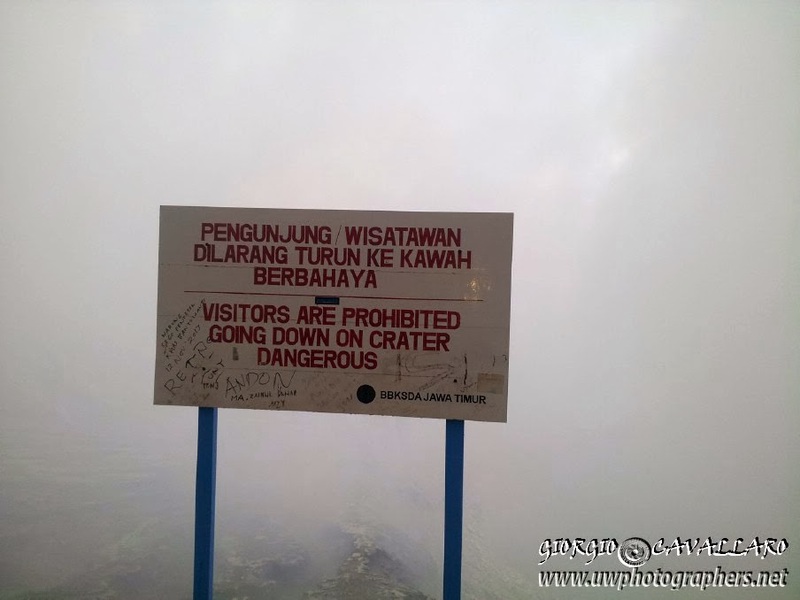 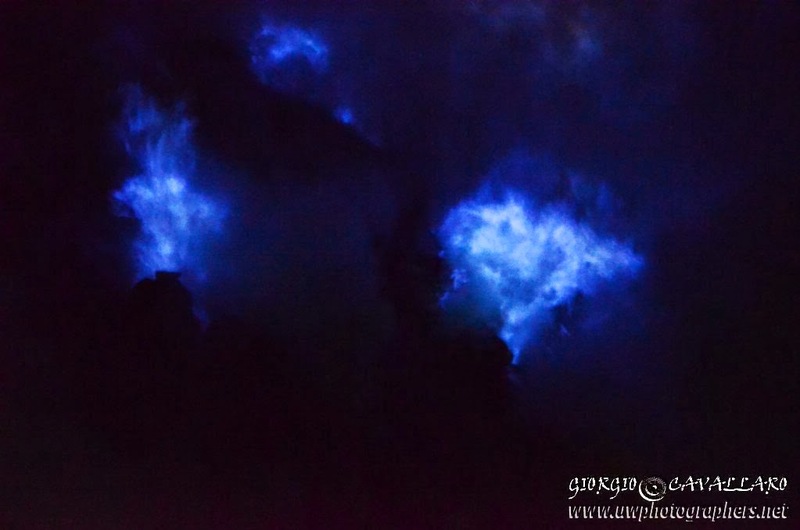 With Marco we decide than to visit the Kawa Ijen Java volcano with a sulphur lake inside. 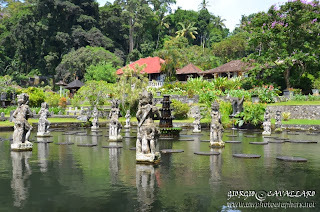 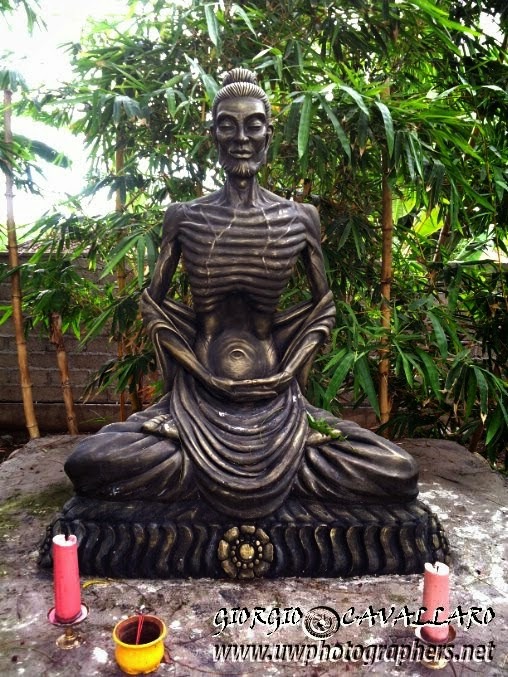 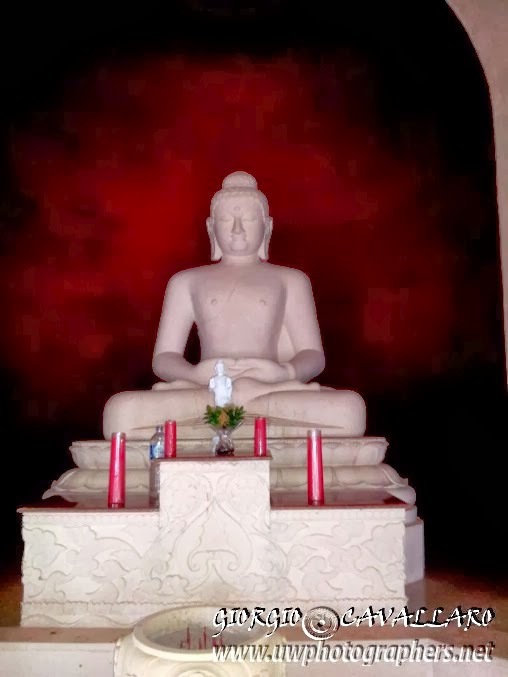 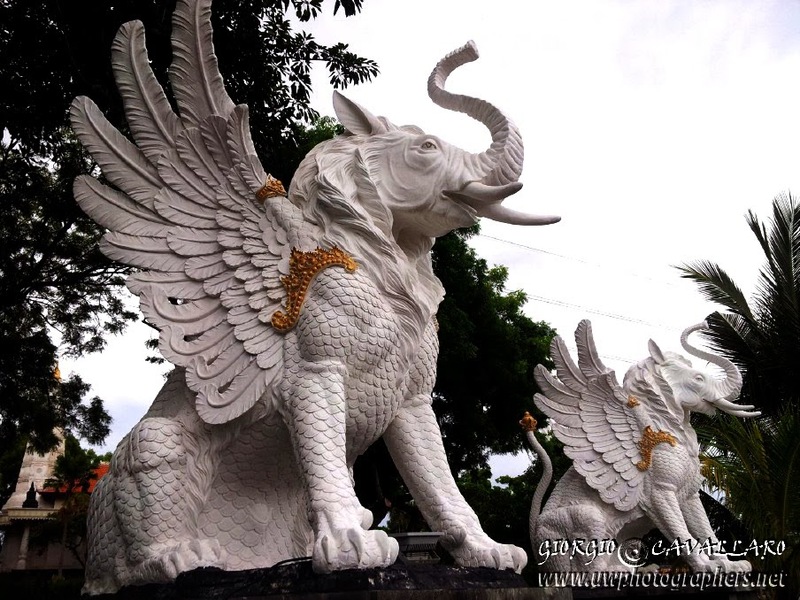 But before, we do not miss a visit to the Gilimanuk temple with a majestic Buddah inside. 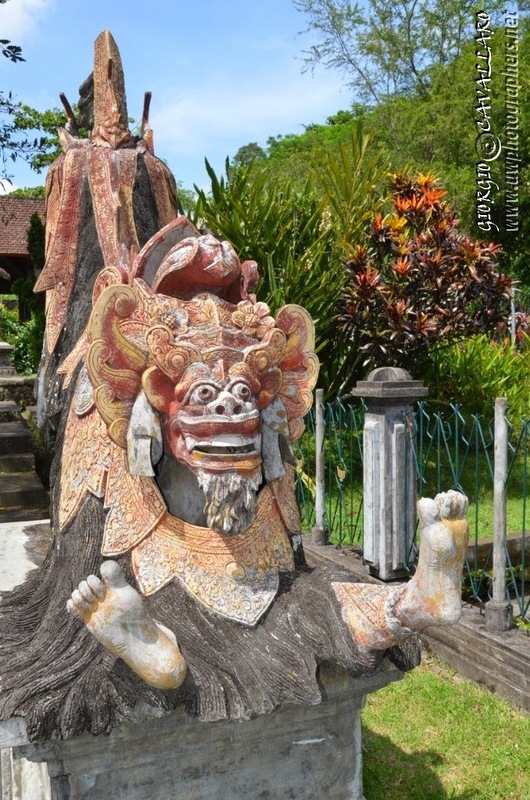 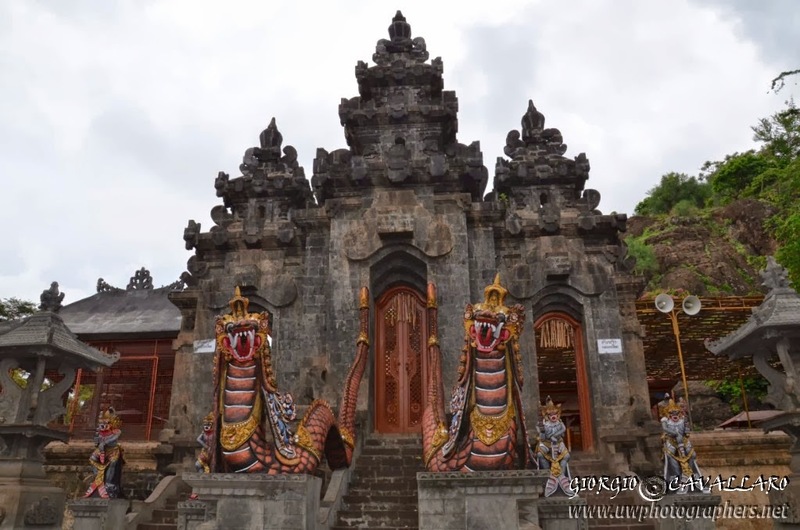 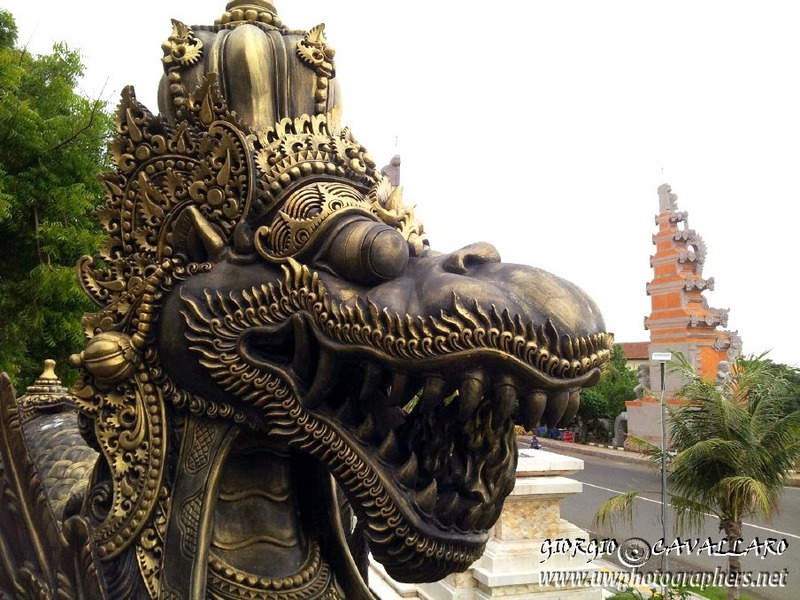 The atmosphere is suggestive, two dragons are guarding the temple but it is now time to take our ferry to Java (tickets less than one euro) for the two hours trip to the volcano. 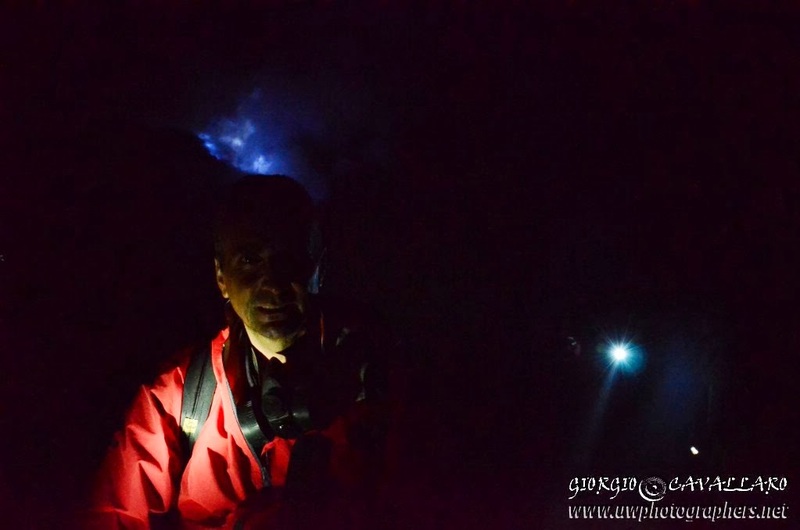 We start very early in the morning with a jeep bringing us at the base of the volcano. 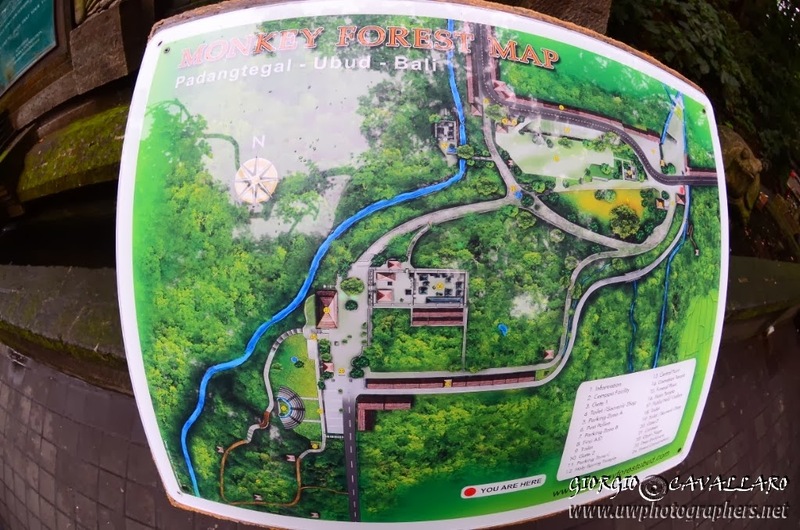 We walk for about two hours accompanied by a local guide telling us that black panthers still live in the area which is effectively very wild. 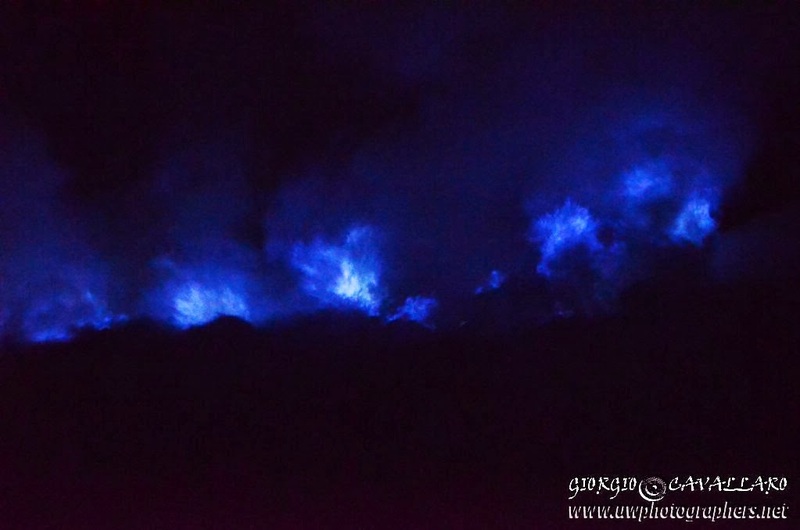 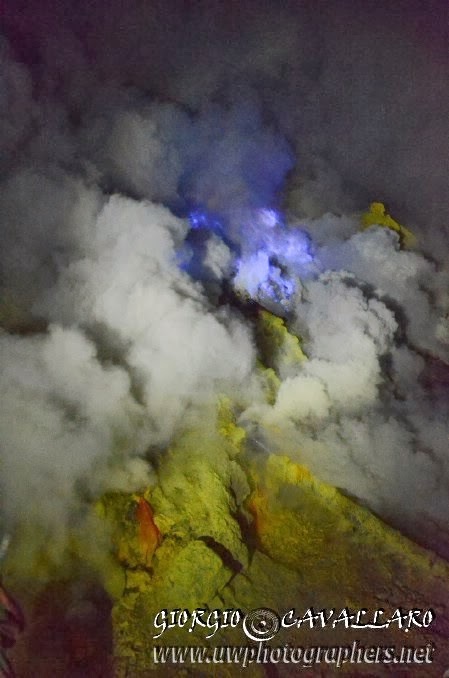 At the end we receive the prize of a spectacular view: the sulphurous vapors is causing blue flashes in the dark, lightening the volcano's walls... a real joy for the eyes and my camera! 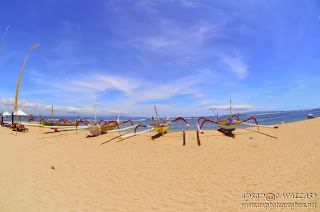 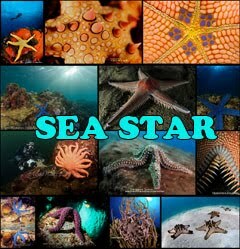 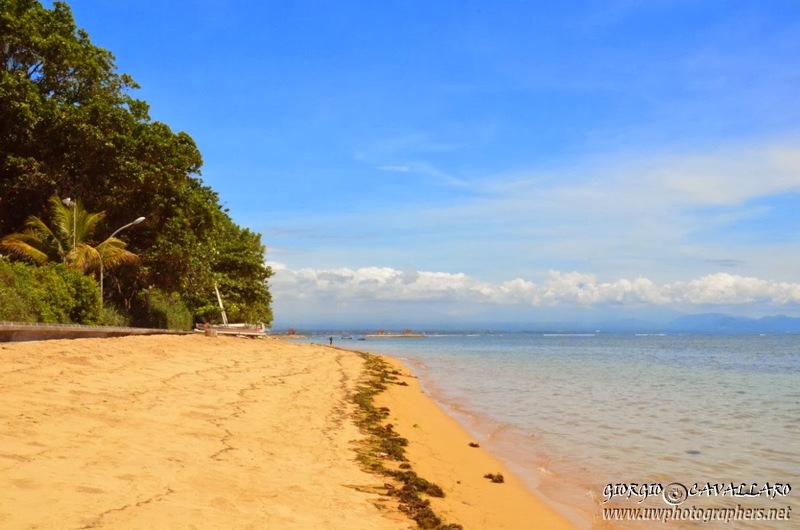 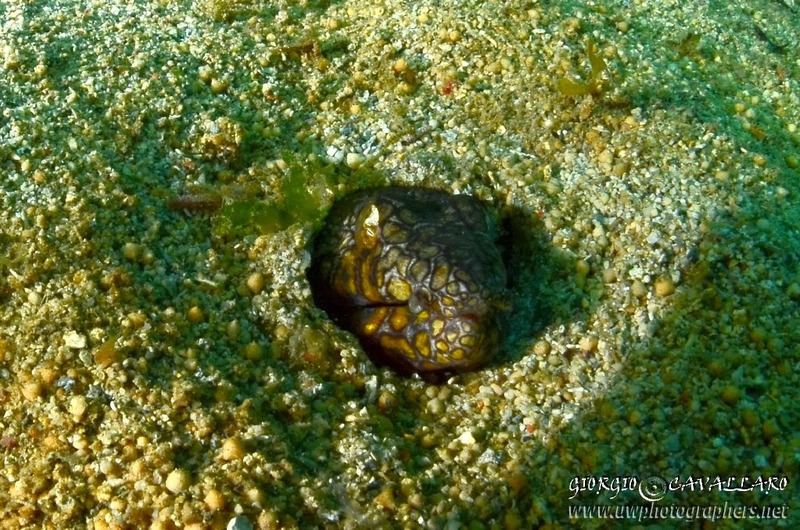 Back to Sanur, we go to Padang Bay to search for very rare and peculiar critters. 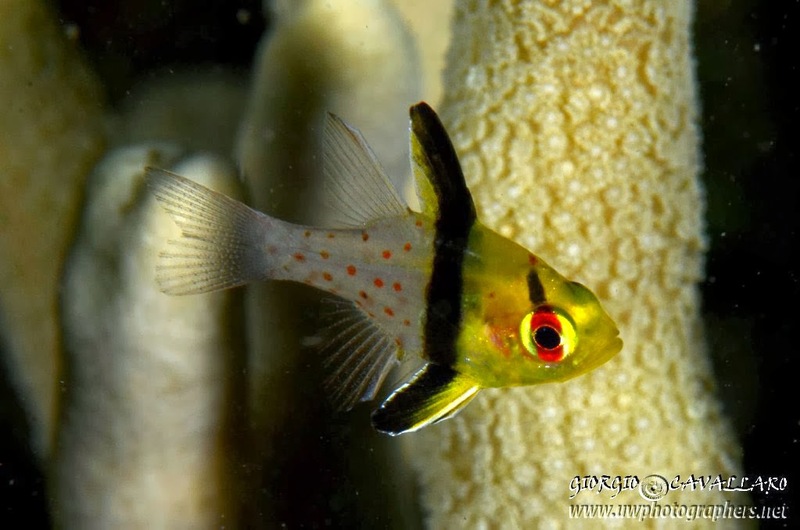 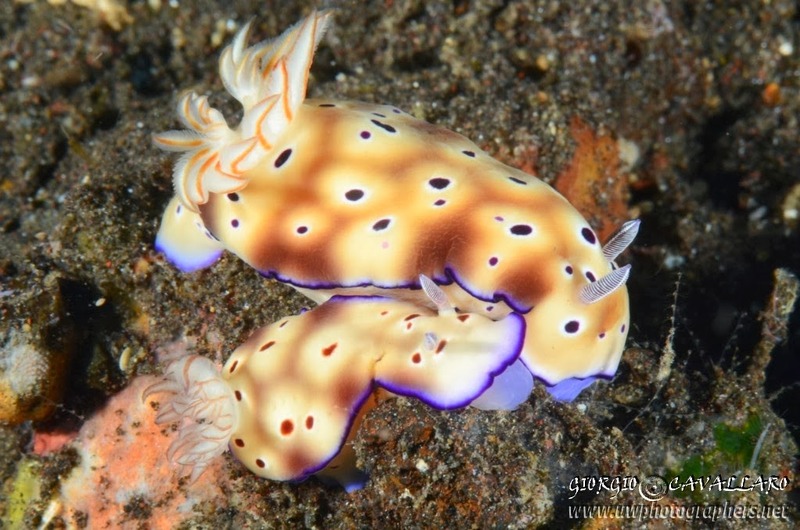 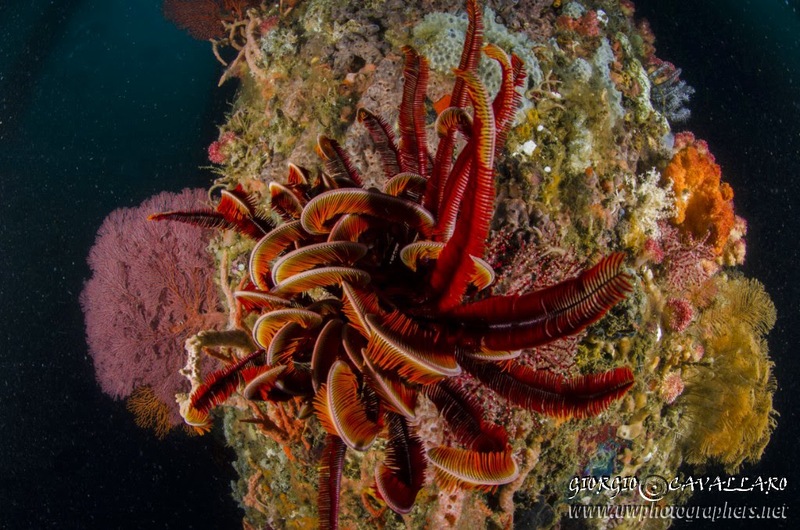 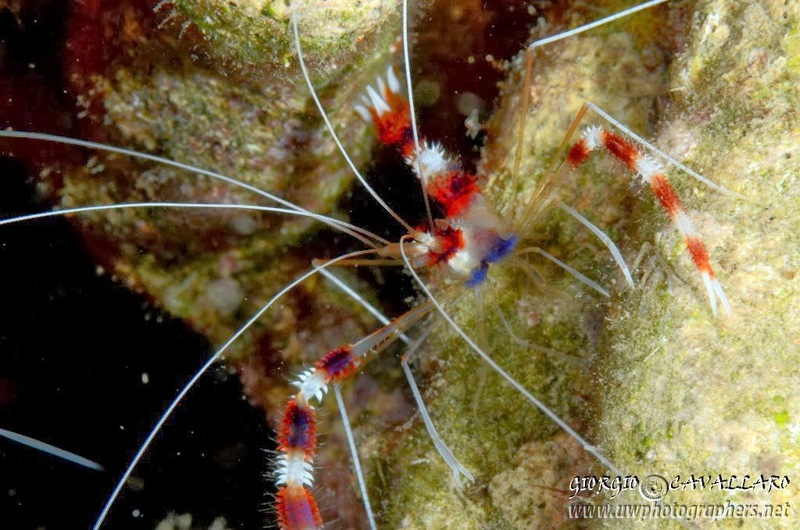 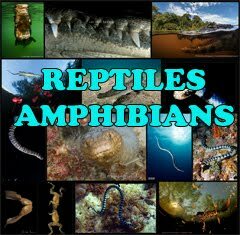 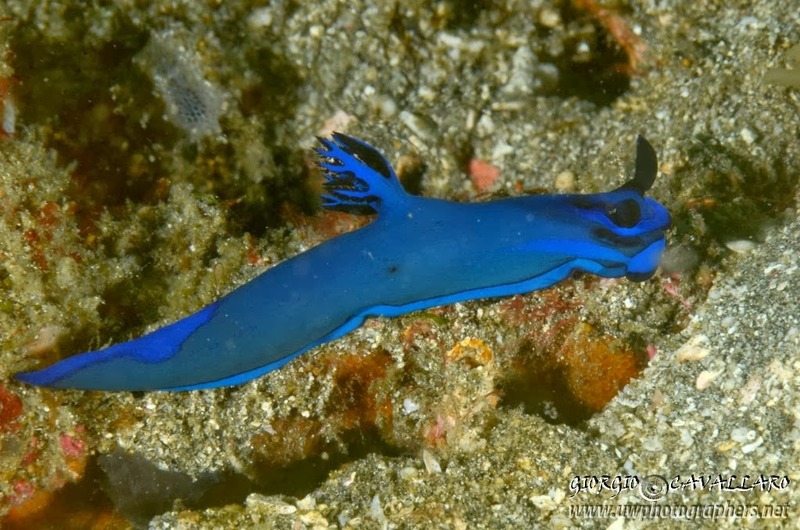 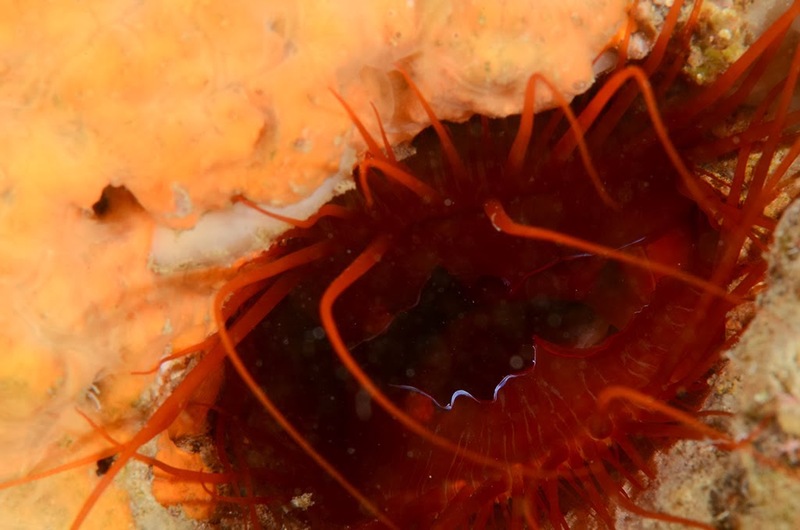 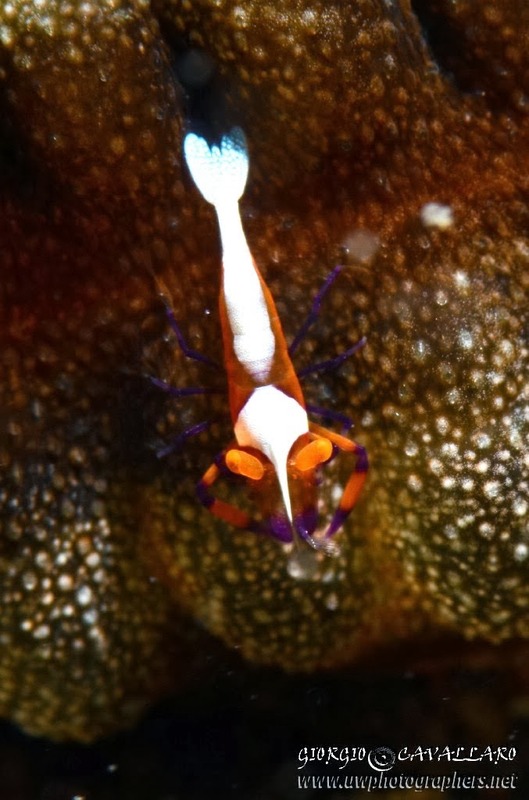 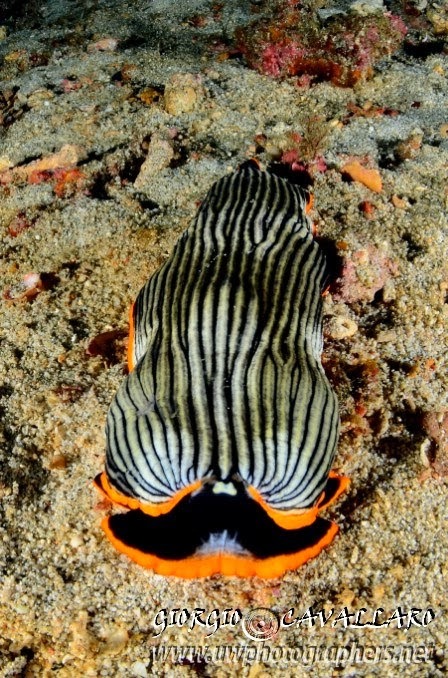 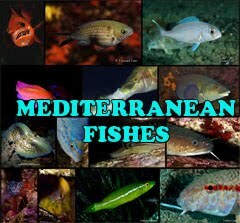 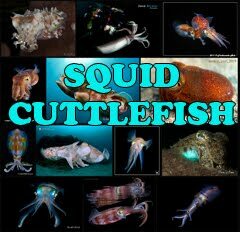 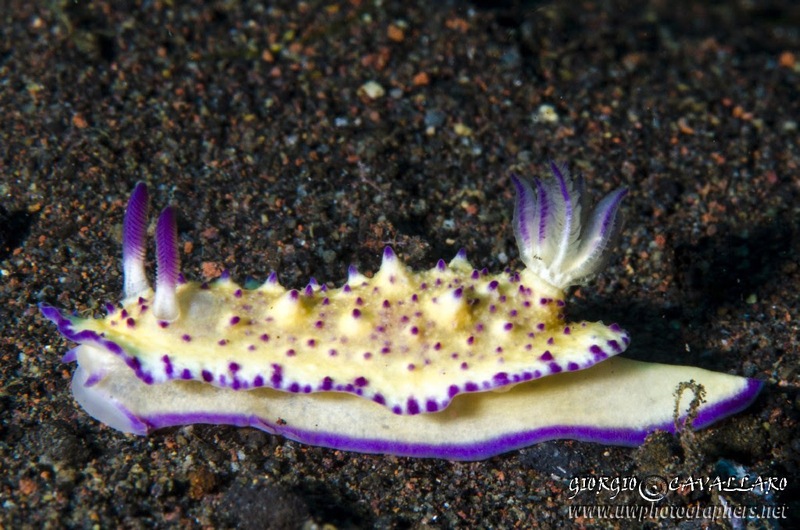 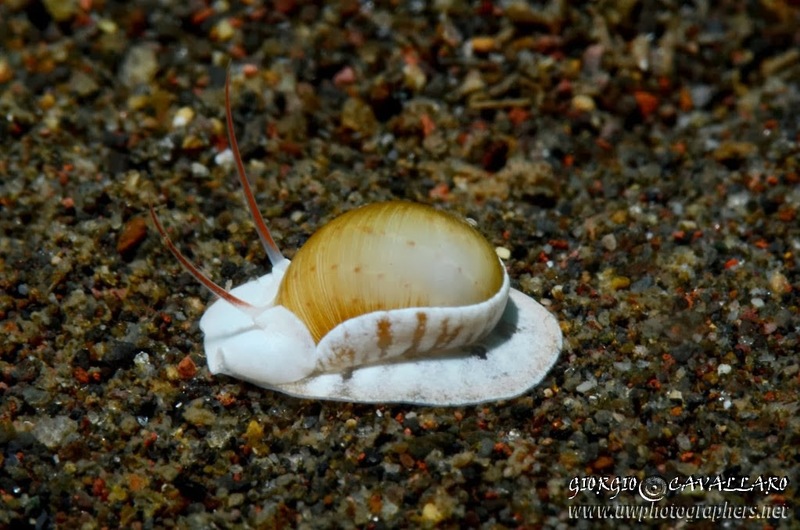 The place satisfies our expectations: very interesting critters are sighted such as very strange nudibranchs, xeno crabs, leaf fishes, and coral is very interesting. 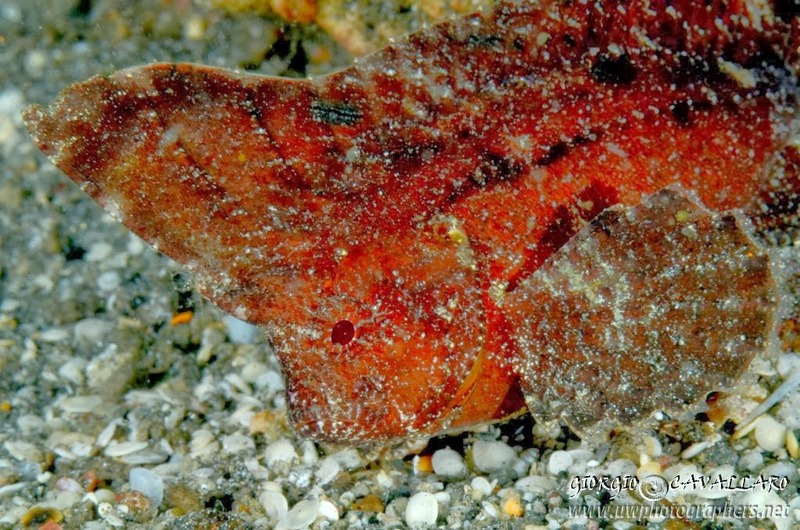 The second dives reserves for us pipefish of all kinds and a giant frogfish. 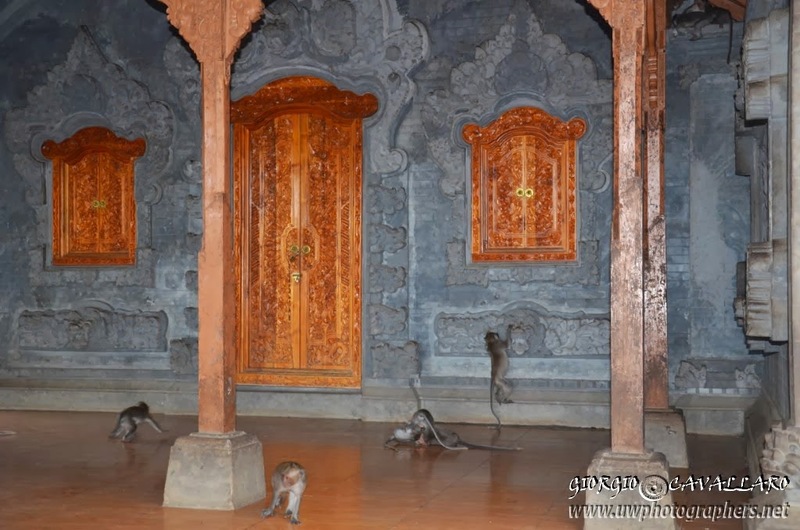 A quick lunch with tasty baguettes and then to Goa Lawah bat temple. 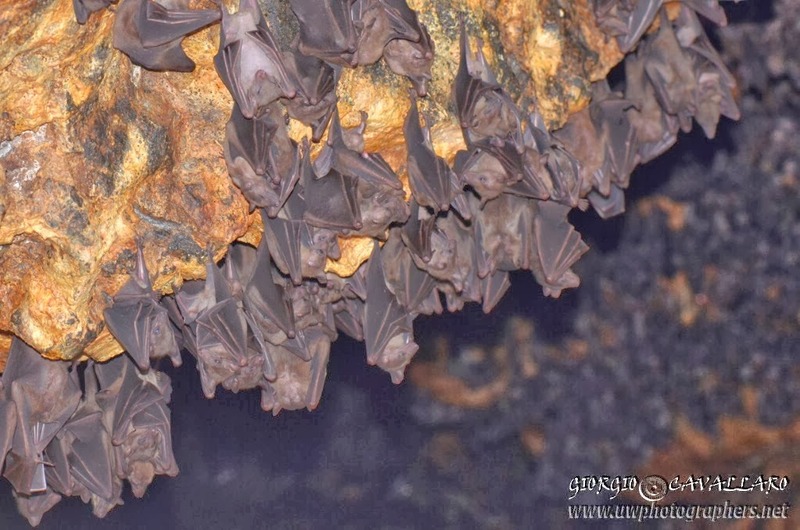 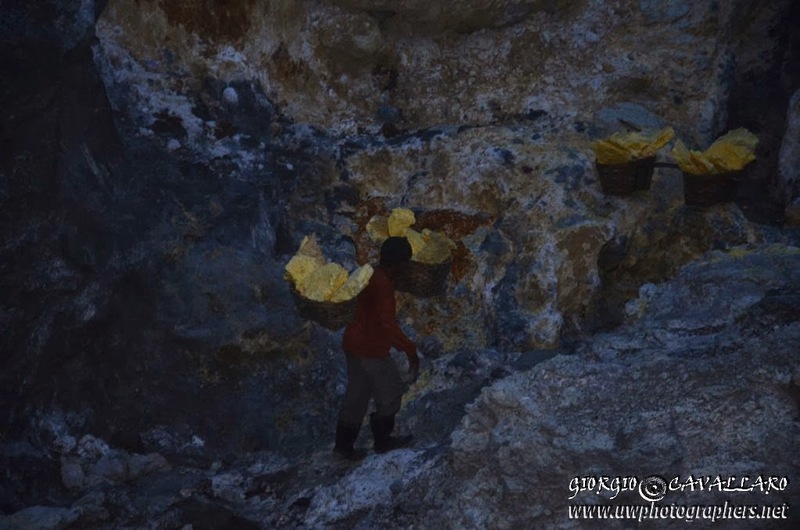 The atmosphere is very spiritual and a cave full of bat can be observed. 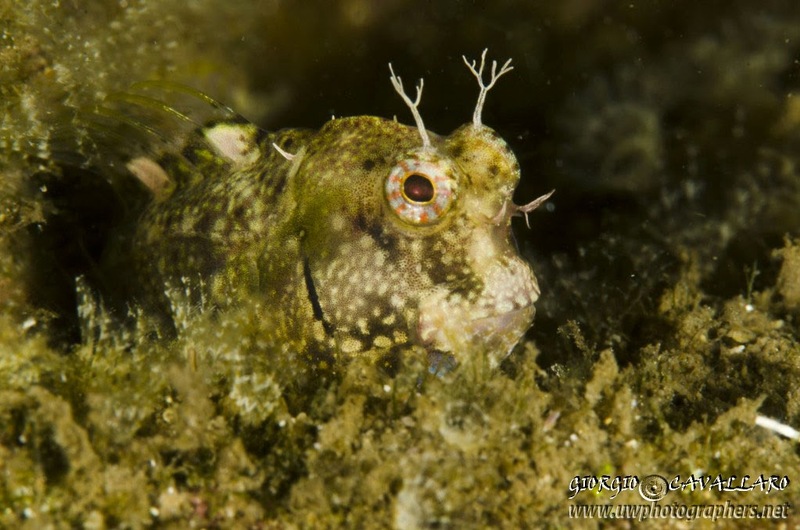 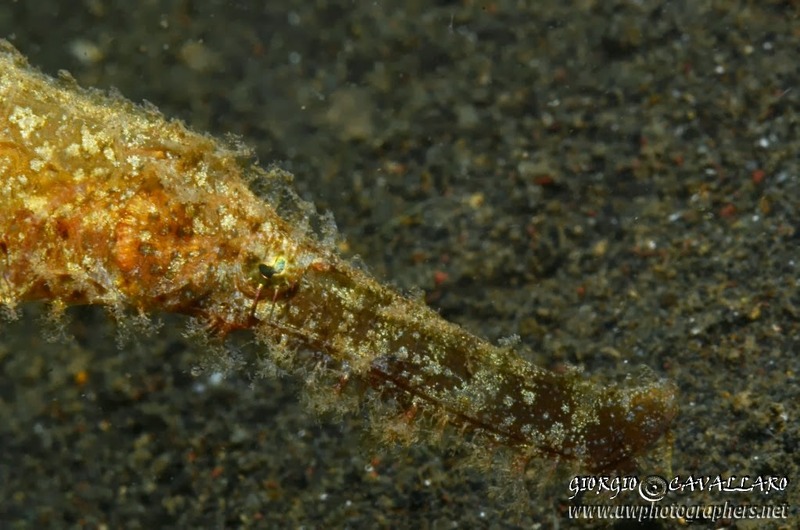 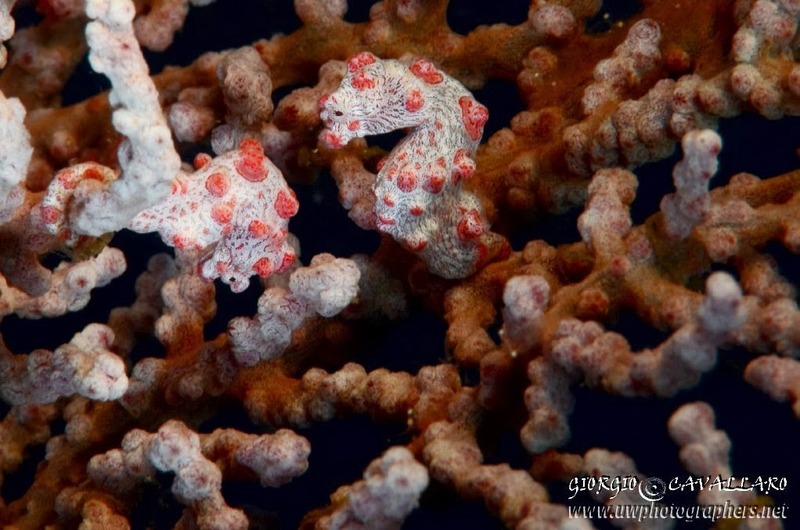 We then decide to go back to Amed to take further pictures of the pygmy seahorses together with another frogfish. 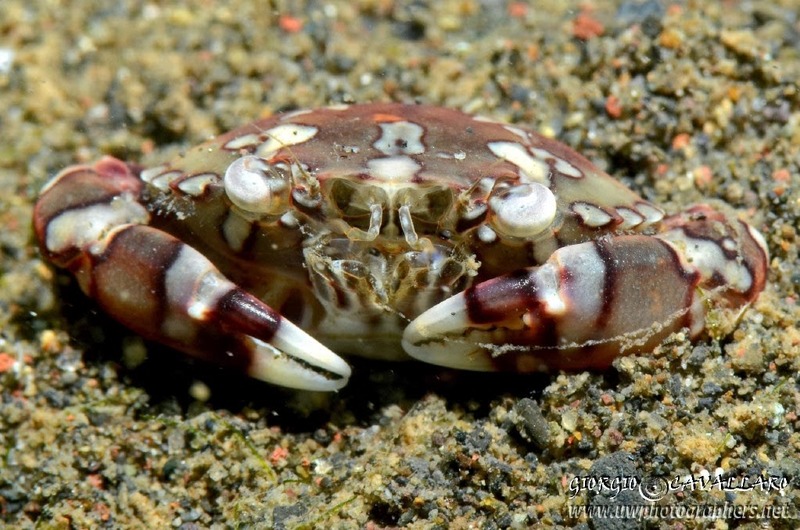 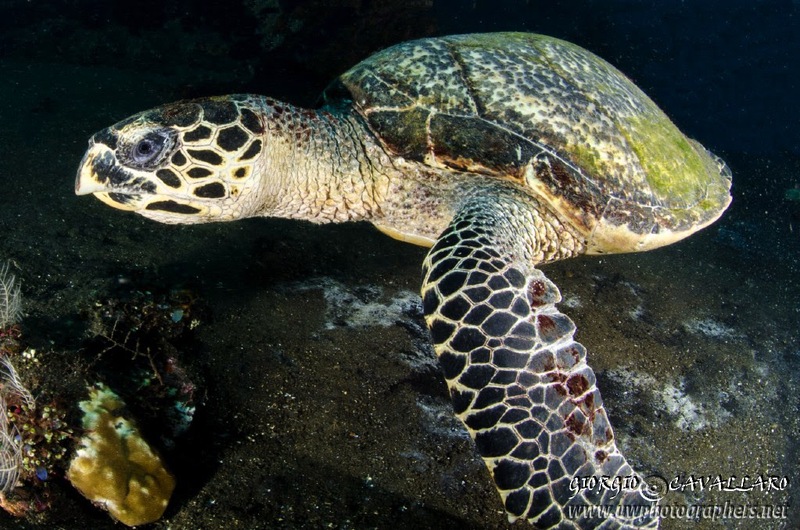 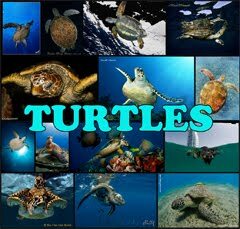 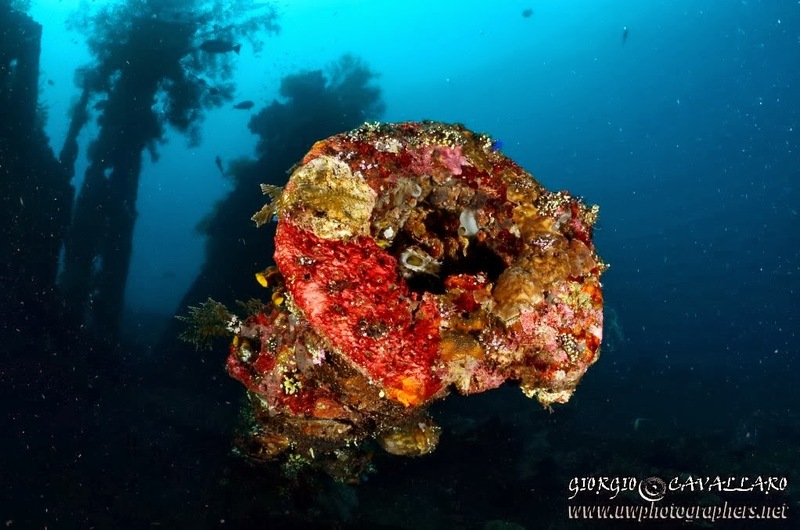 Amed is just 15 minutes drive from Tulamben and we therefore come back there, where we can find subjects which we could not find before such as beautiful tiger shrimps, an impressive hawsbill turtle and a black tip reef shark. 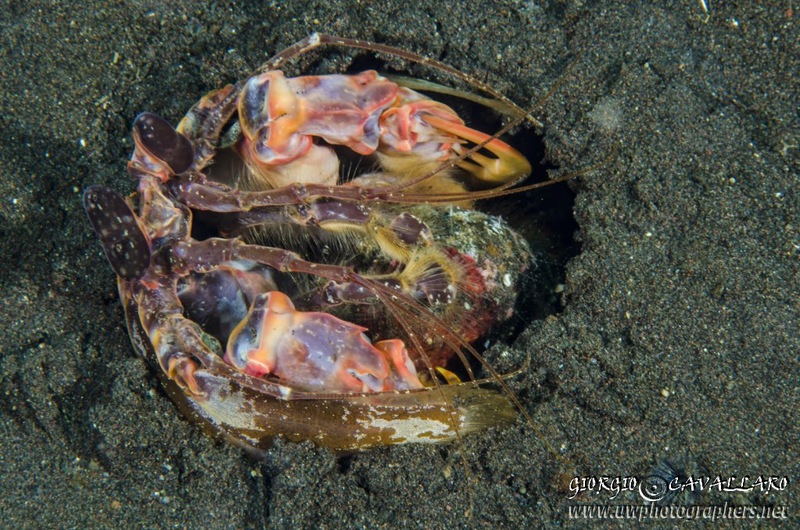 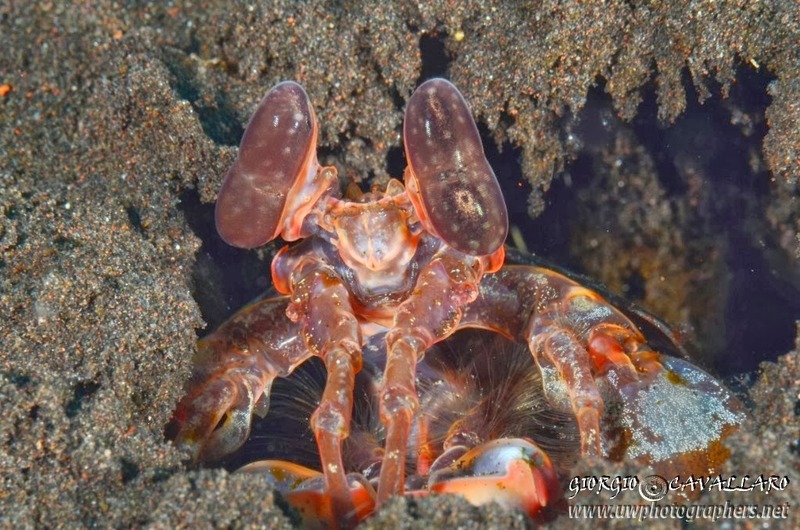 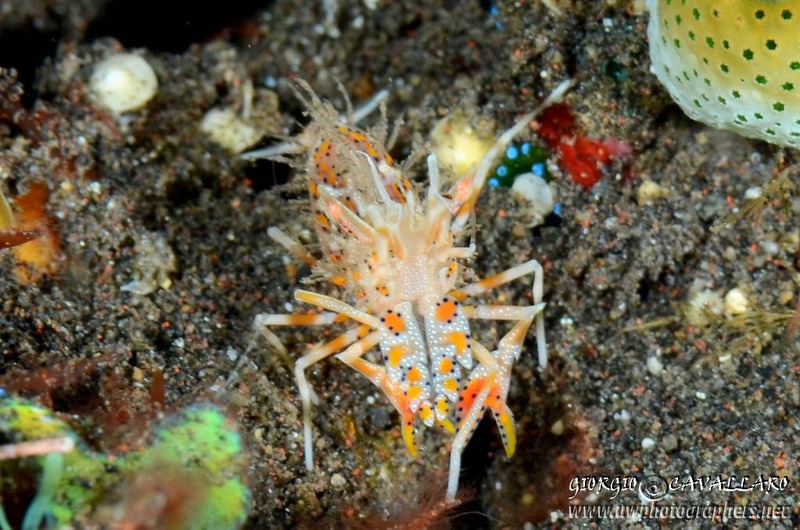 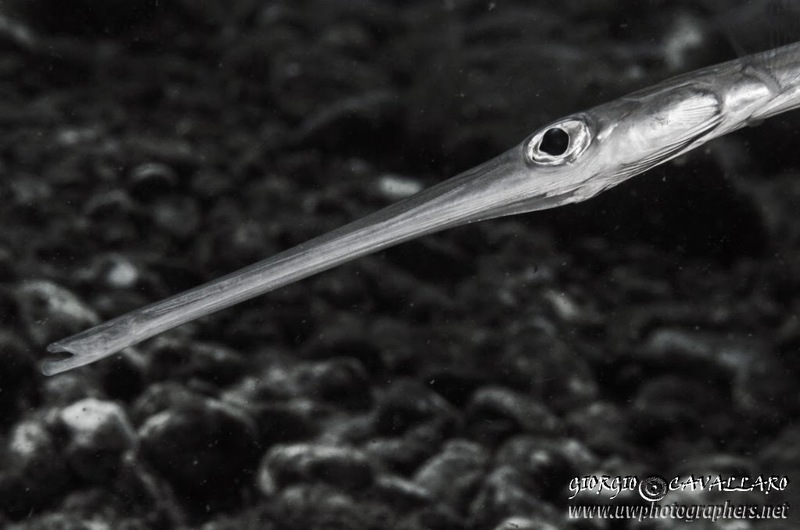 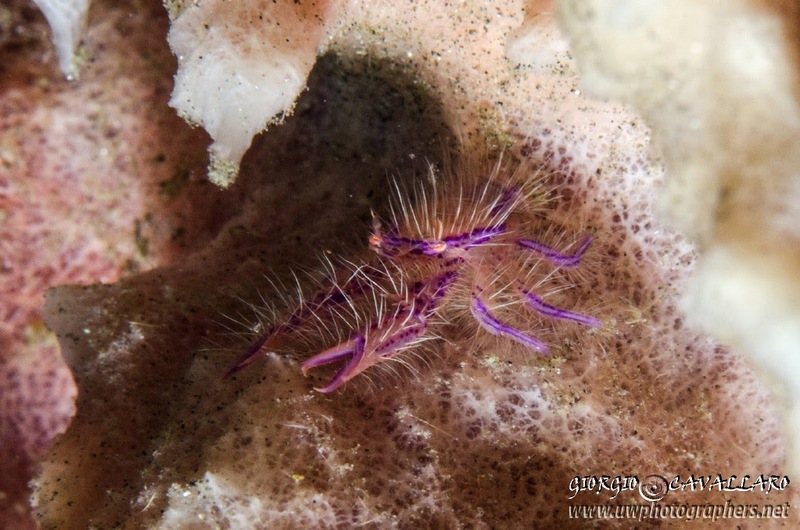 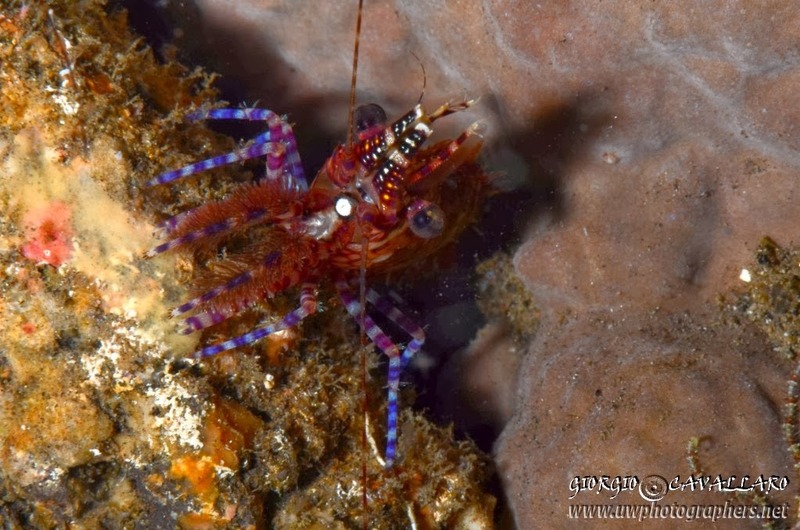 The sunset dive offers little shrimps of any kind and species! 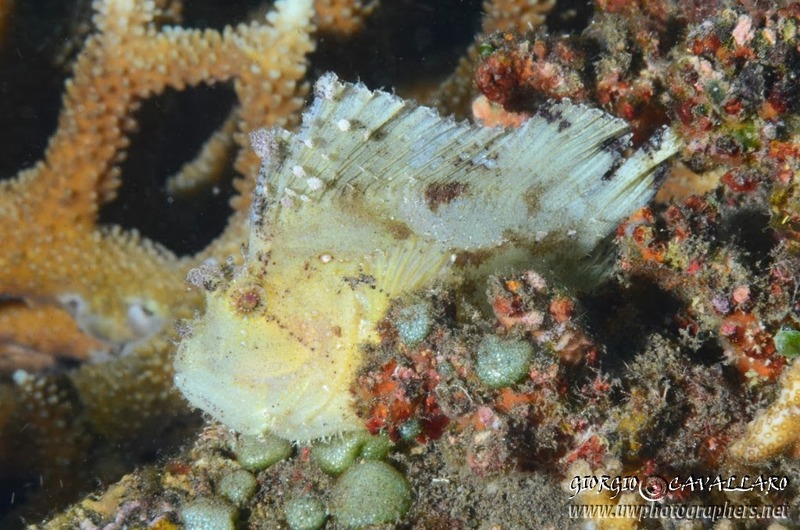 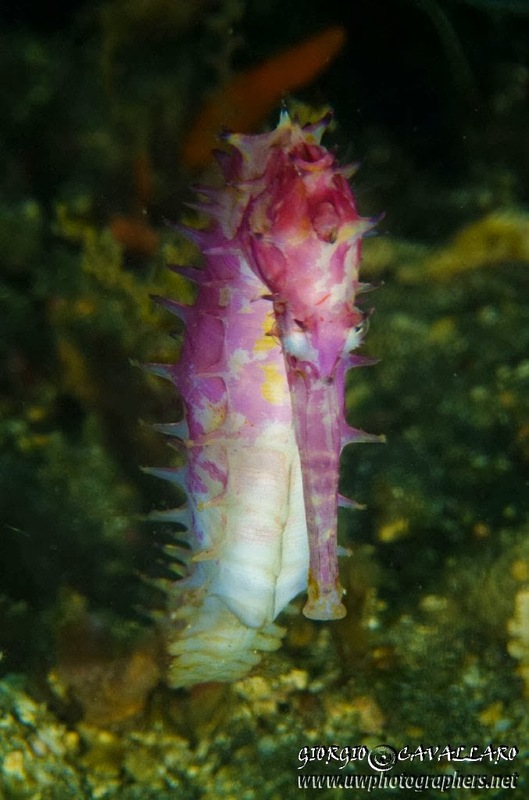 After staying a night in Tulamben, we go back to Padang Bay where this time we are so lucky to find a spectacular thorny seahorse, various nudibanchs, mantis shrimp and again a giant frogfish! 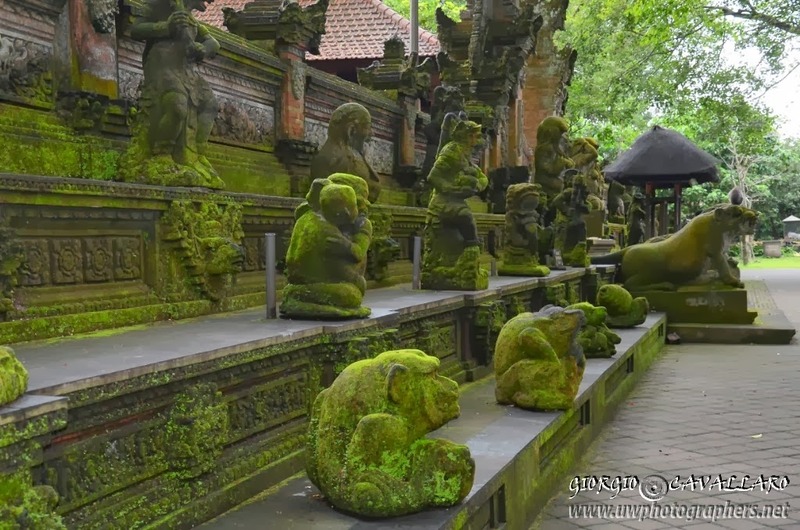 The following day we visit probably the most important cultural and handycraft centre of Ubud to explore the monkey forest and incredible terrace rice fields! After the wonderful time in Ubud, we go to volcano Batur with the internal lake delimiting the sacre village of Kintamani. Regretfully I could not use my camera but hopefully the picture hereunder take with my mobile phone gives an idea of the stunning landscape. 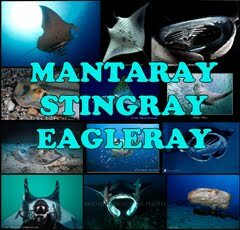 With much regret we have reached the final day before my departure and we decide trying our luck with manta rays! We therefore go to Nusa Penida, an island with high vertical rock walls which remind me of New Zealand or Capri cliffs! 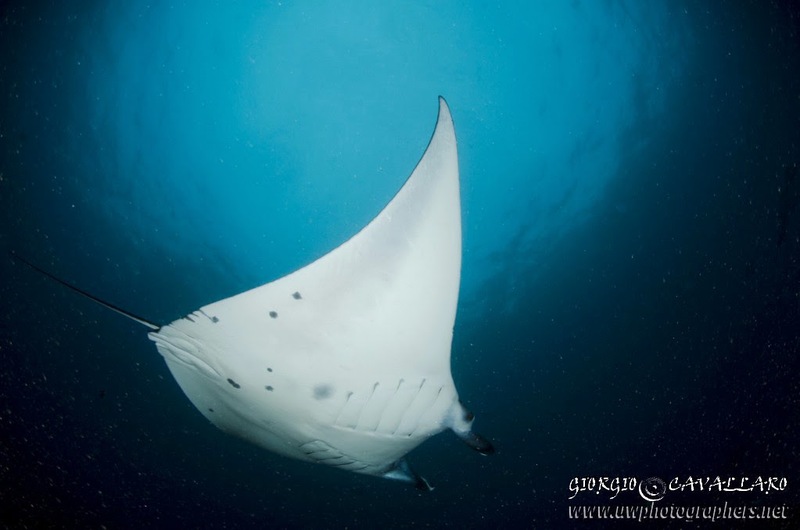 The manta point is just six meters deep but once there we are disappointed to note that there is not any manta... we therefore move to a slightly deeper point and suddenly... one manta is there! 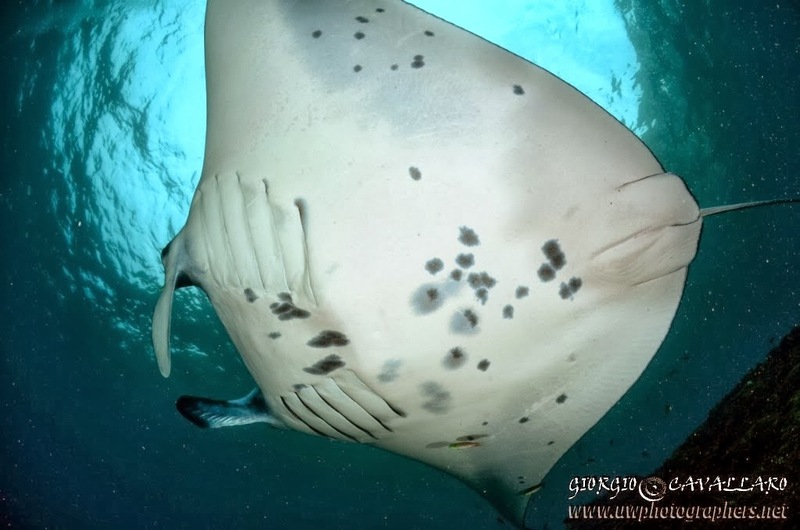 While we are taking pictures of the manta we noticed two octopuses mating and this is a very interesting spectacle and once the "show" is finished we go back to the manta point... and we finally see three other mantas floating in front of us! 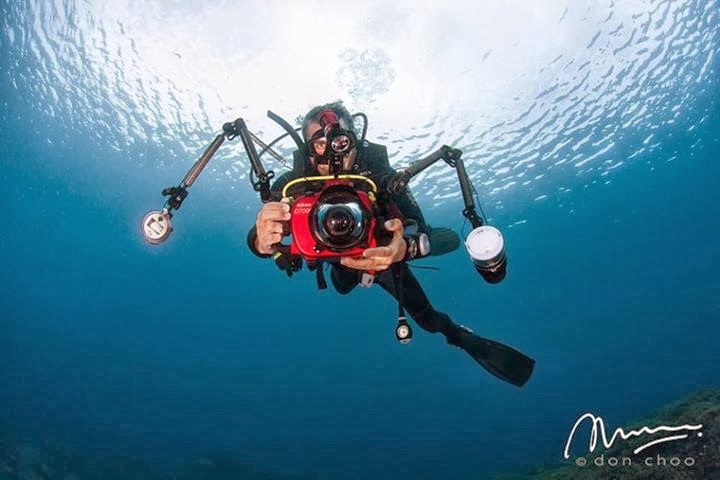 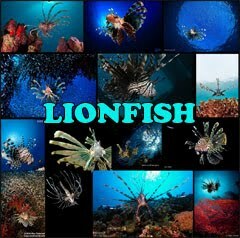 In the boat that brings us to Nusa Penida, I meet a good underwater photographer "Don Choo" of Singapore, with which we share these beautiful diving. The second and third dive offer us incredible quality coral of any kind and dimension... the landscape surrounding us seems unreal.